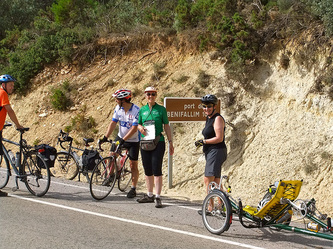 This tandem tour was a last minute venture undertaken to get out of decorating the hall of our bungalow, which we intended to do during September and after running our Cycling New Forest Autumn events. 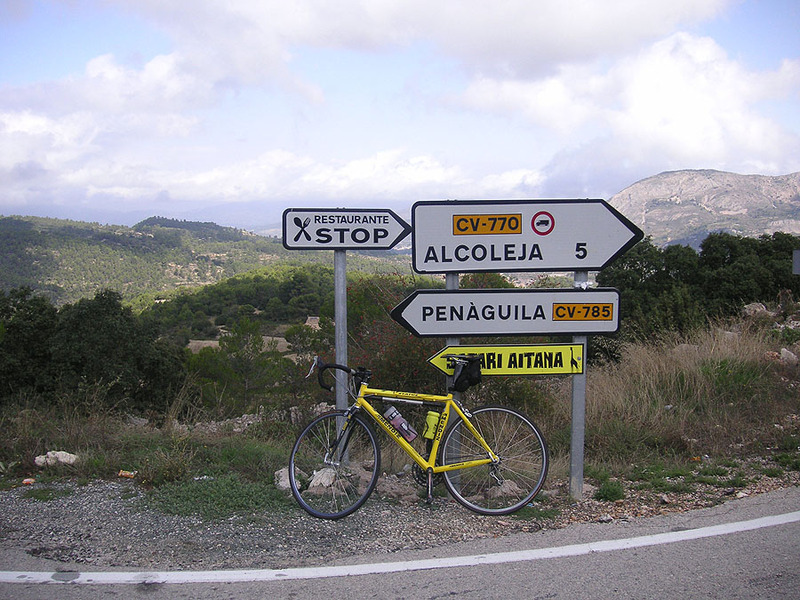 When it came to it, making a last minute decision to go cycling instead somehow just seemed a more attractive alternative. 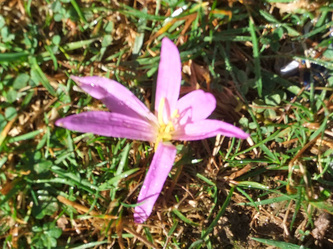 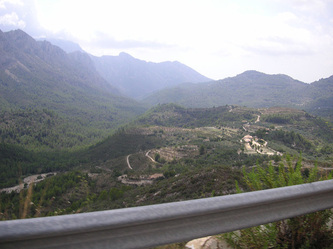 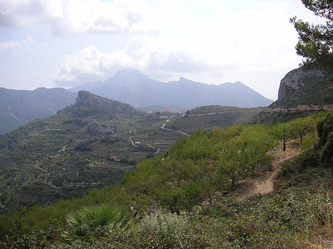 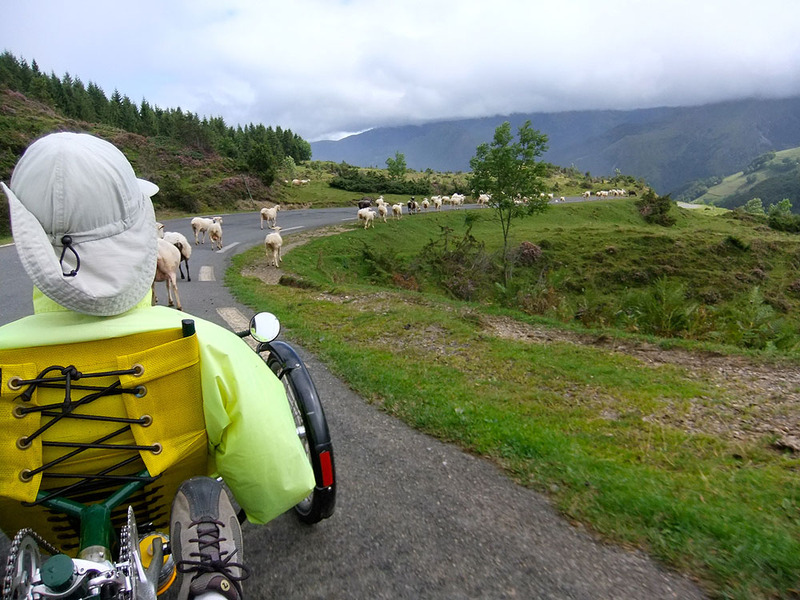 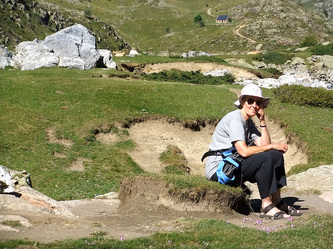 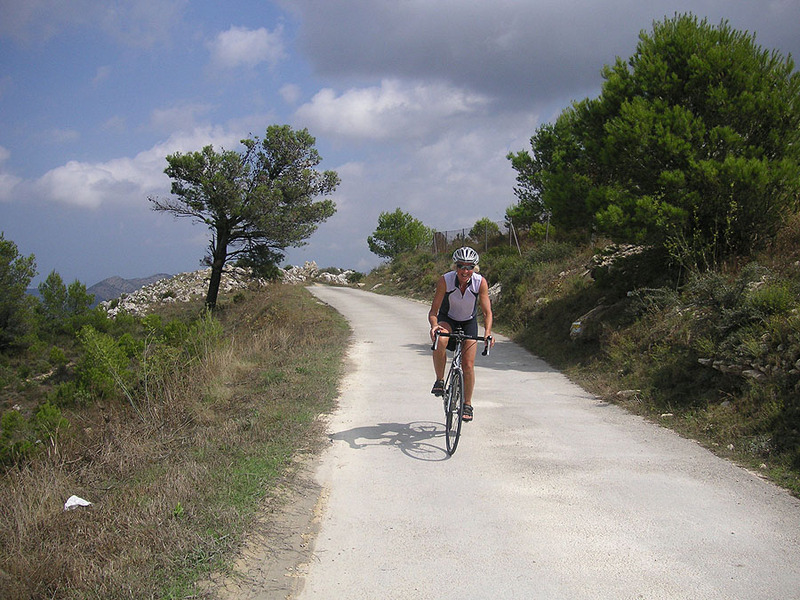 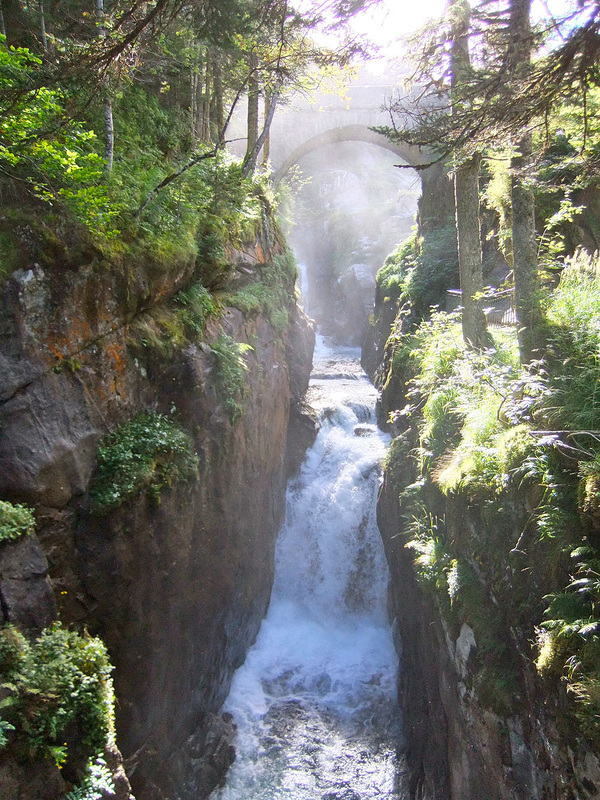 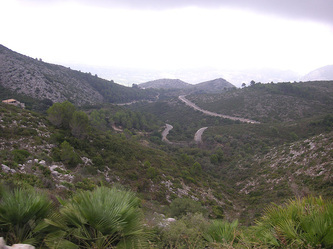 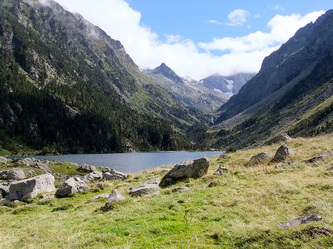 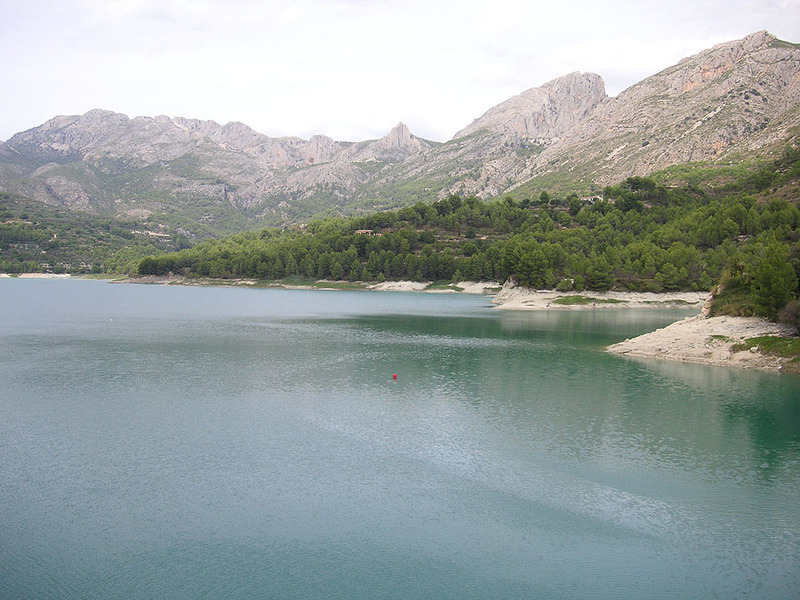 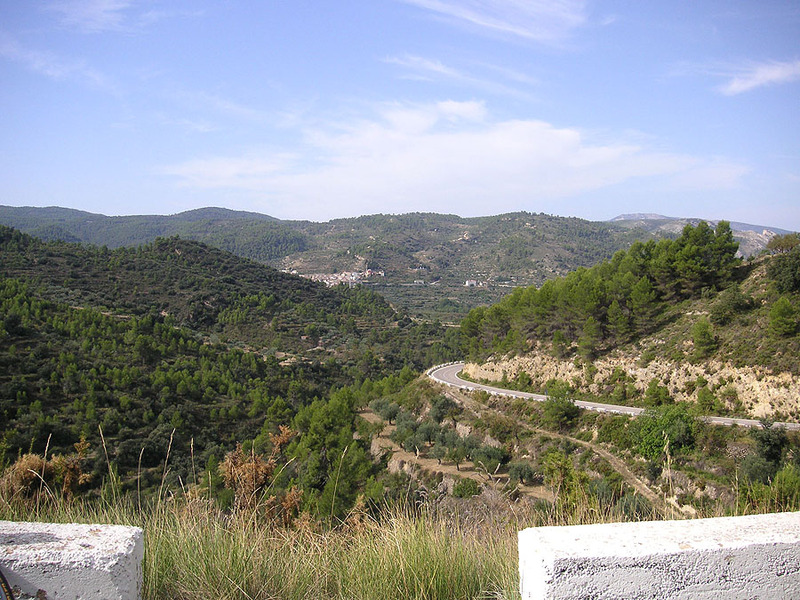 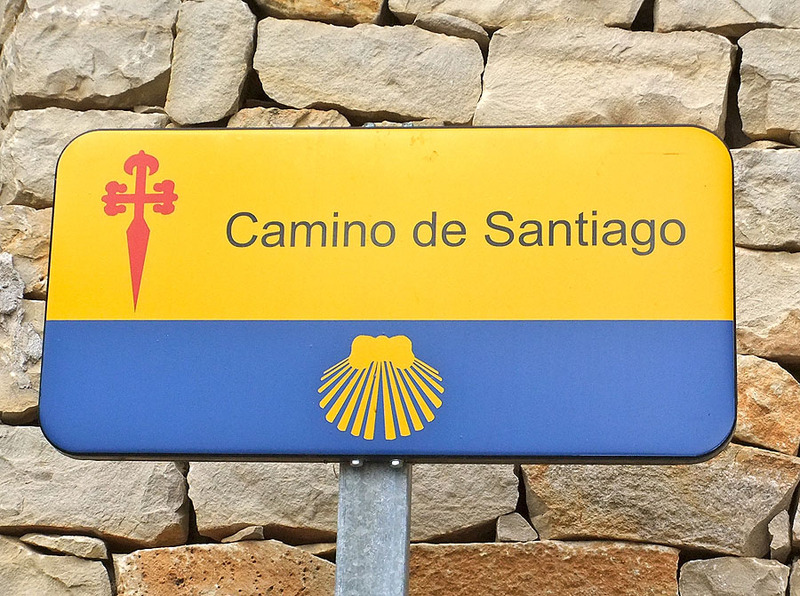 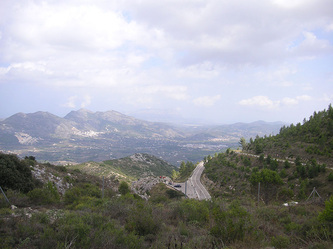 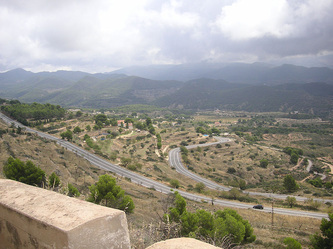 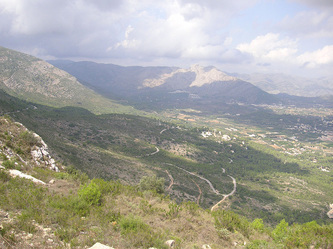 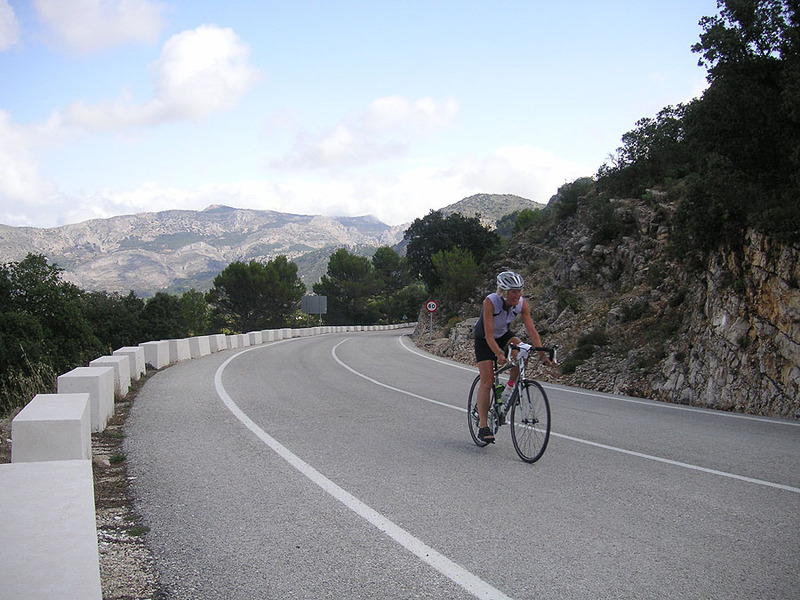 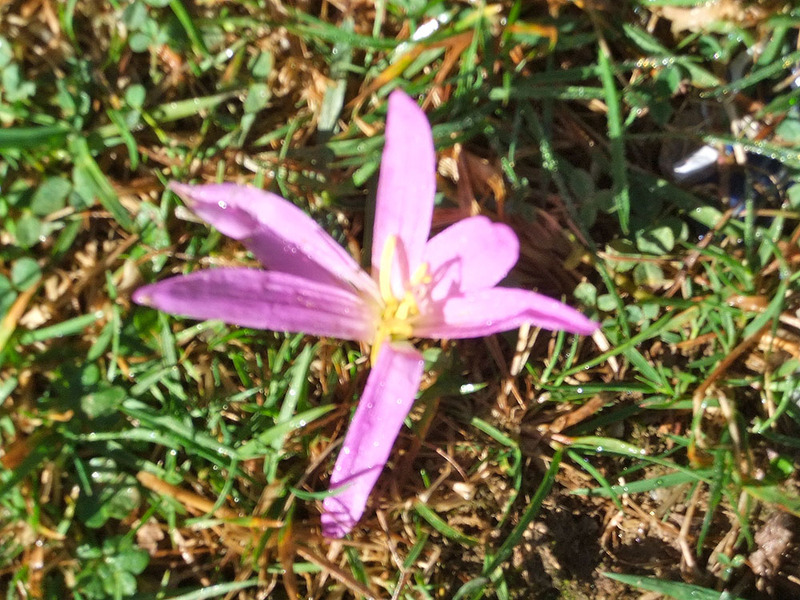 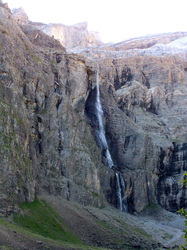 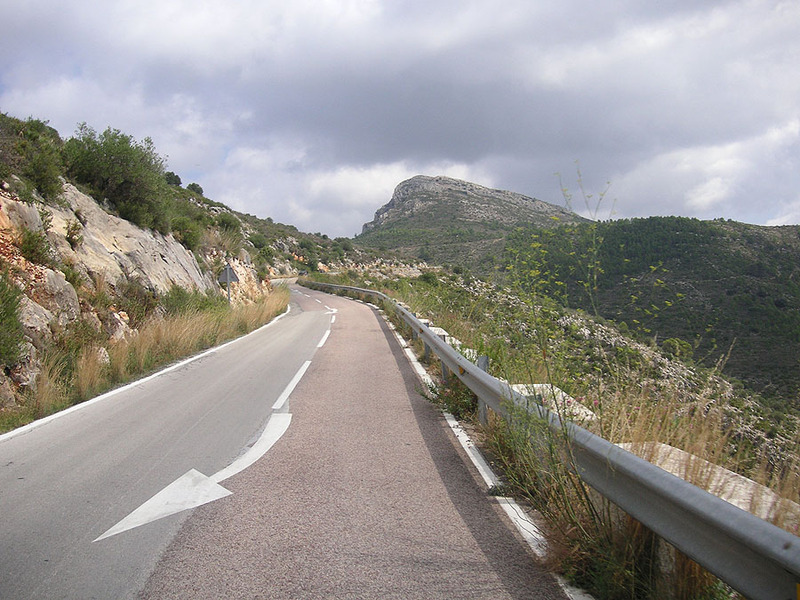 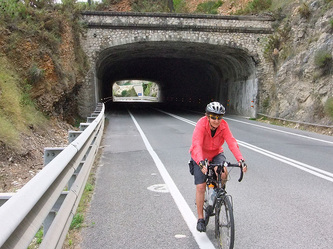 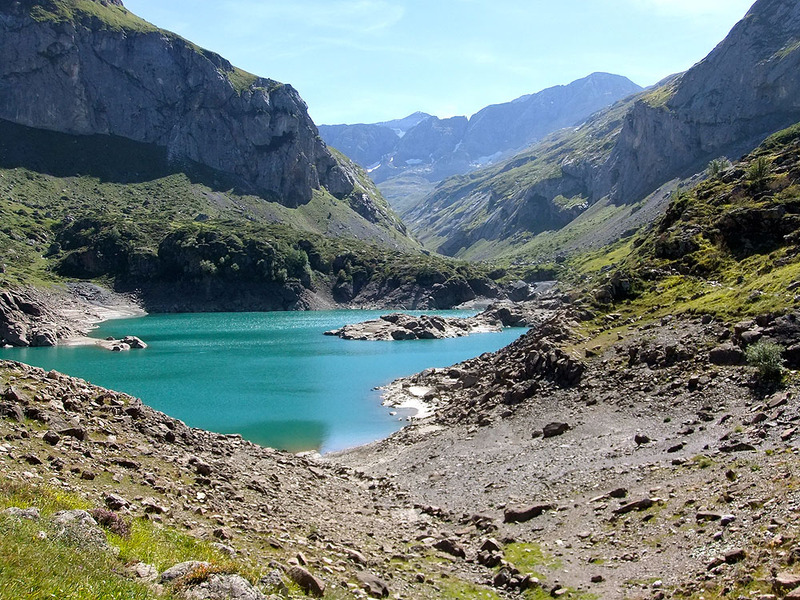 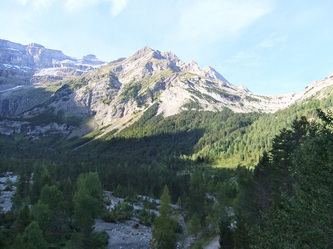 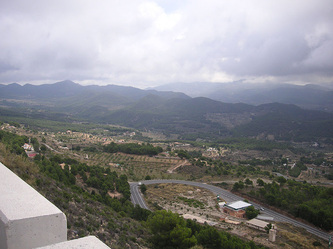 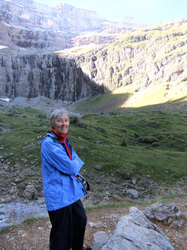 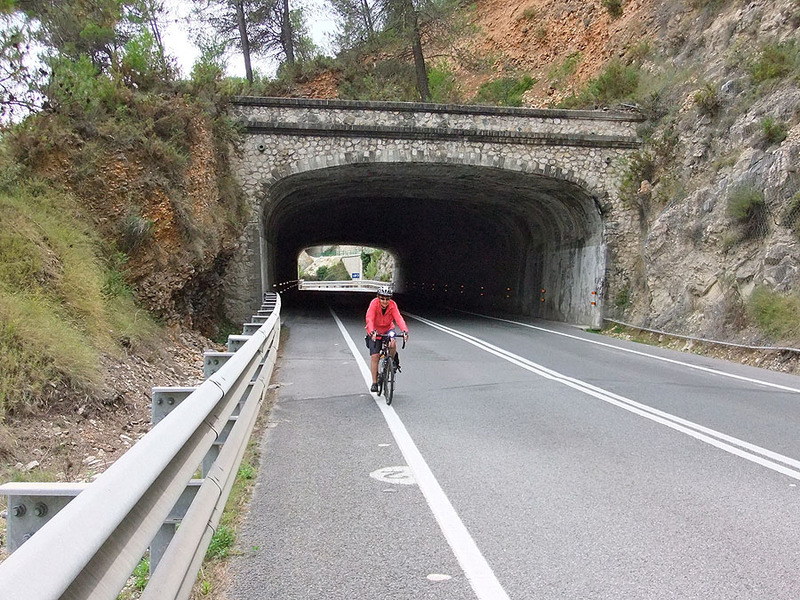 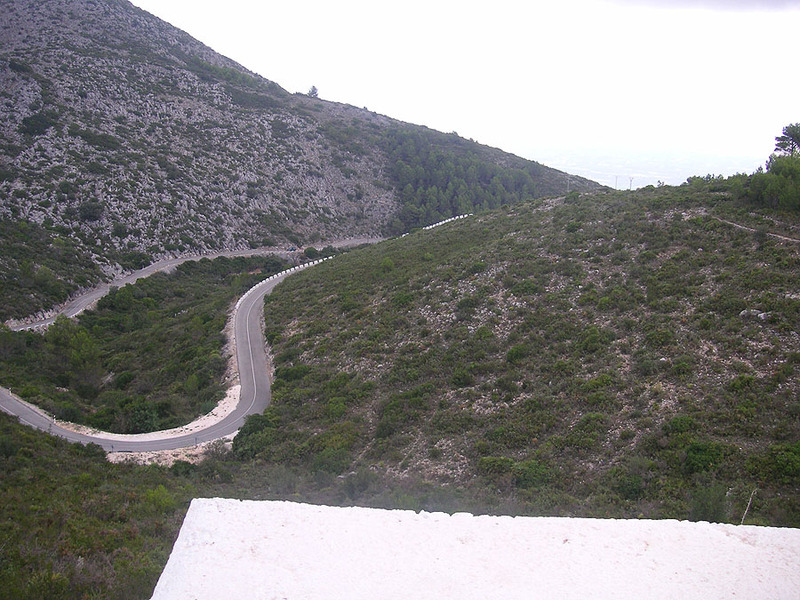 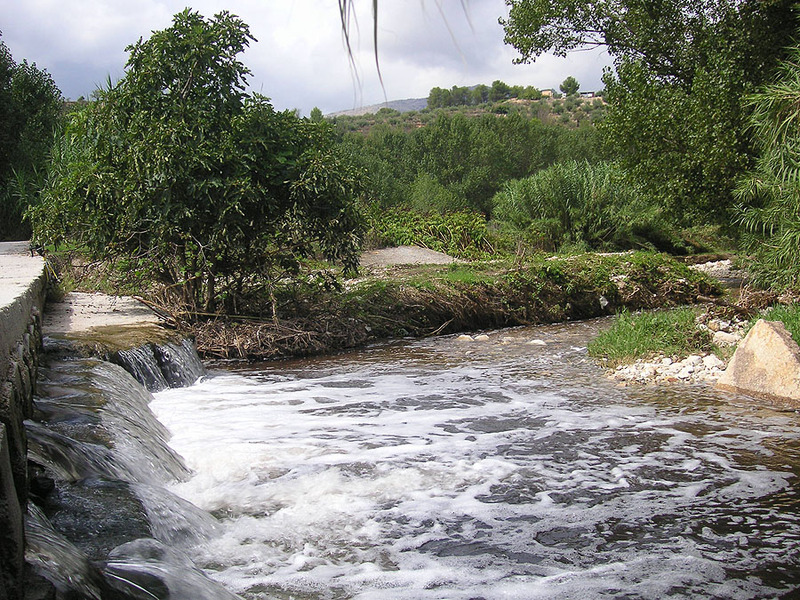 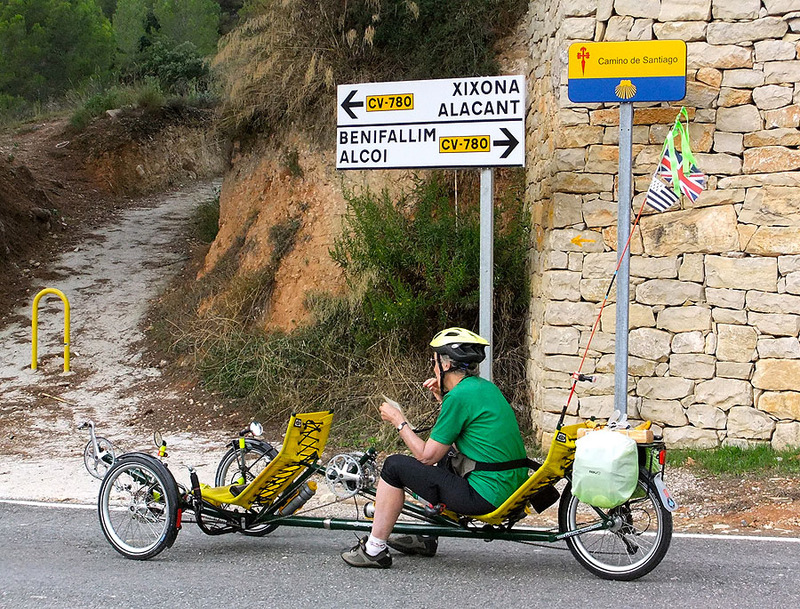 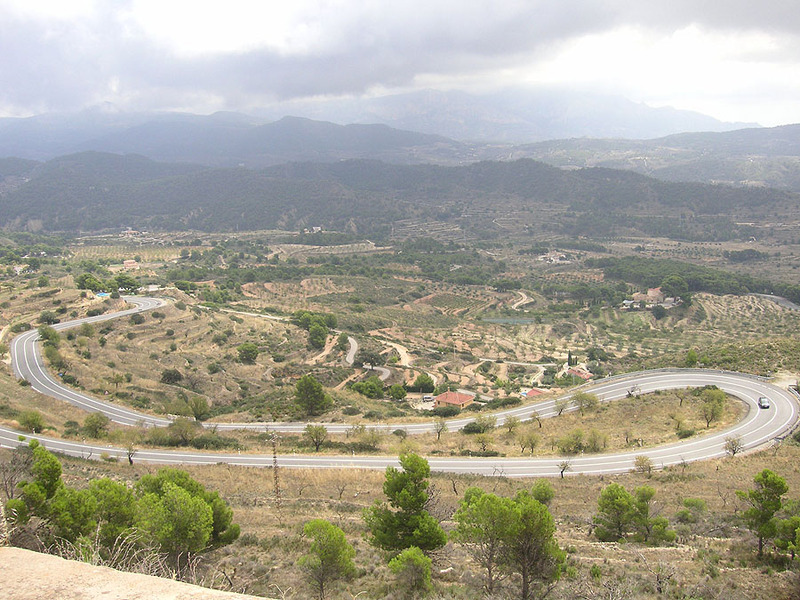 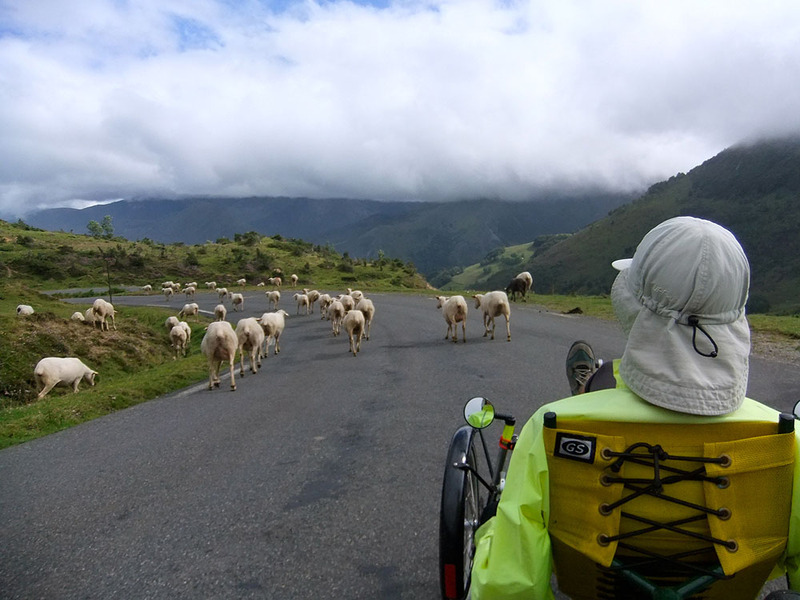 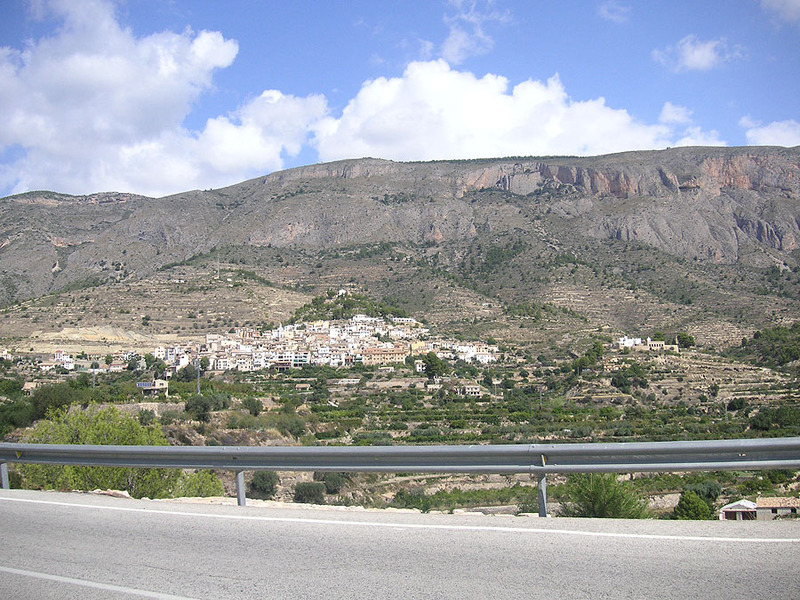 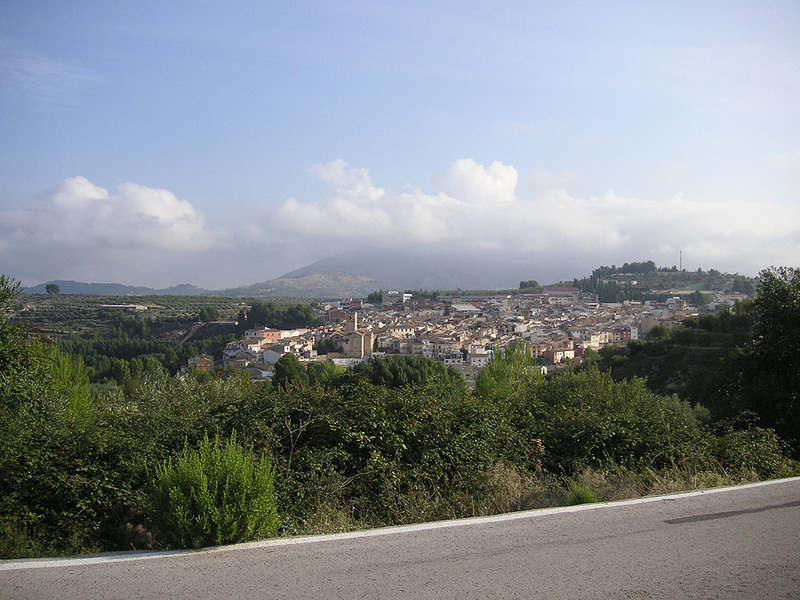 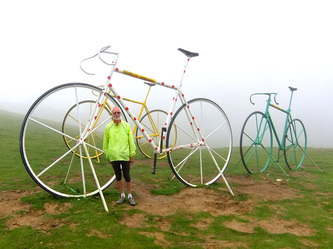 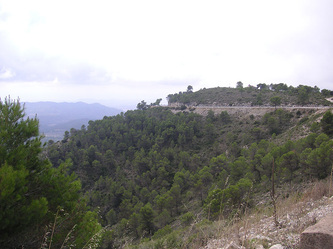 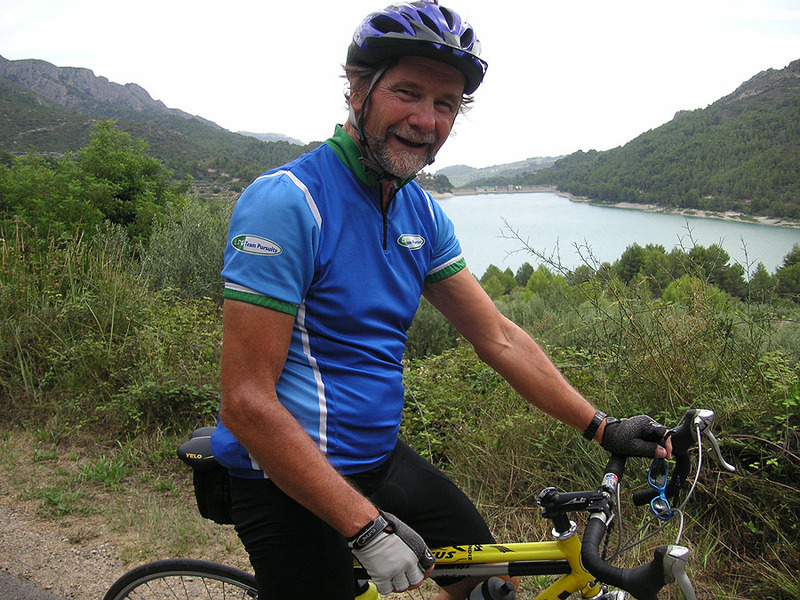 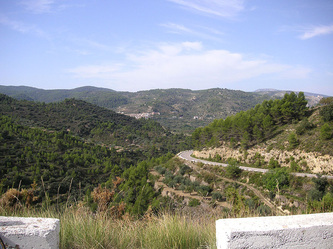 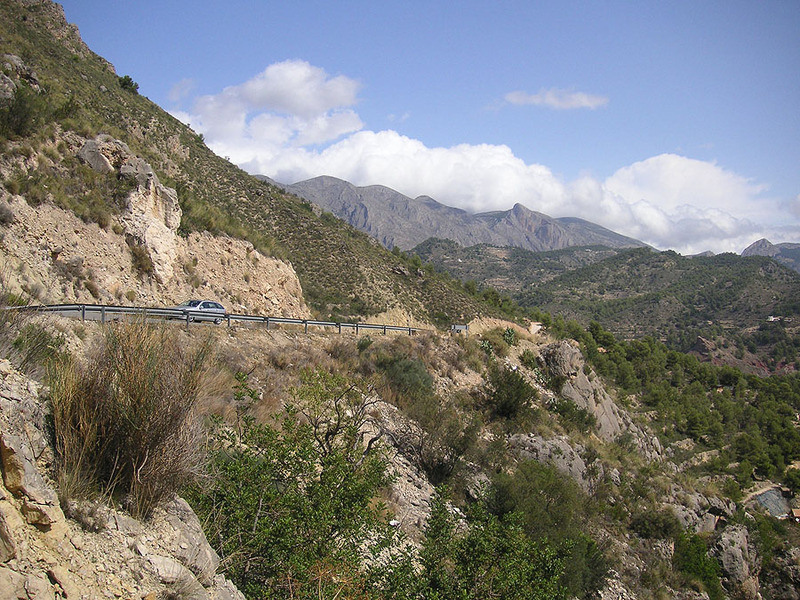 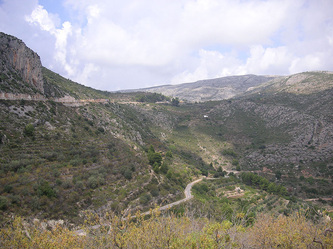 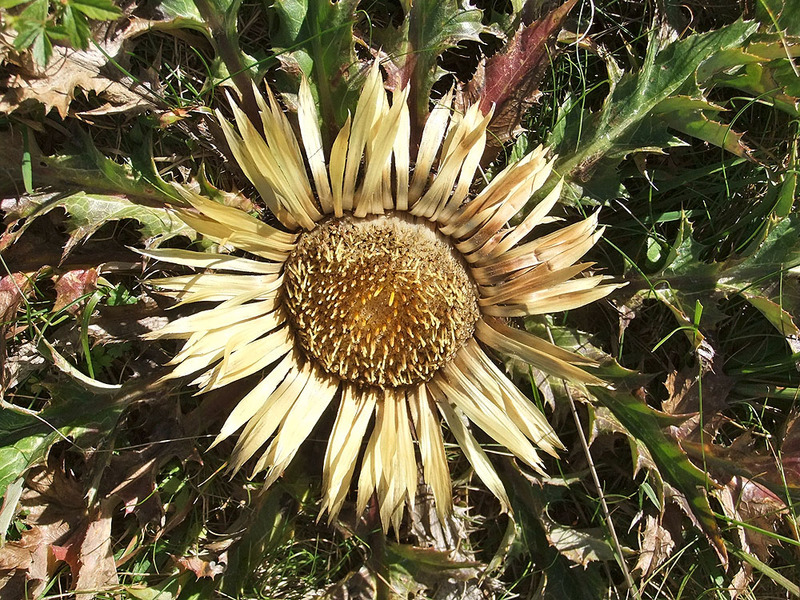 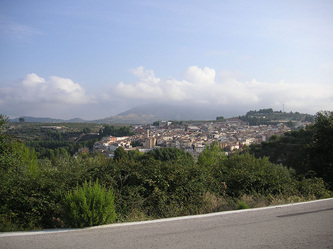 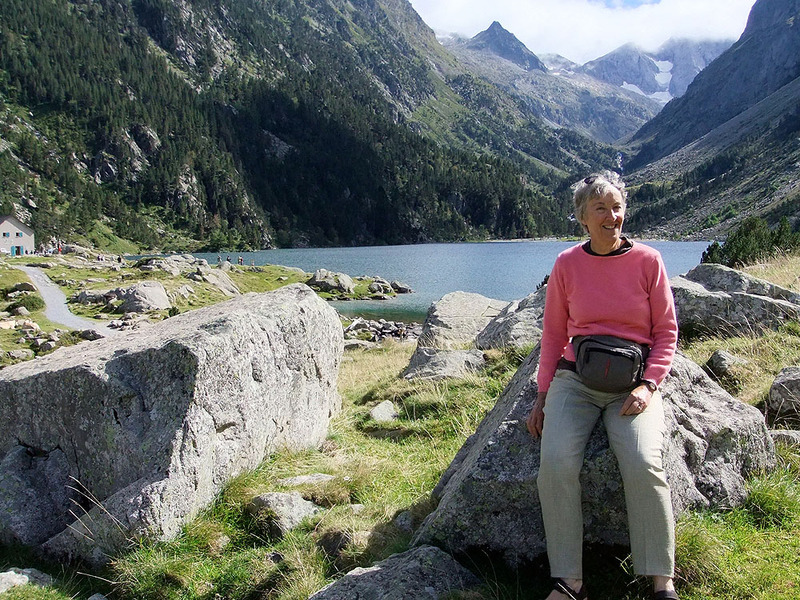 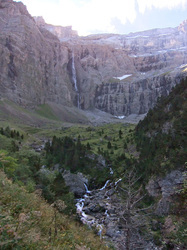 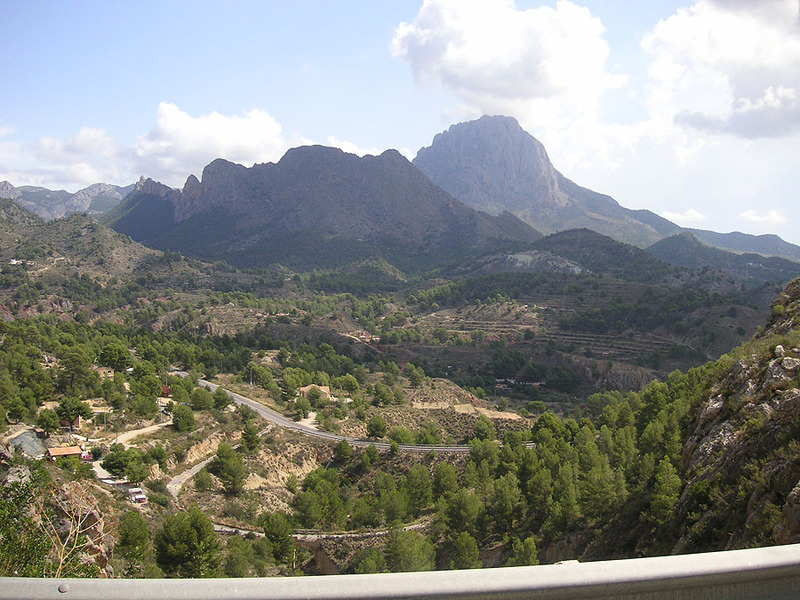 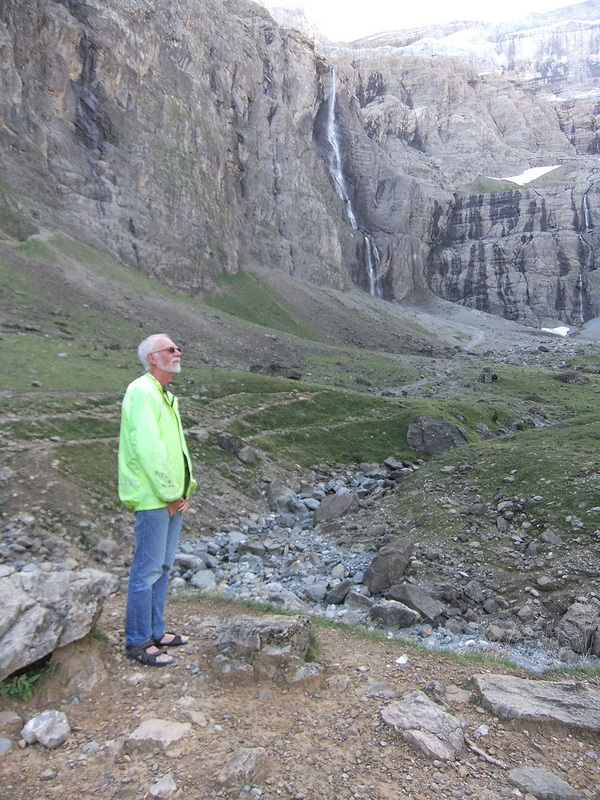 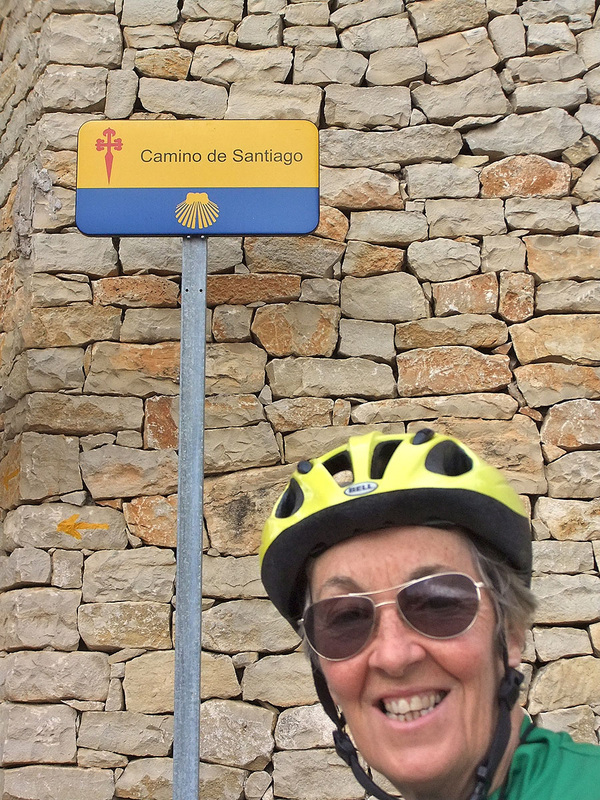 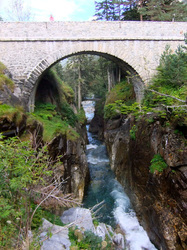 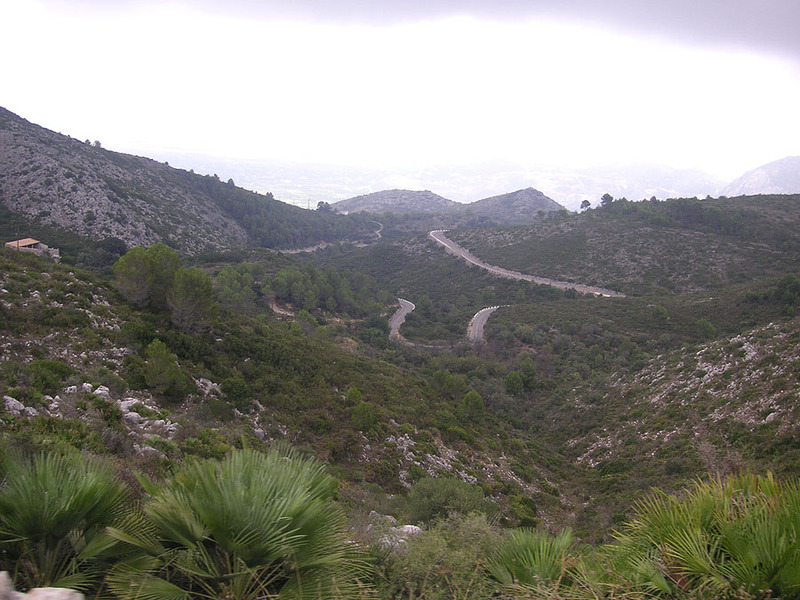 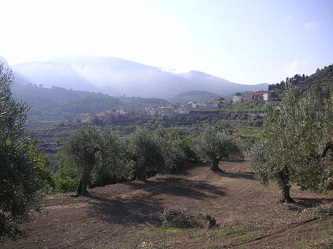 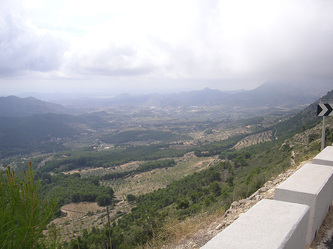 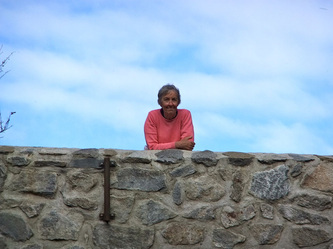 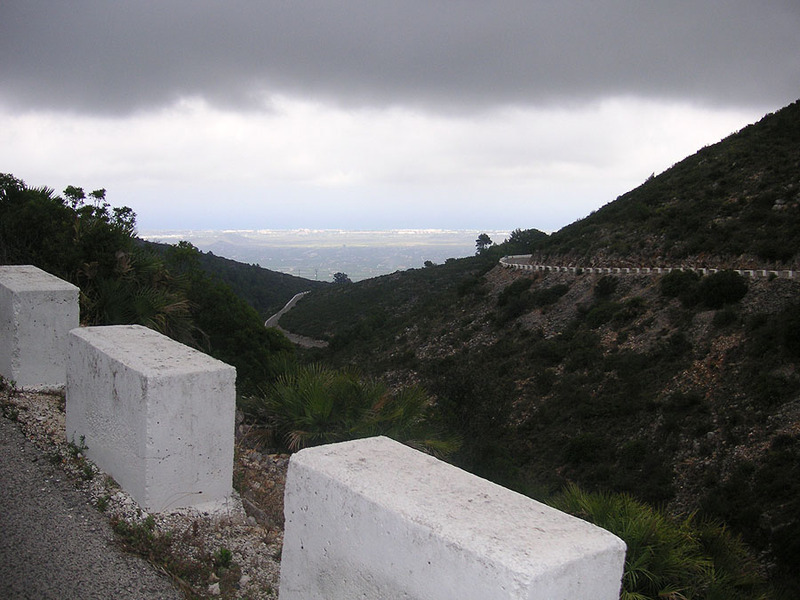 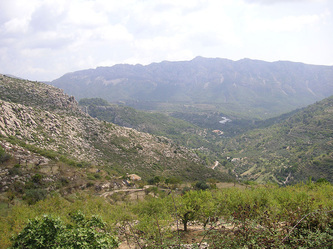 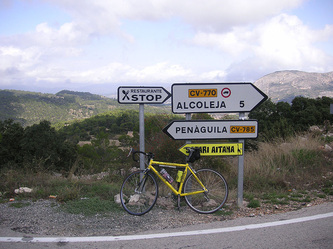 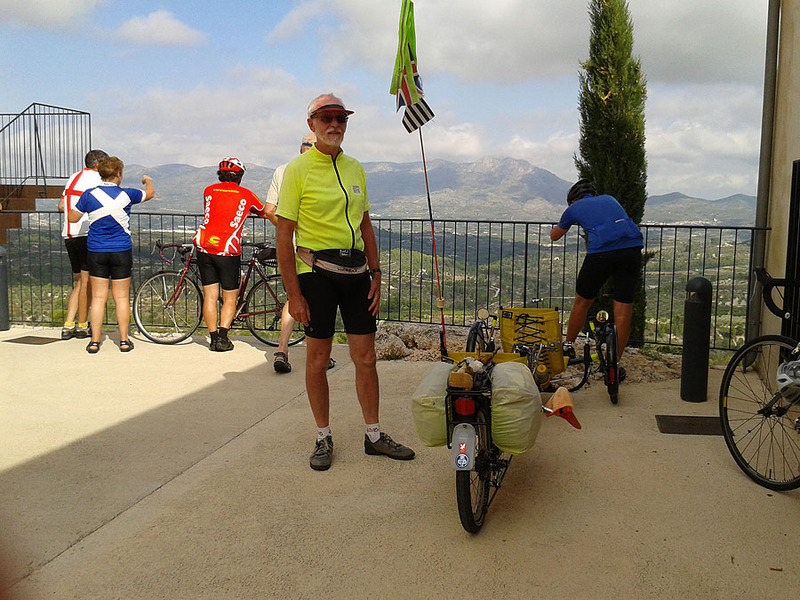 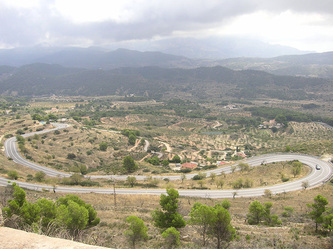 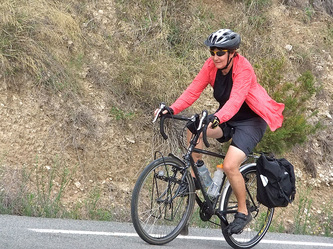 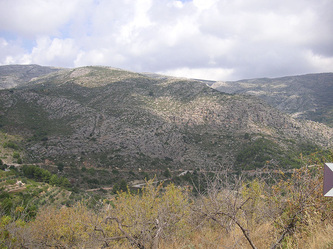 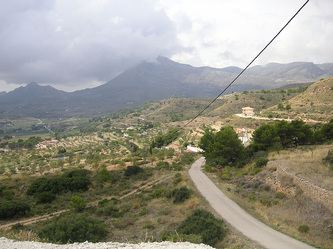 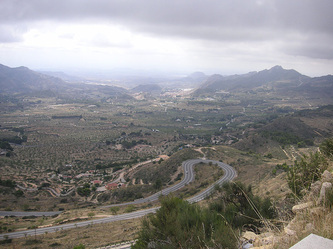 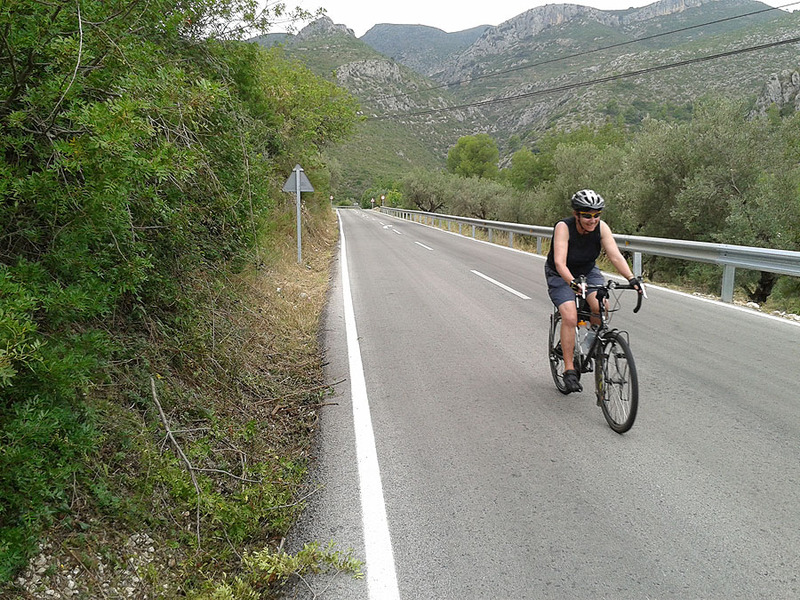 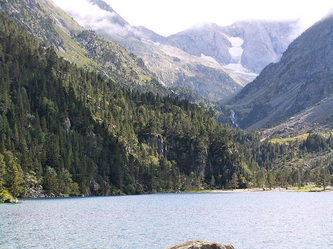 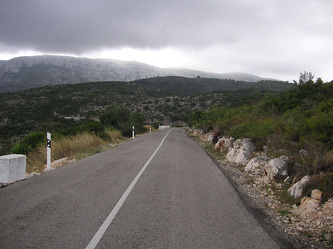 So Sheila set to sorting out transport, accommodation and a late booking for a CTC holiday, staying in Cocentaina in the Sierra Mariola; and cycling deep into the Sierra Aitana through remote hilly landscapes unchanged for centuries. 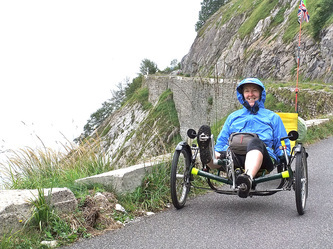 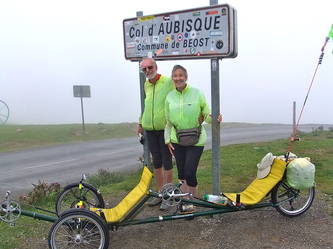 No problems - Managed to pack all of the pieces of “Gertie Greenspeed” our recumbent tandem trike into the car without forgetting pedals or other loose bits of kit and arrived at the ferry port with lots of time to spare. 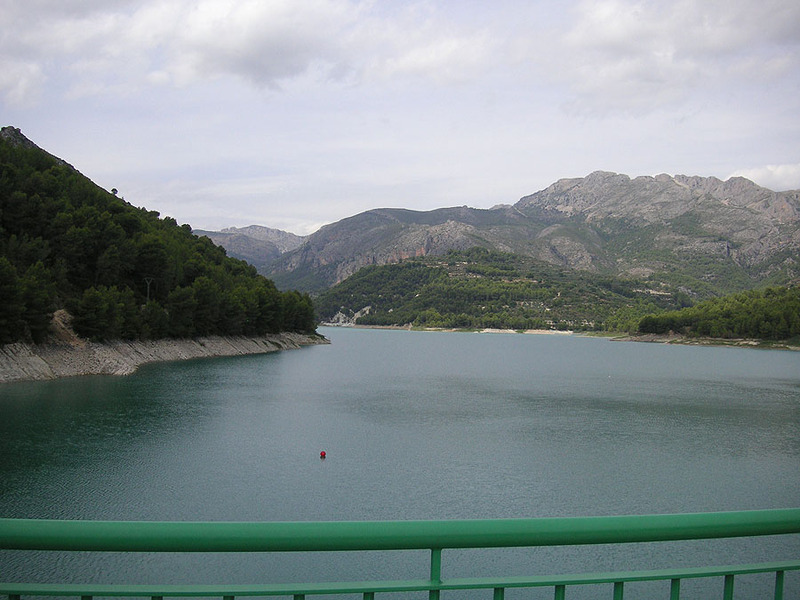 This was our first crossing of the Bay of Biscay and we were blessed with a calm, glassy sea. 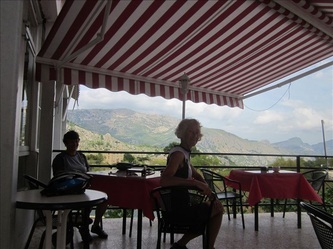 The 'posh' on board restaurant seemed to be the only hot food option on board, with a system of table pre-booking designed to maximise queueing. 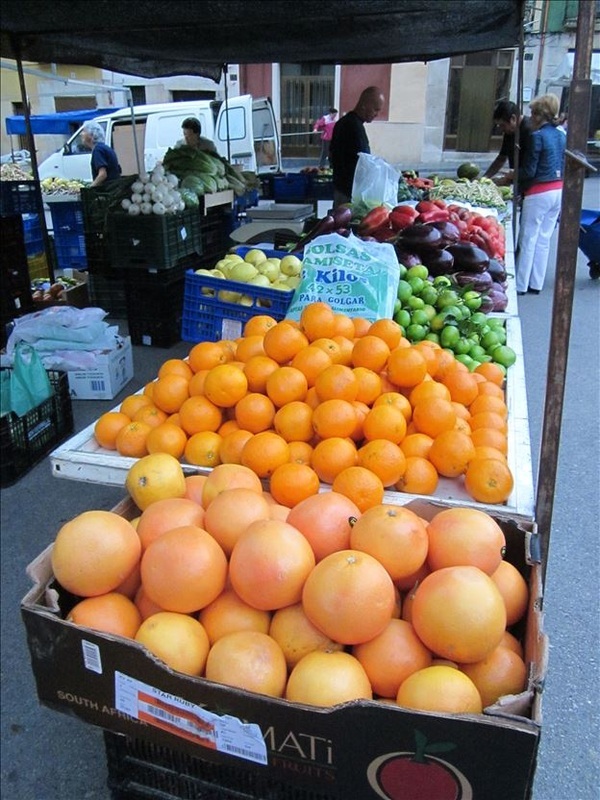 We discovered later that it was possible to buy pre-prepared food in the ship's shop and then DIY microwave it in various microwave ovens scattered around the ship. 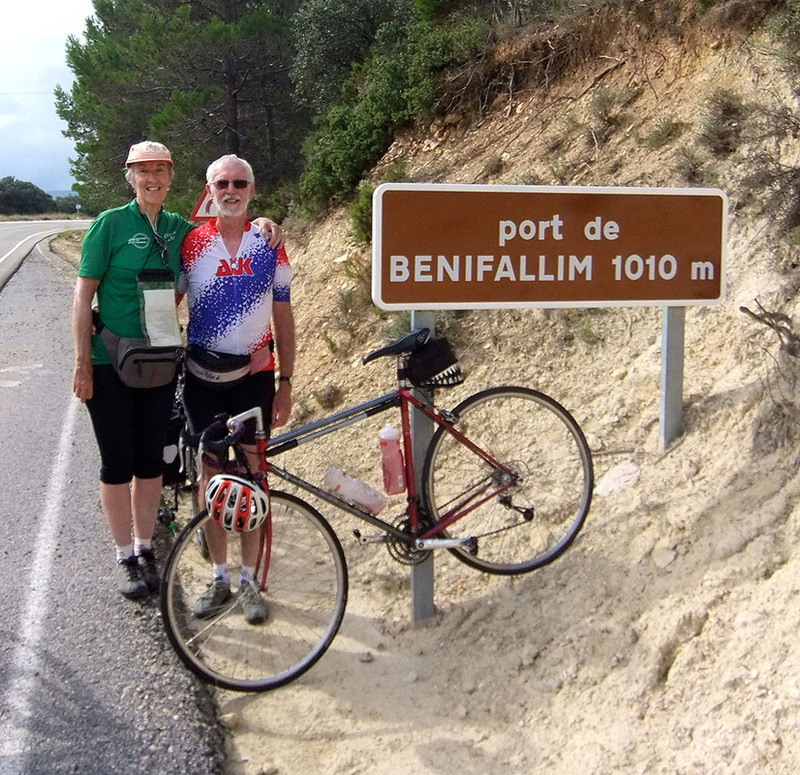 Overall the journey went well, but it confirmed our long felt belief that sea cruising is most certainly not even on the bottom of our holiday wish list. From Bilbao we made a false start by getting onto the wrong motorway lane on the run out of Bilbao, which whisked us into the mountains and a brand new and very long tunnel, for which we had to pay a toll at the exit; and following which it was quite some distance to the first motorway junction where we could escape and make a circular journey back to the ferry port for a second attempt. 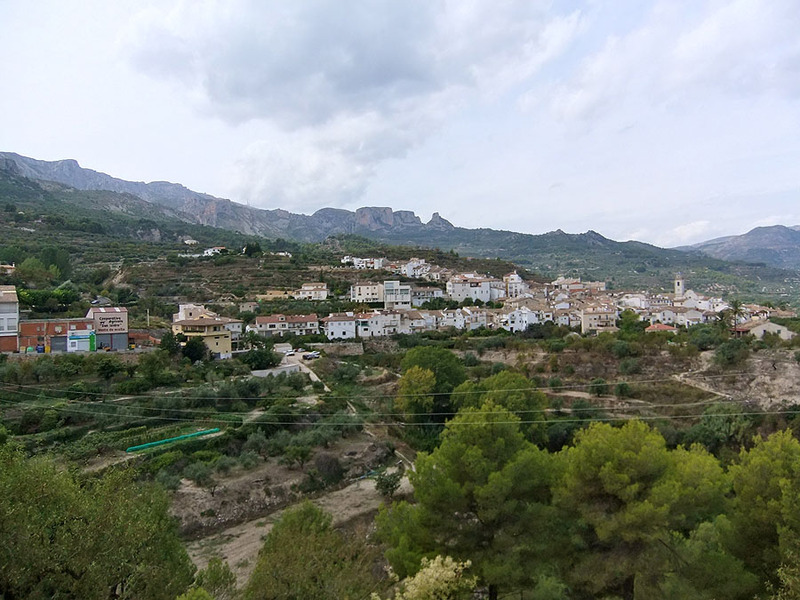 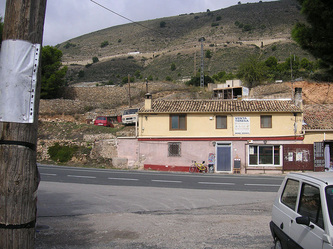 All went well this time as we headed out into the countryside and drove over the Sierra de Cebollera, stopping for the night at the tiny Posada de Urreci, a rural inn in a mountain village, Aldeanueva de Cameros. 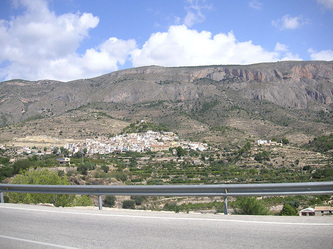 The village has four permanent residents during the week (three being the couple running their inn and their small son), but the population apparently “swells” at weekends. 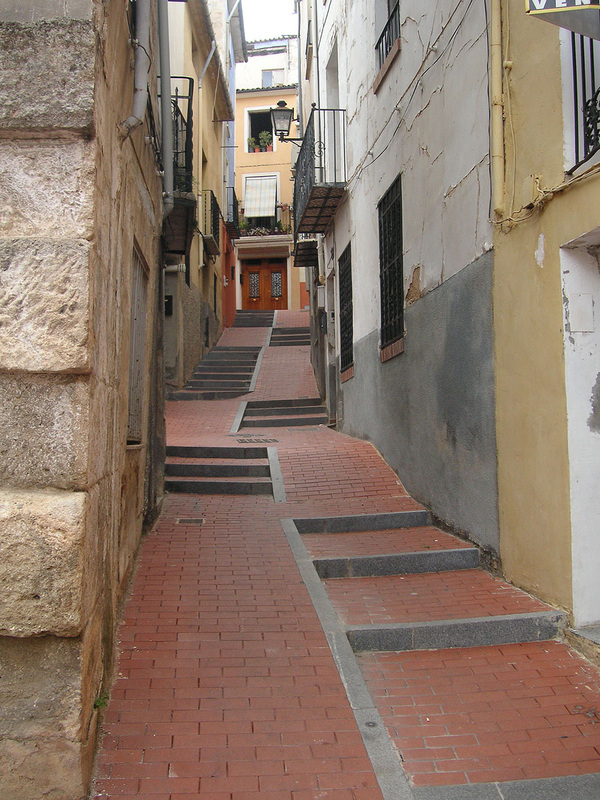 Cars have to be left at the entrance to the village, whose narrow cobbled pathways wind up and down between well-restored stone houses, some beside a tumbling stream with an ancient arched footbridge. 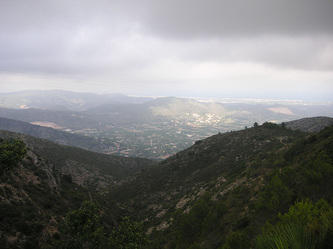 A spectacular thunderstorm added to the atmosphere. 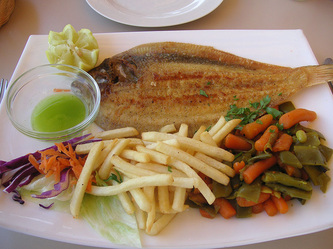 Supper was a slightly sparse affair though. 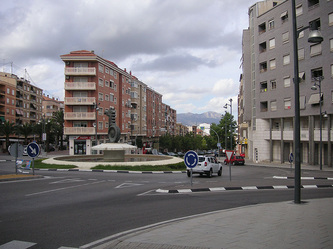 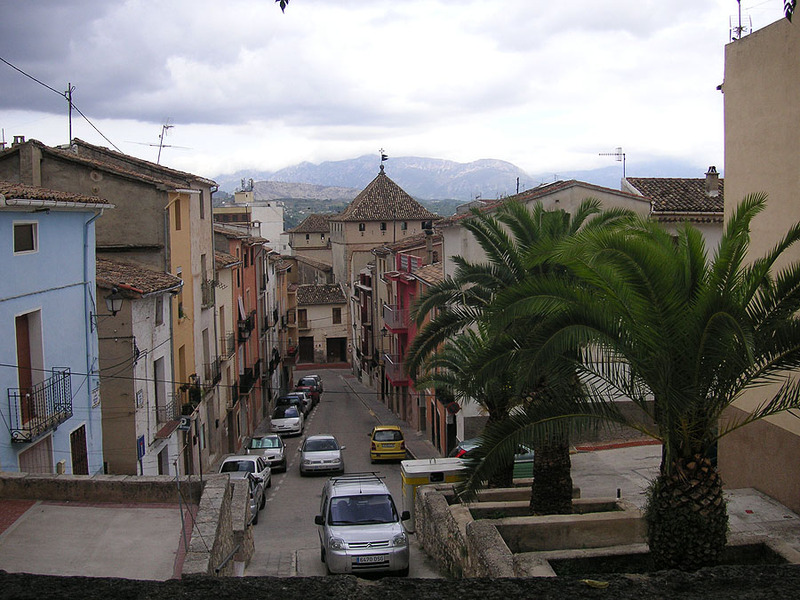 Then we had an interesting day’s drive right across central Spain, to Almansa, our Spanish twin town, for an overnight visit. 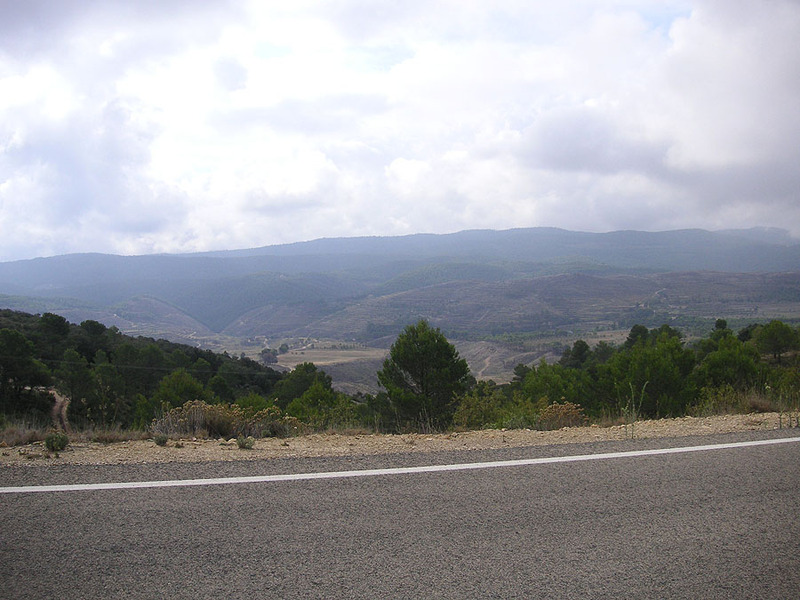 Fantastic empty roads much of the time, and wide open spaces. 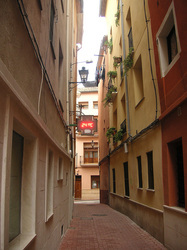 Staying at the modern Hotel Blu was a real contrast to the night before. 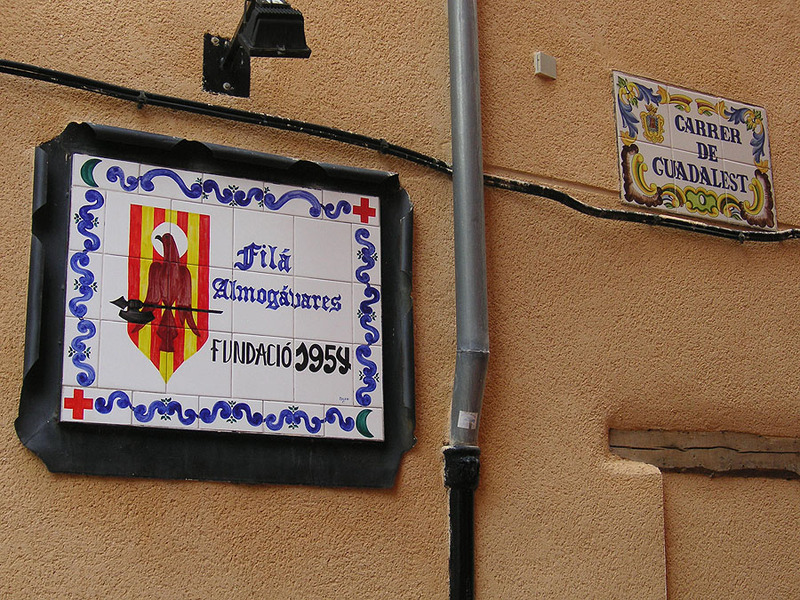 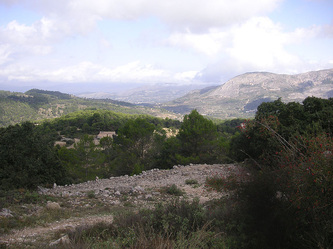 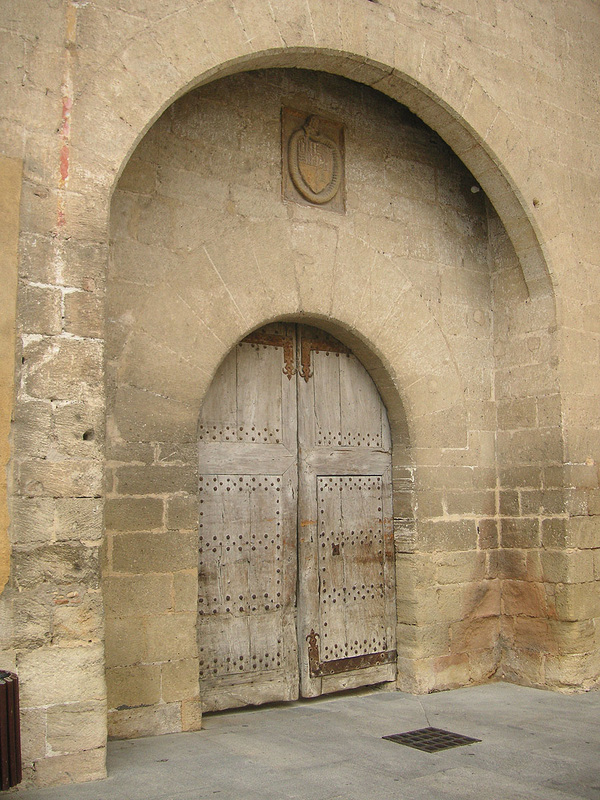 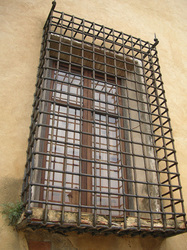 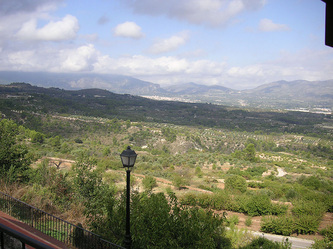 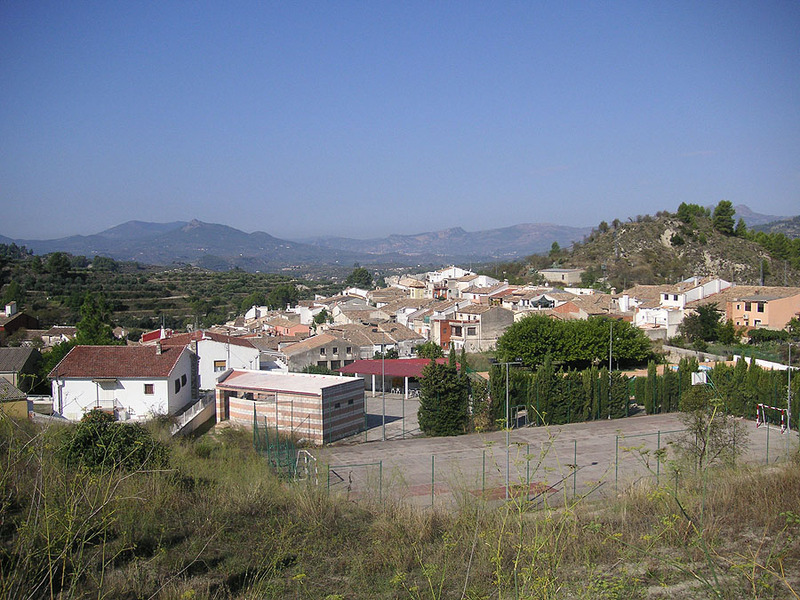 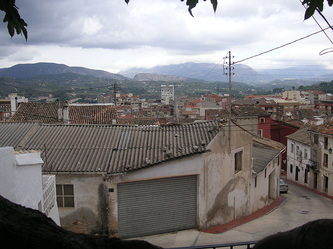 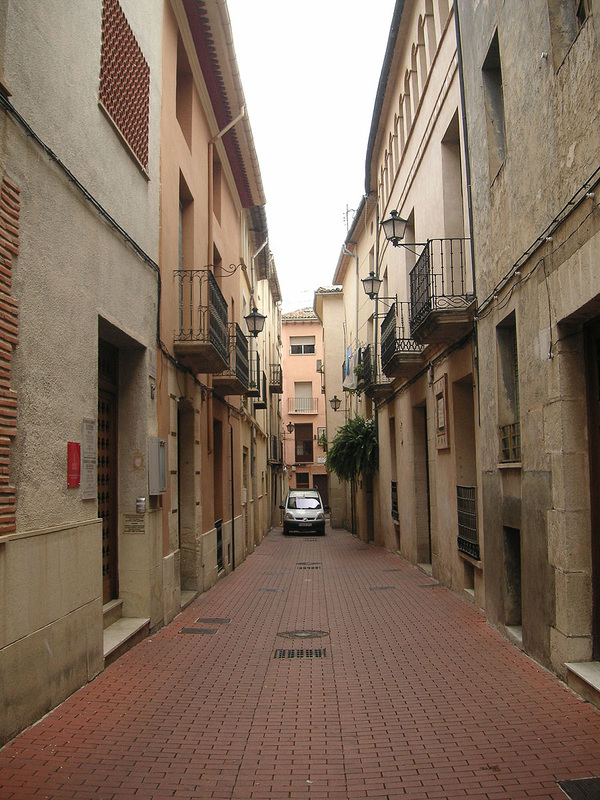 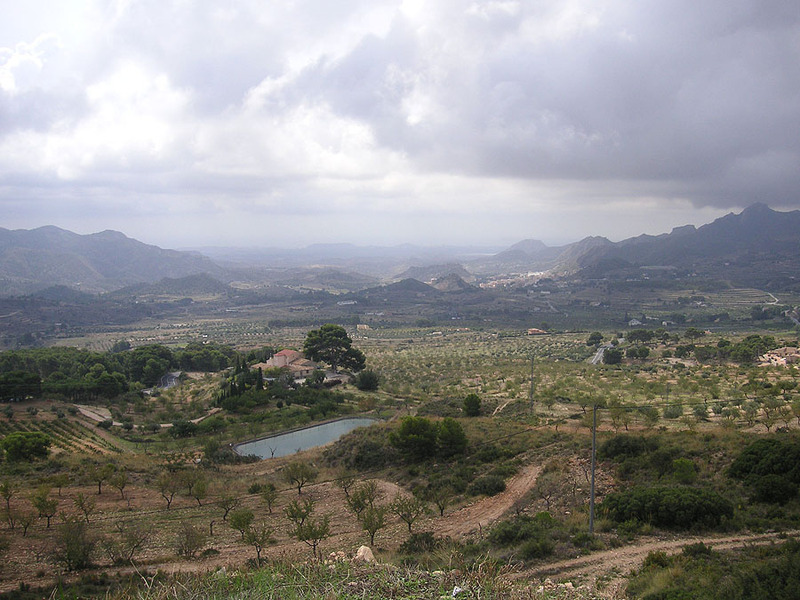 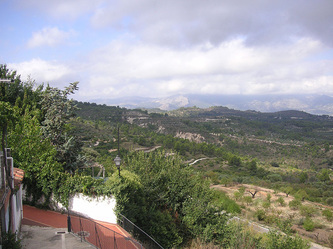 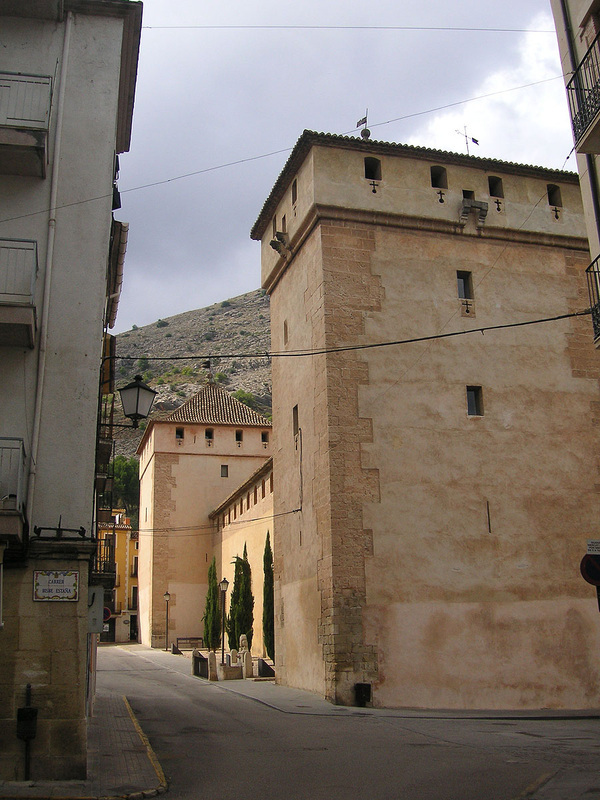 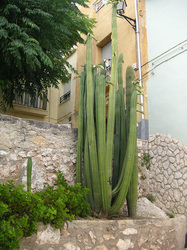 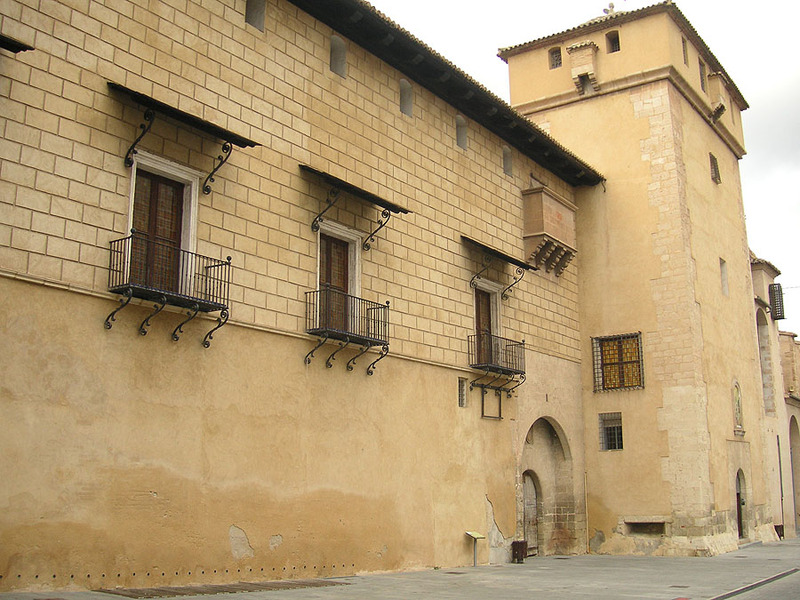 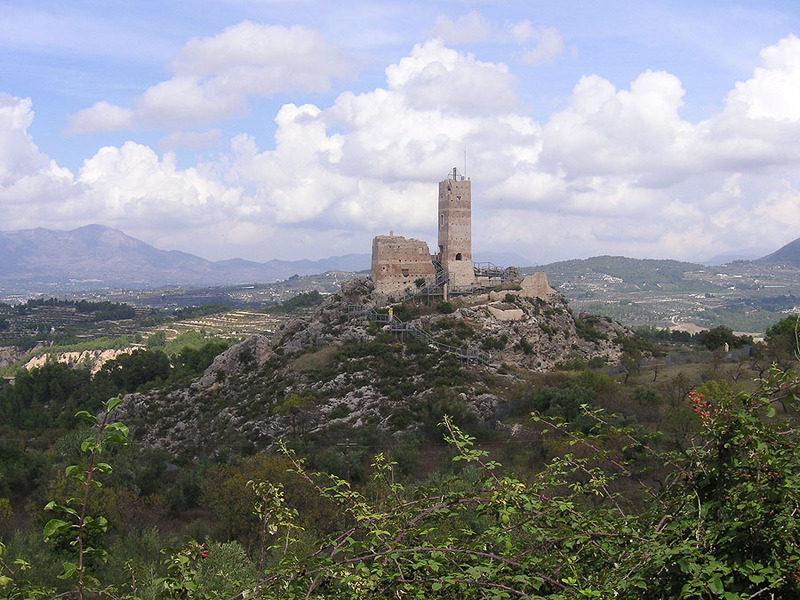 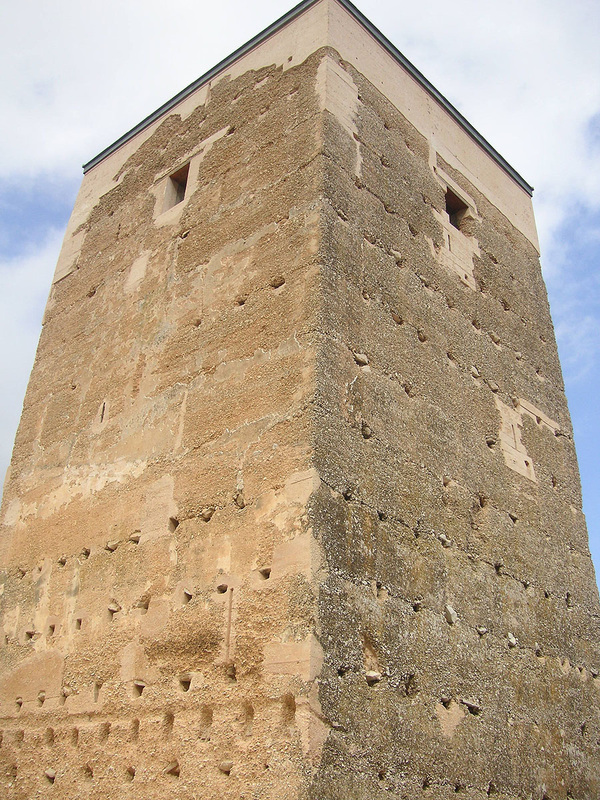 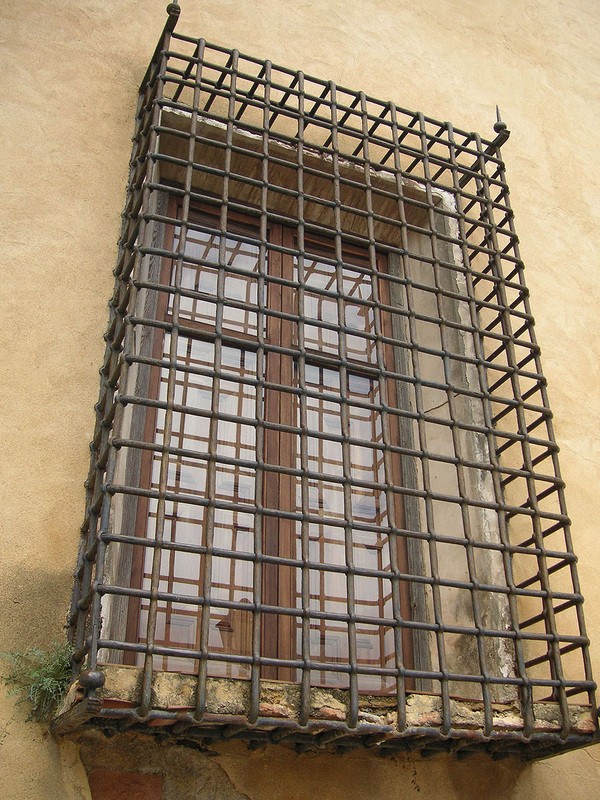 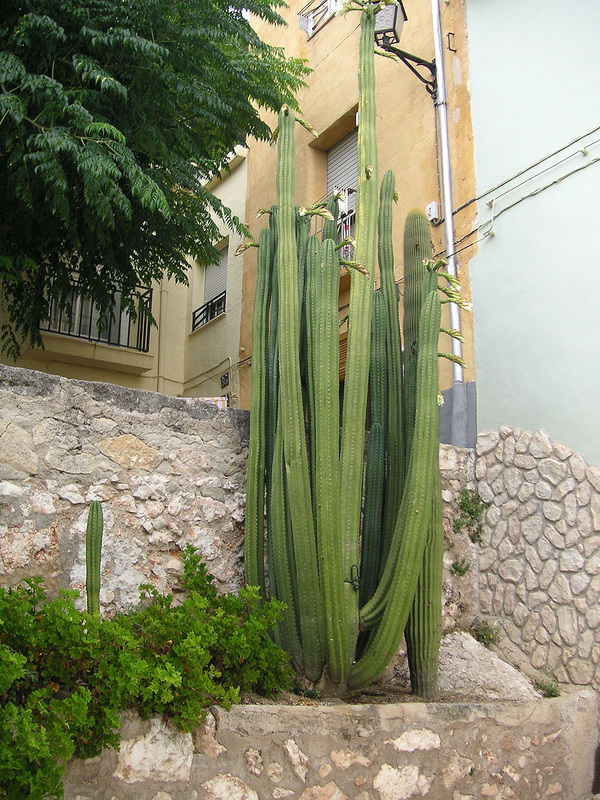 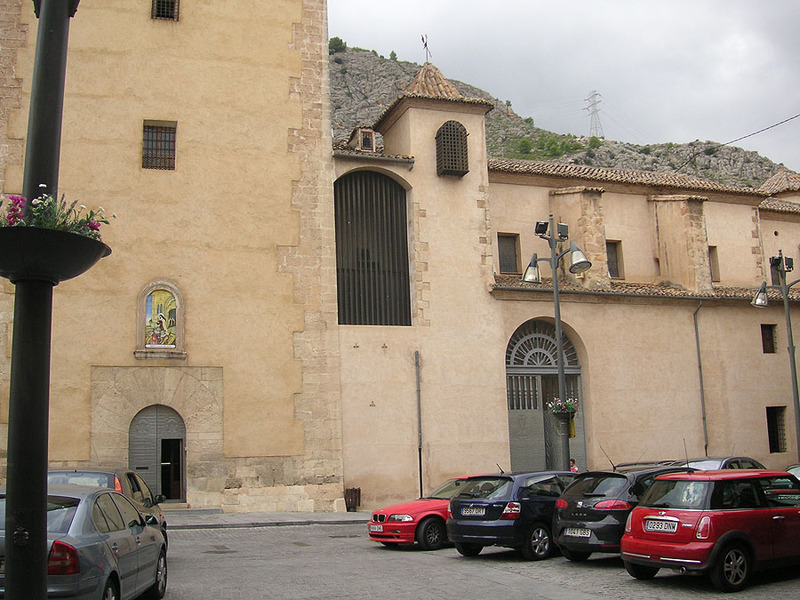 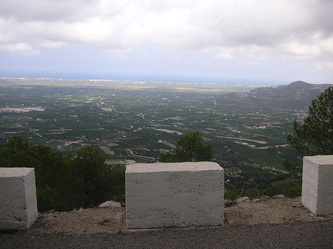 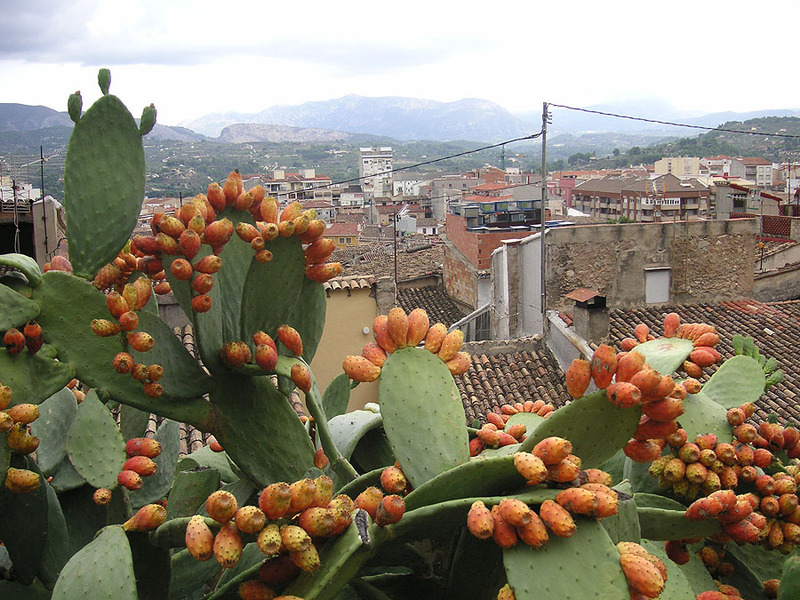 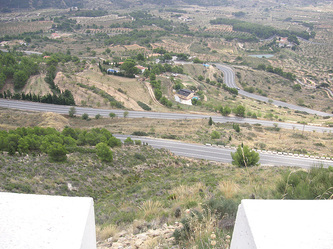 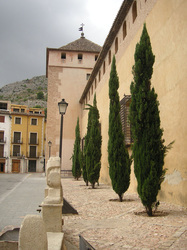 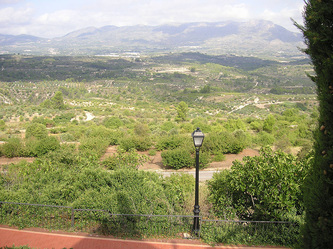 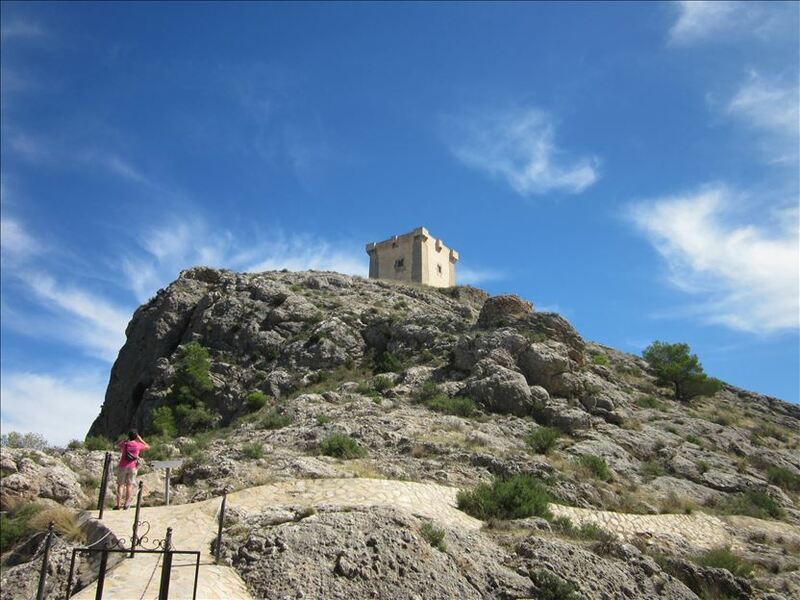 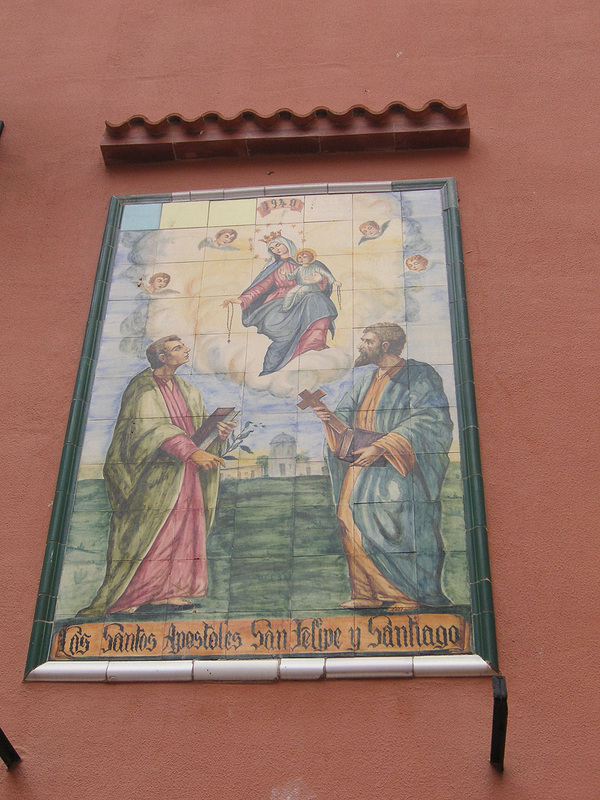 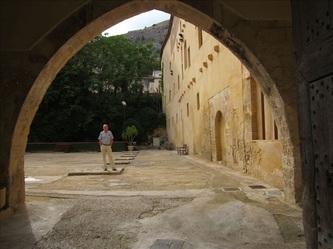 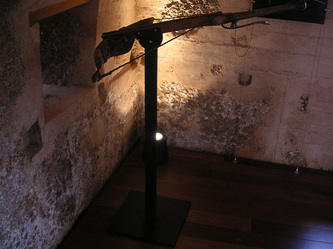 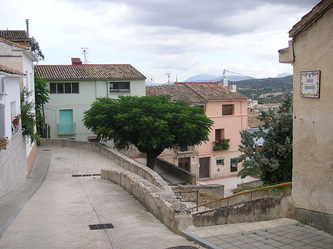 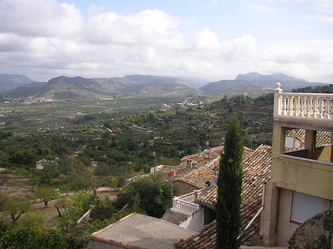 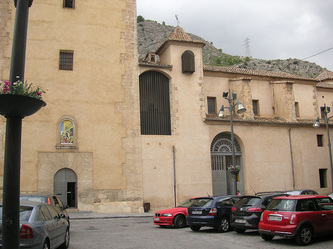 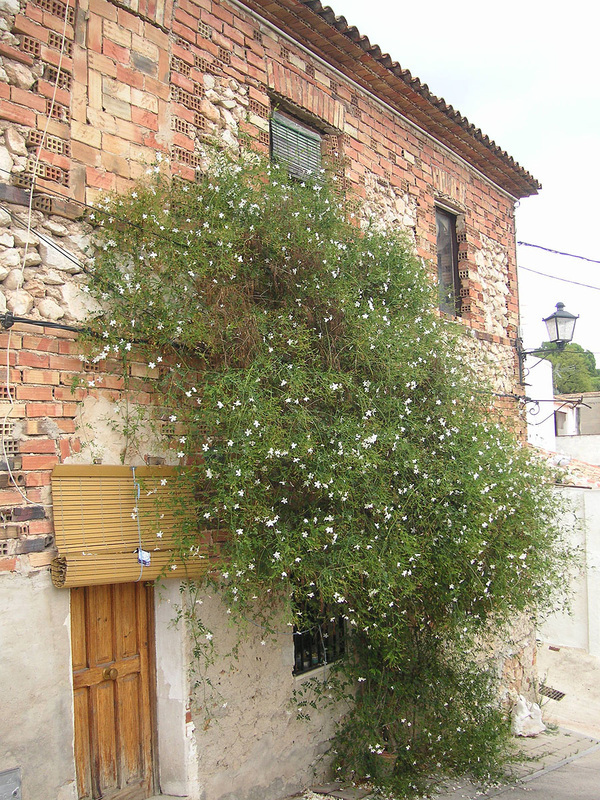 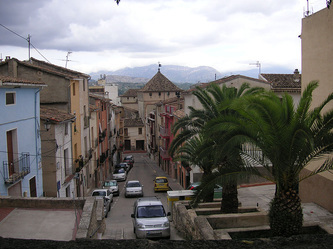 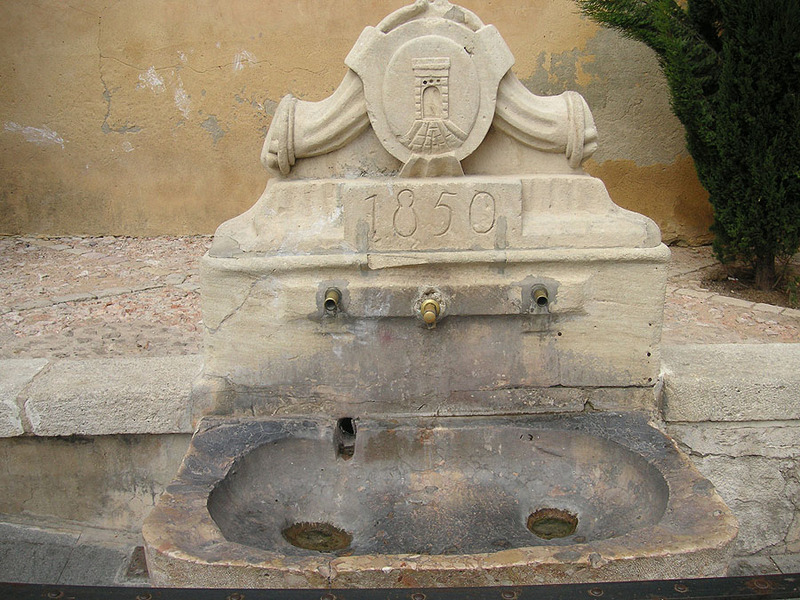 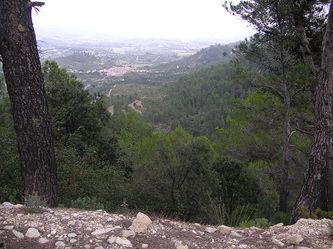 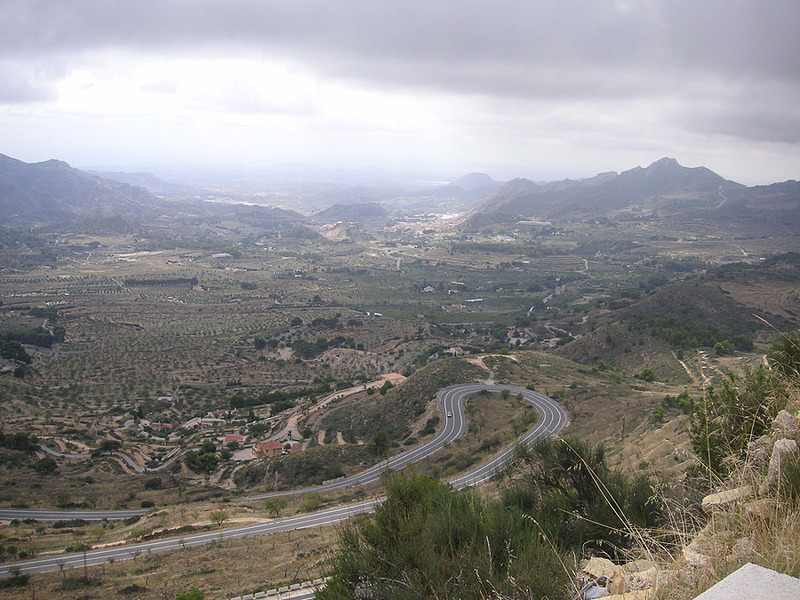 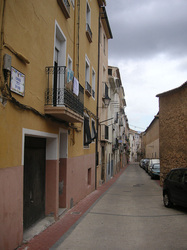 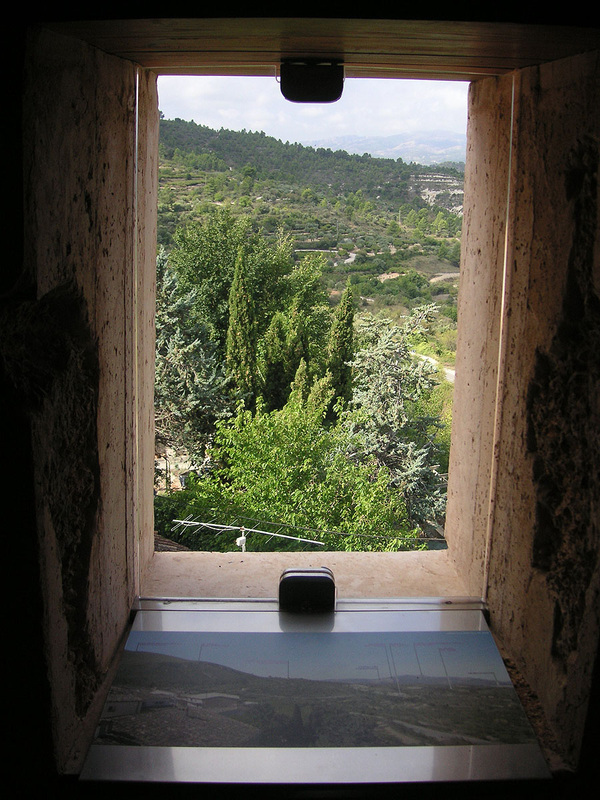 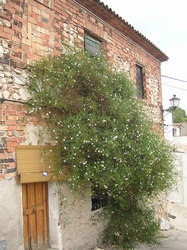 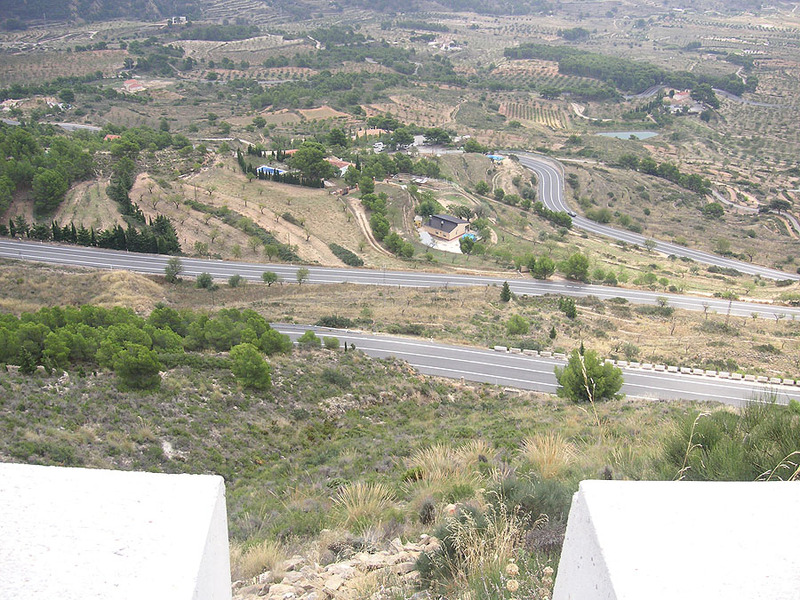 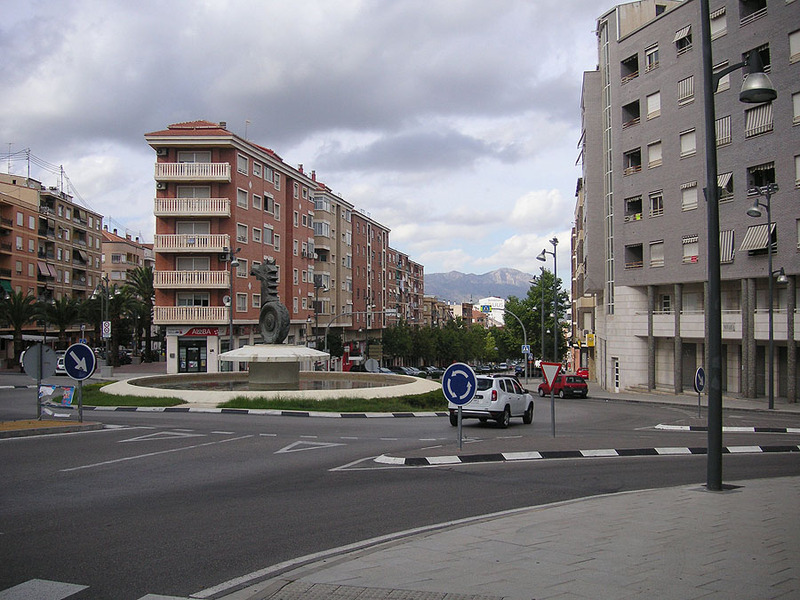 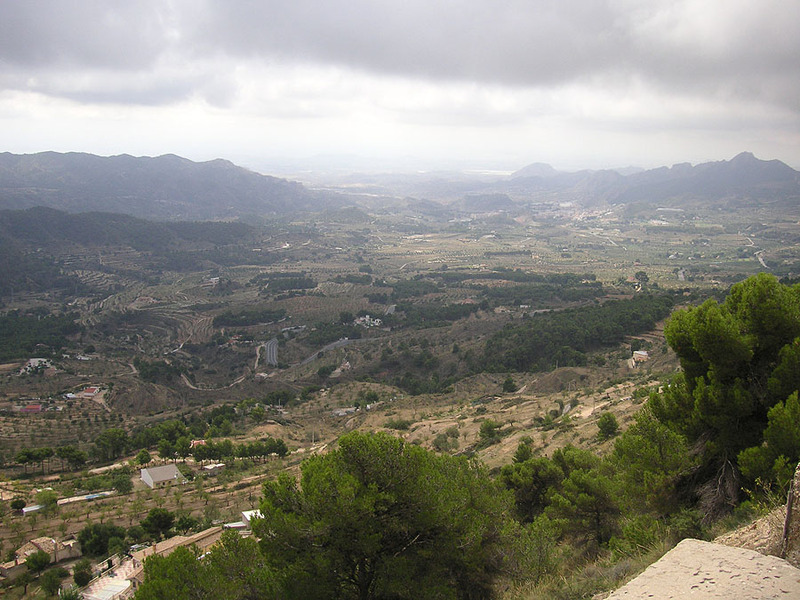 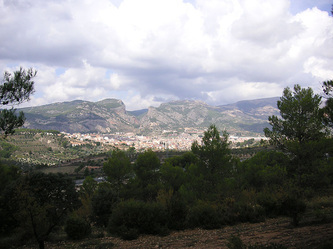 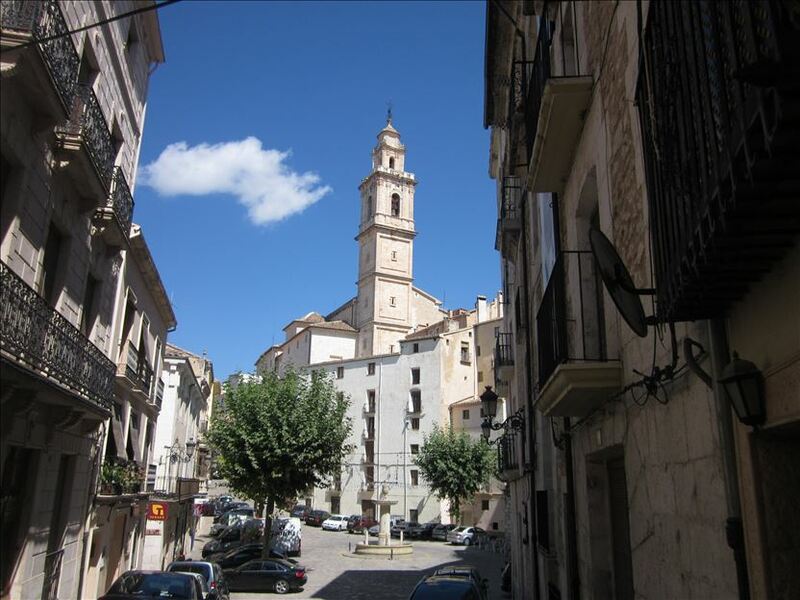 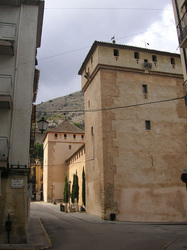 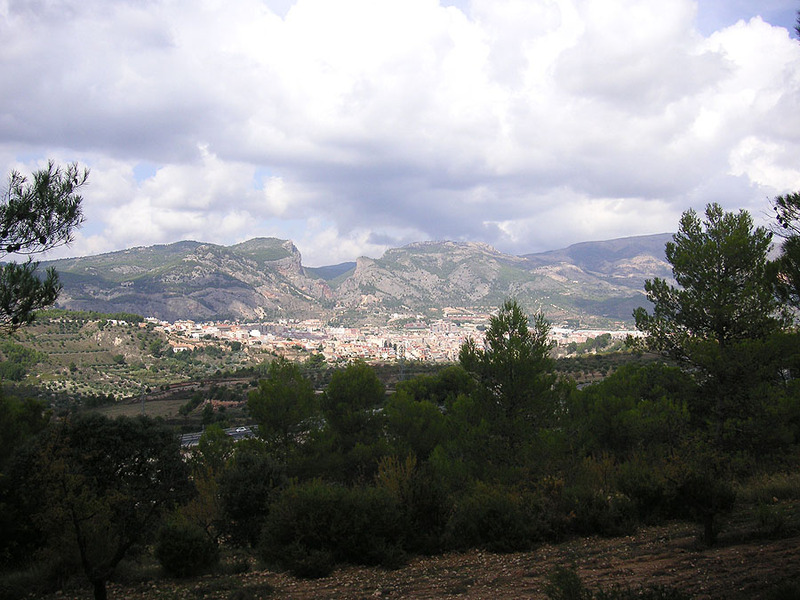 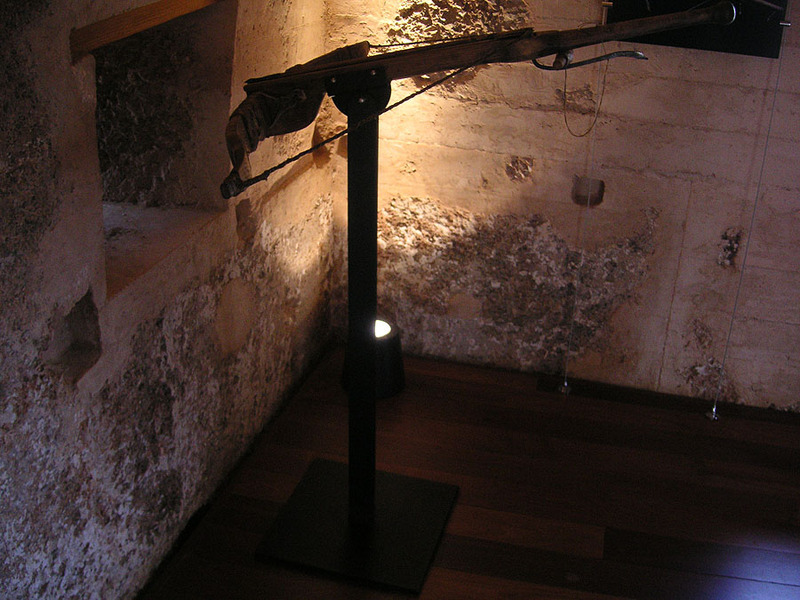 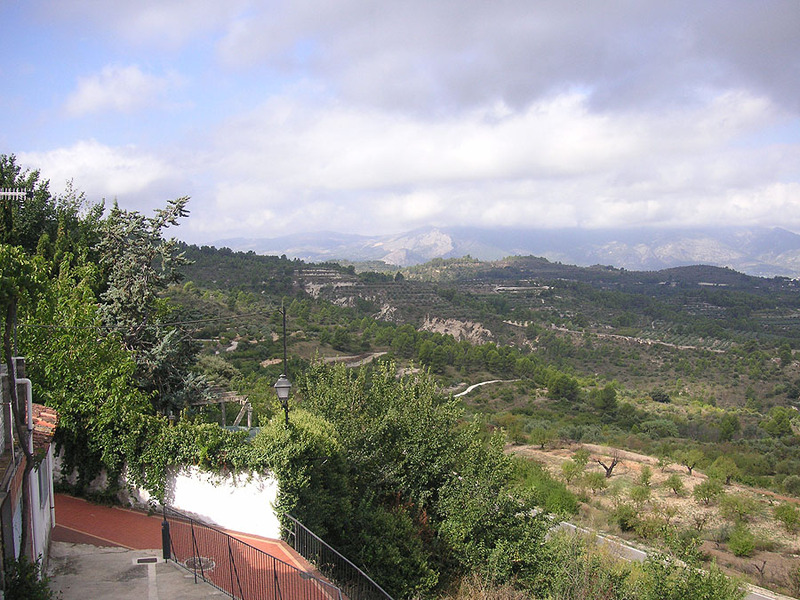 Set in a plain, Almansa has a Moorish castle perched high on a hill dominating the town. We walked round the main sights, and were disappointed that the Tourist Office woman spoke no English and seemed not to know anything about Lymington, their twin town. 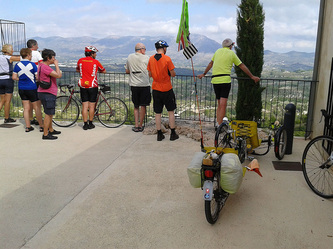 Arriving late morning at Cocentaina in Alicante province (1,410 ft) we met our holiday leaders Peter and Marjorie and some of the group of eight taking part in the CTC fixed centre cycling holiday in El Comtat, (an area in the mountains about 30 km inland from Benidorm) that we were joining. 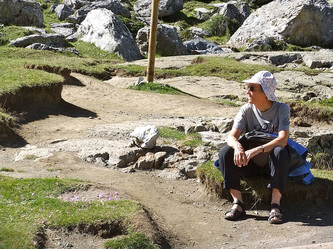 Others were yet to arrive. The trike was duly re-assembled in our hotel underground car park providing a point of discussion for our fellow cyclists who were examining and fettling their bicycles after recovering them from the “tender” care of their budget airline. 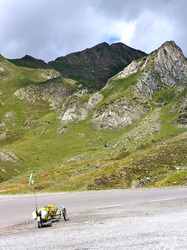 We explained that ‘Gertie’ was great fun, but ludicrously heavy and therefore rather slow and hard work uphill. 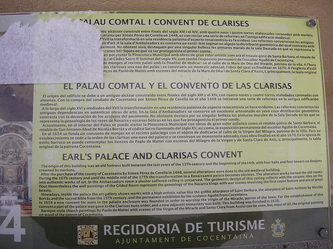 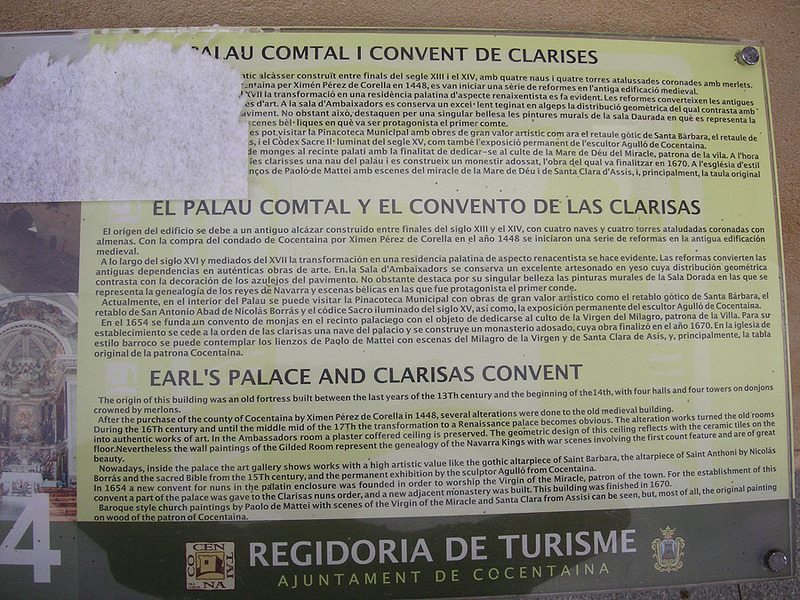 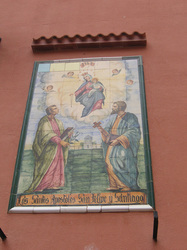 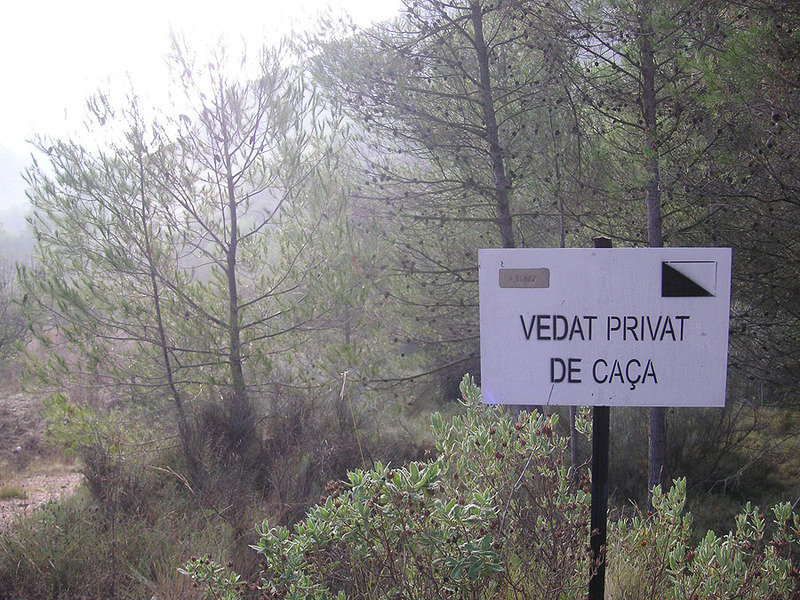 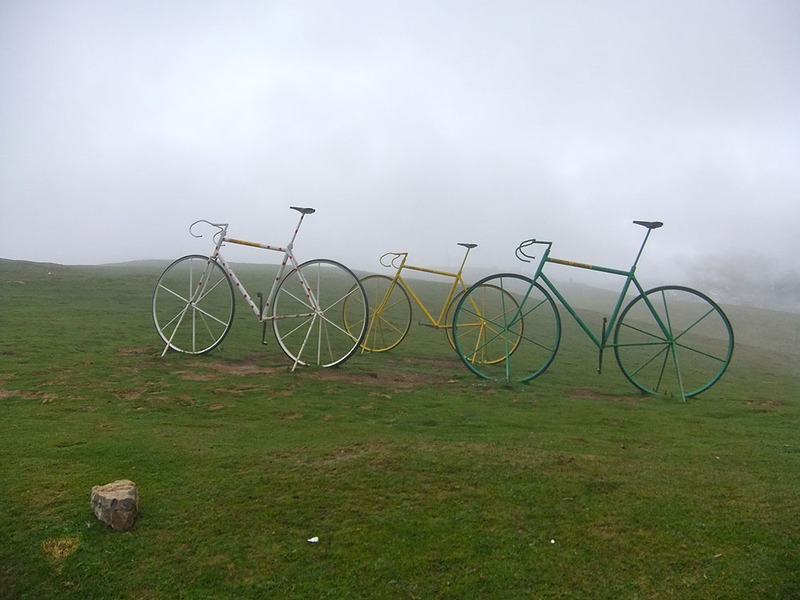 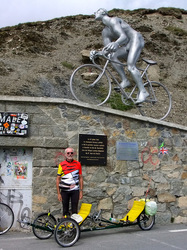 They were too polite to ask why, if this was the case, had we chosen to come on a cycling holiday in a mountainous area? 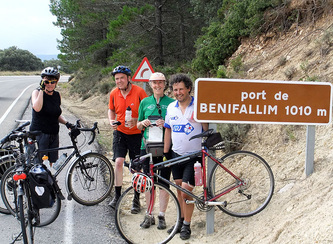 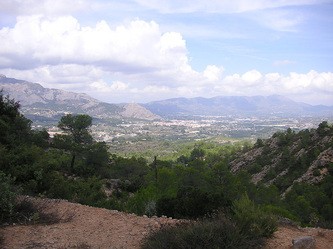 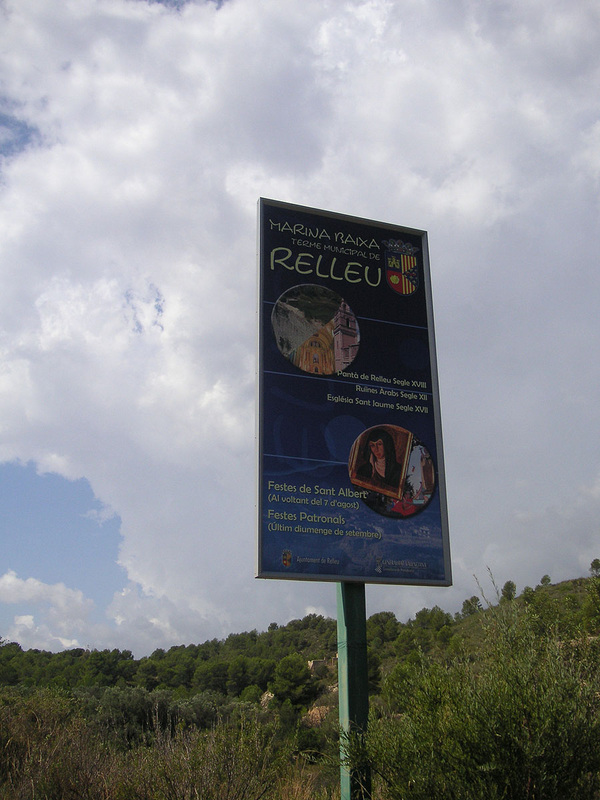 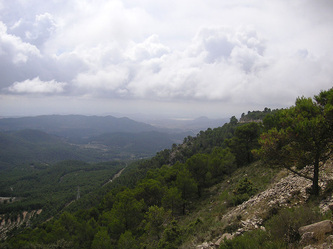 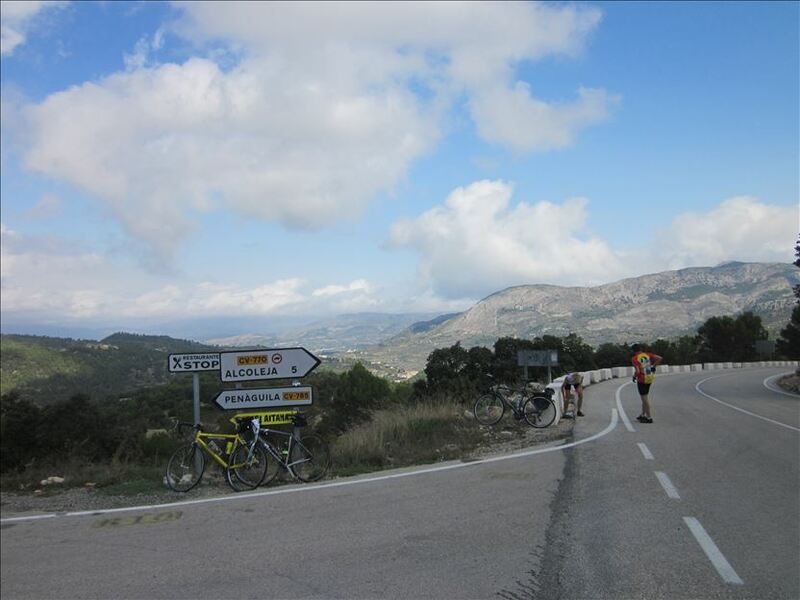 Then it rained….,but after a light lunch the weather brightened up again and most of us joined in a 35 km ride to Beniarrés to get a feel of the countryside (rugged) and the hills (frequent and sometime steep - in fact we found no piece of flat road all week). 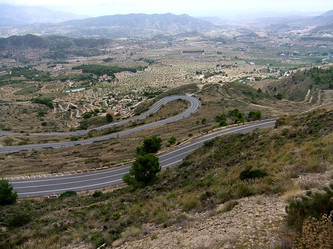 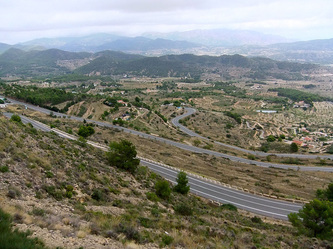 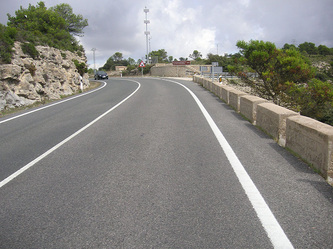 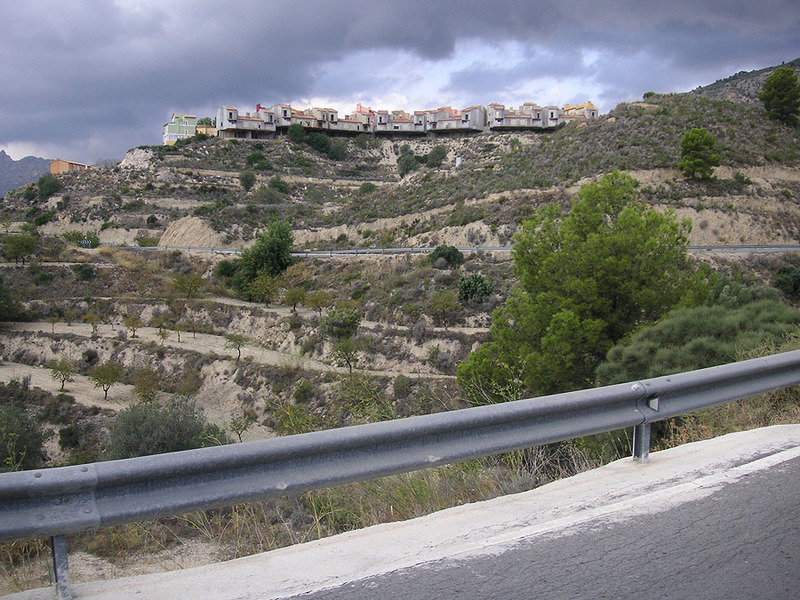 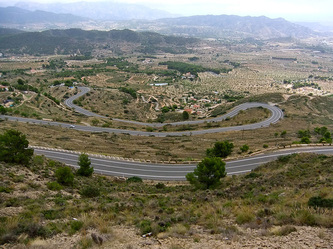 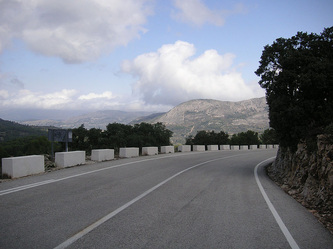 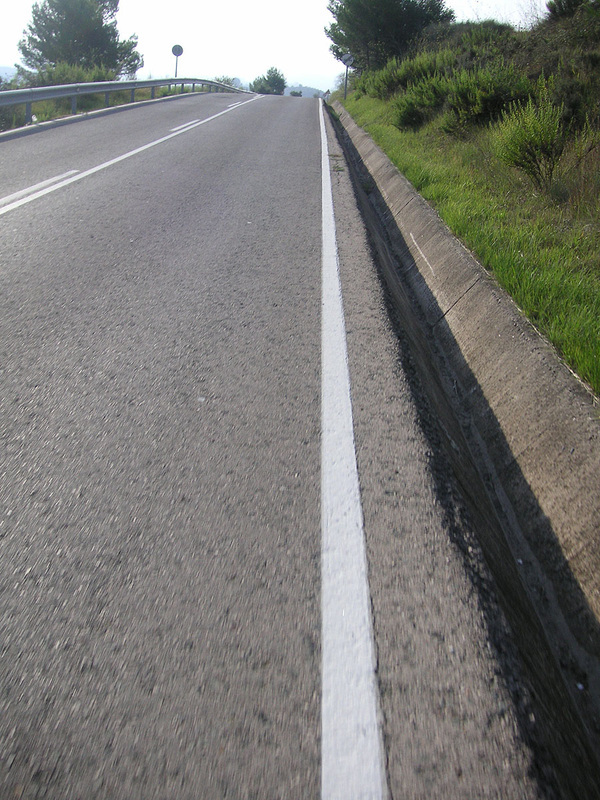 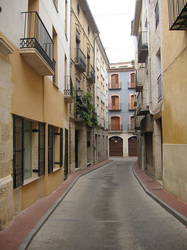 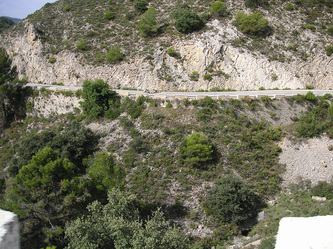 Riders from the Astana team have been seen training here, and the Vuelta a Espana has used these roads. 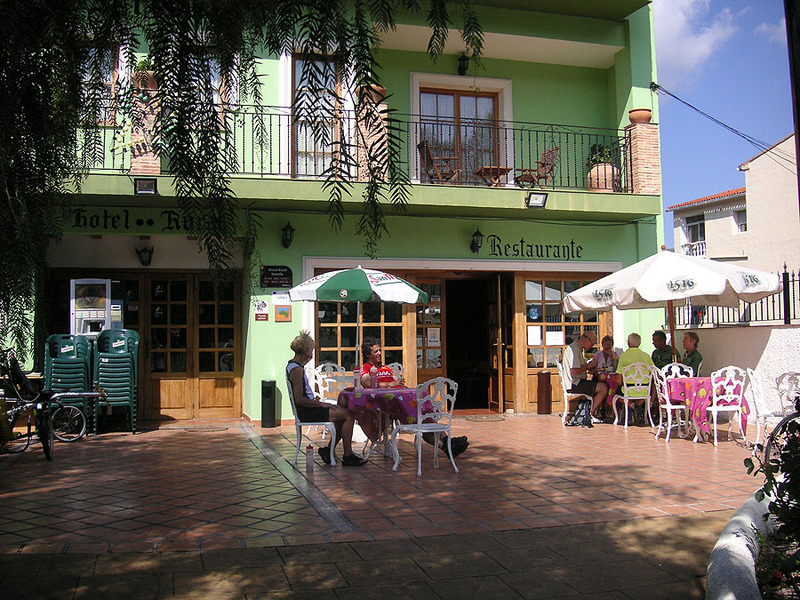 A refreshment break at a local café set the standard for the holiday – coffee, lunch and where possible tea stops were the usual order. 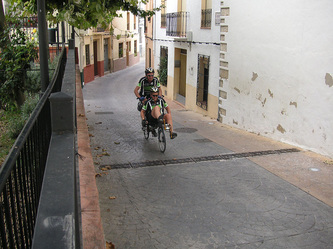 The fast downhill start from the hotel became familiar during the week, as did the slow uphill slog at the end of every ride. 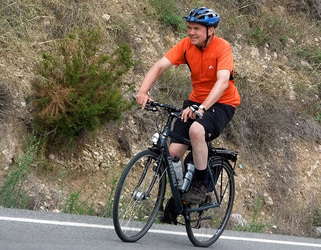 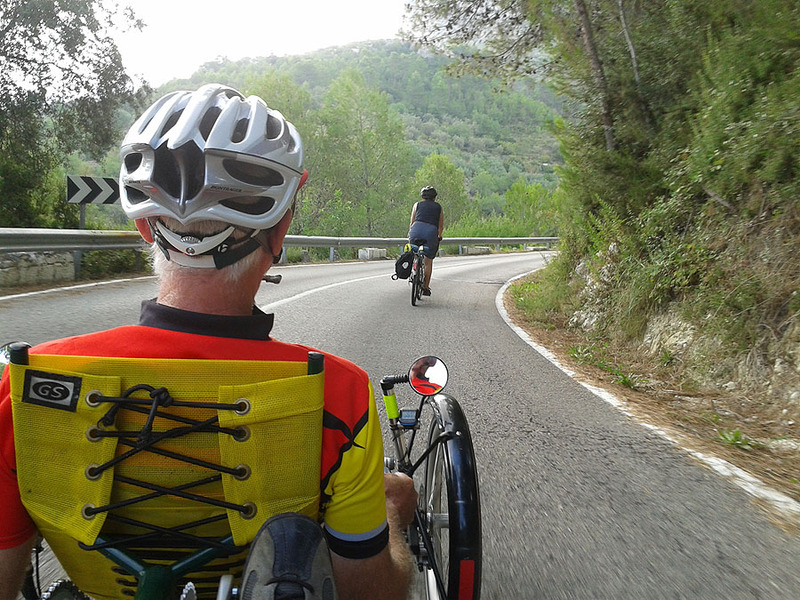 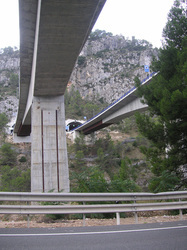 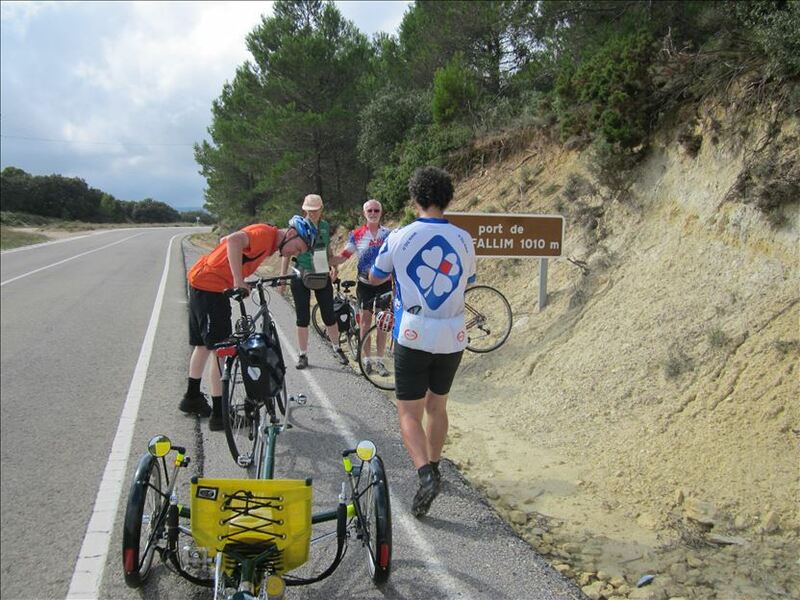 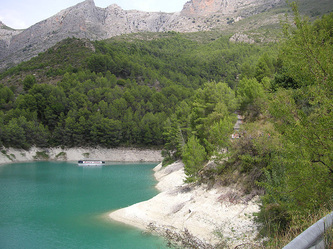 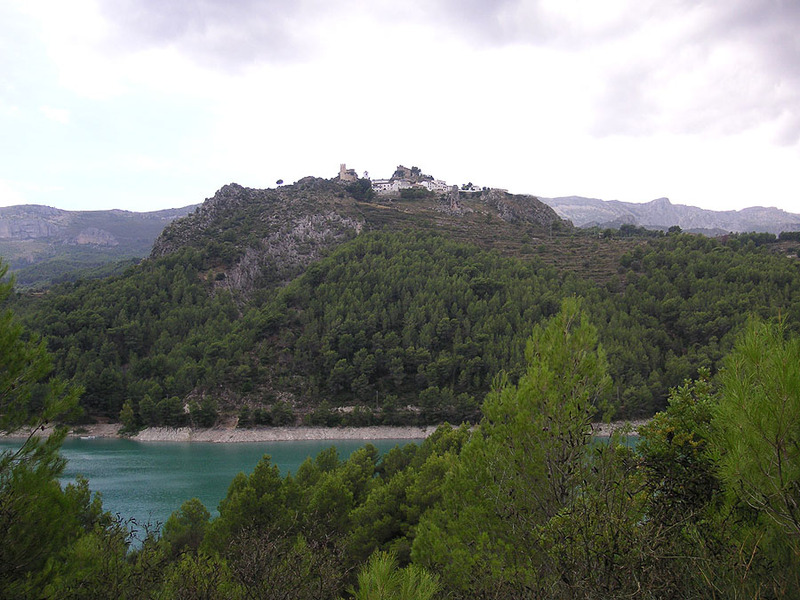 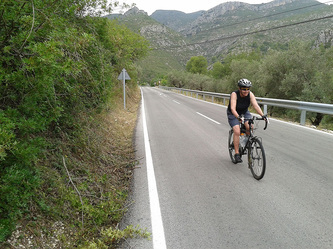 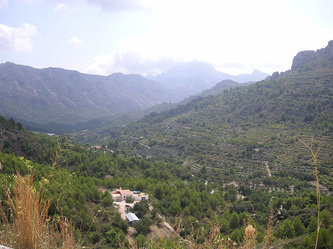 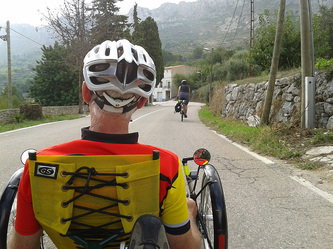 On Sunday we rode out to lunch to visit the amazing architecture and scenery of Guadalest. 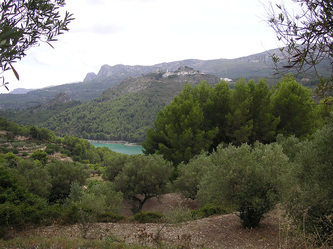 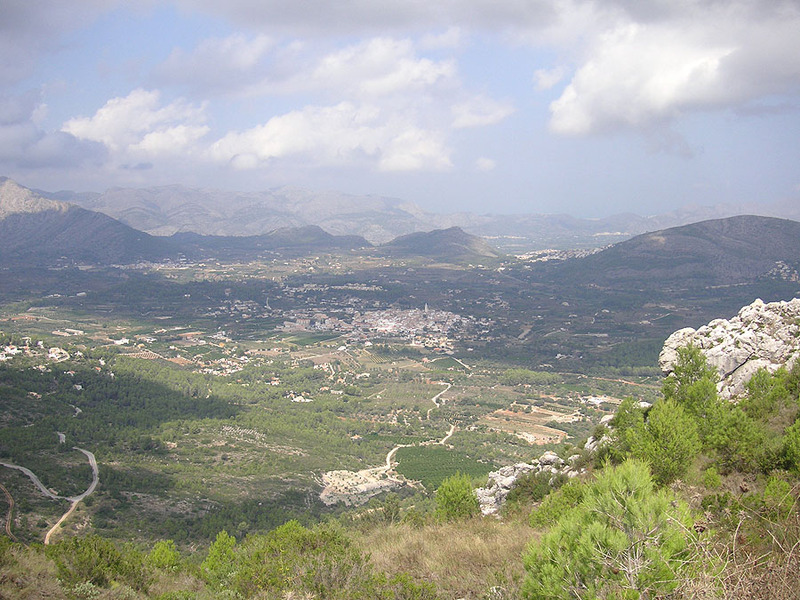 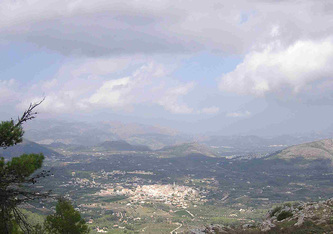 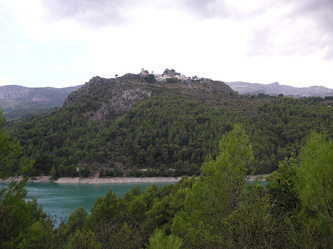 With its castle on a high rock and breathtaking views into the valley towards the Mediterranean, Guadalest is popular with coach trippers from the coast. 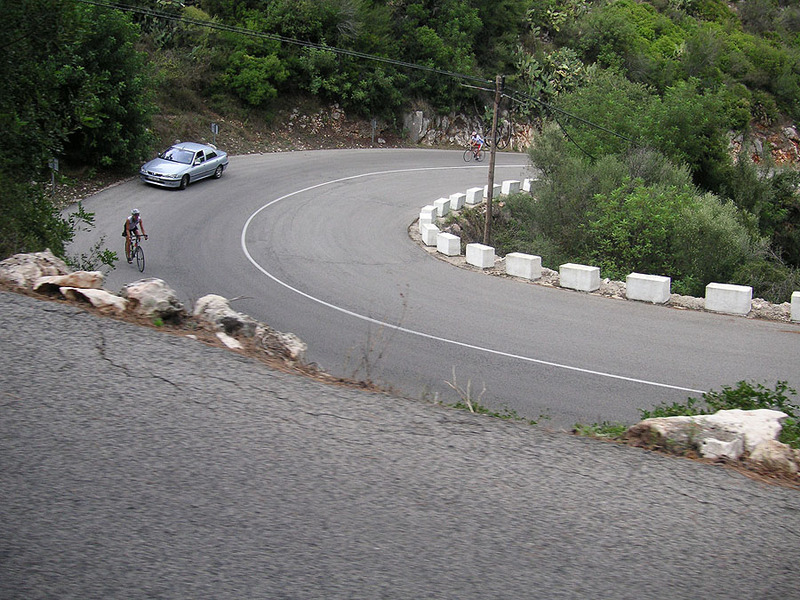 We were rewarded for long twisting climbs by equally long and exciting descents. 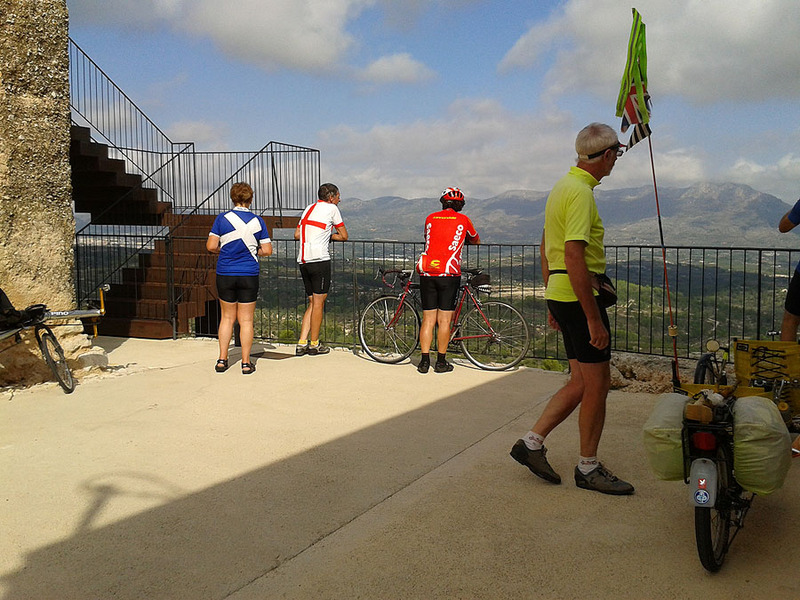 Some of the party dropped down to a lake before joining up with the rest of us en route back to Cocentaina to the end of the 67km ride. Our first long ride on the Monday involved passing through the wild Vall de Gallinera, an ancient route used by the Moors to travel inland from the coast. 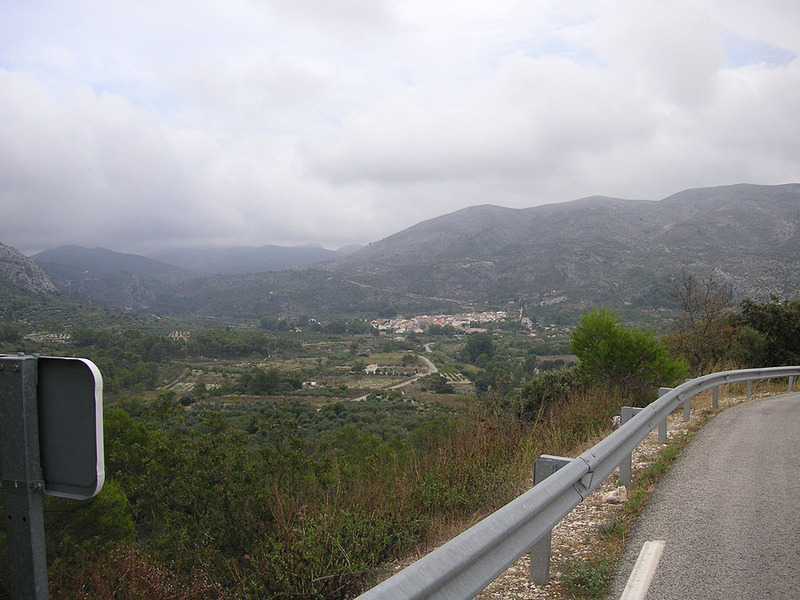 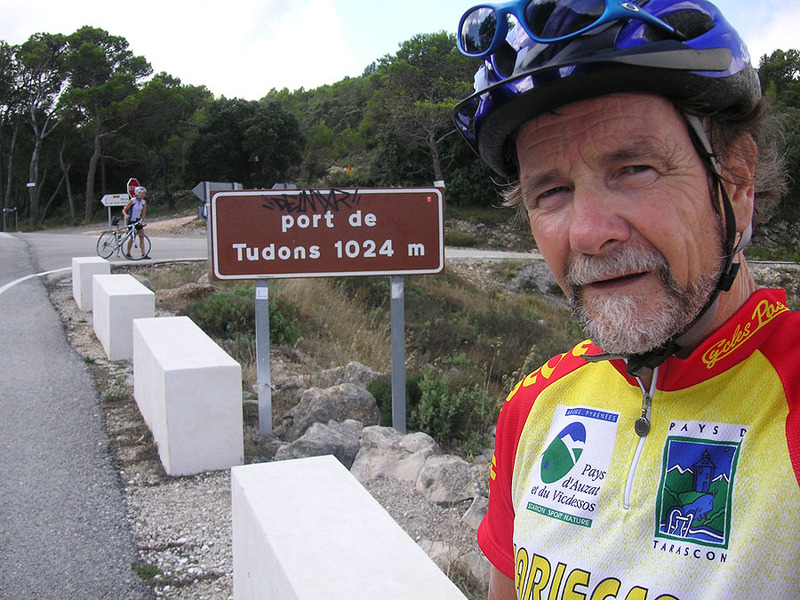 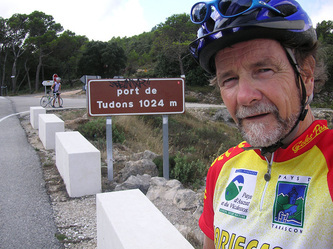 We then travelled on to the town of Pego, where we stopped at a supermarket to buy provisions to keep us going up a stiff climb to a late lunch; and finally on through the remote Val de Ebo. With the hills and the distance this was a challenging ride. This was billed as a 'Challenging ride' to take in the Coll de Rates via Quatretondeta, Castell de Castelles, Parcent and Tarbena. 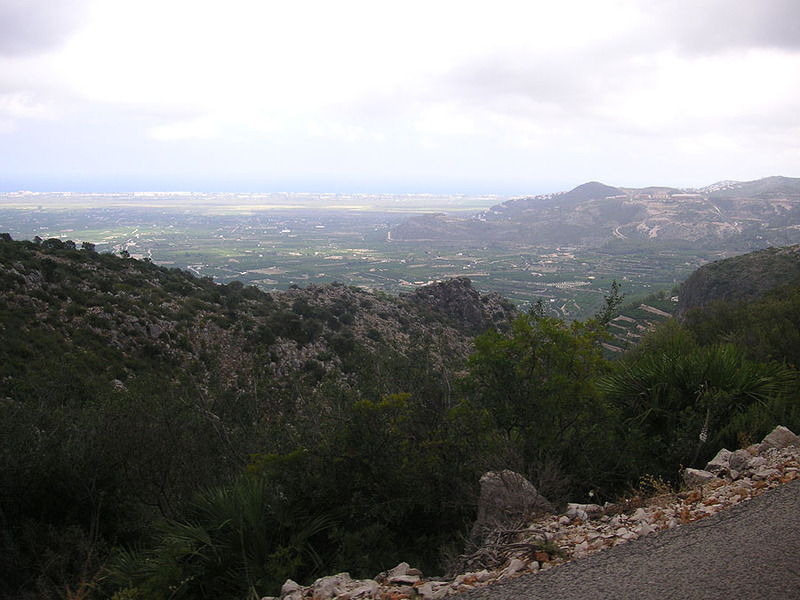 It turned out to be an accurate description involving three climbs, twice up to the highest village on the route at over 700m, and in between a drop then a climb to the Coll de Rates at over 600m with fine views of the coast. 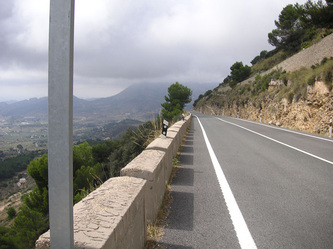 This Coll has a Stoppomat timing system operating from Parcent below, more common in Germany, with which cyclists can check their ascent time and compare it with that of other cyclists. 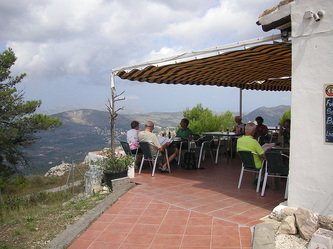 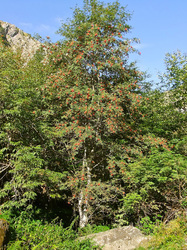 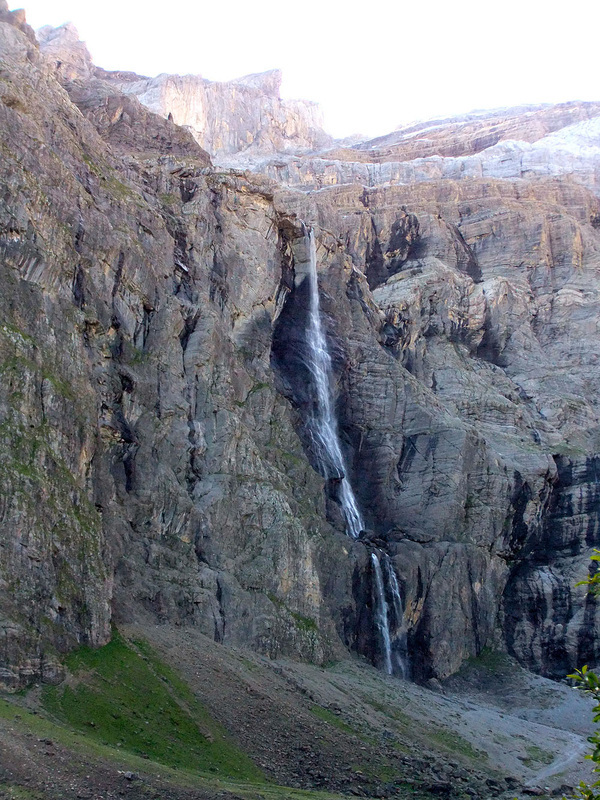 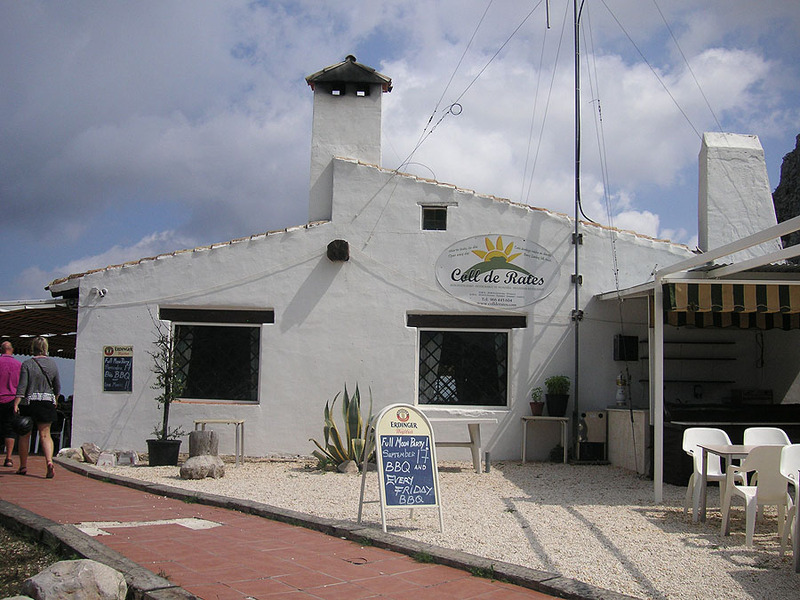 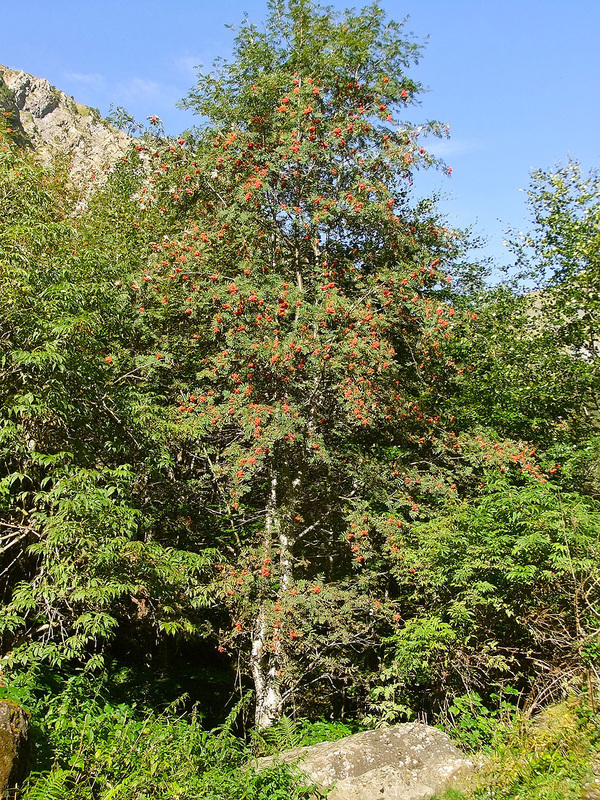 The Coll also has a restaurant where we lingered over lunch, with some of the group eating and drinking perhaps a little more than was wise given the remaining climbing and distance remaining between us and Cocentaina. 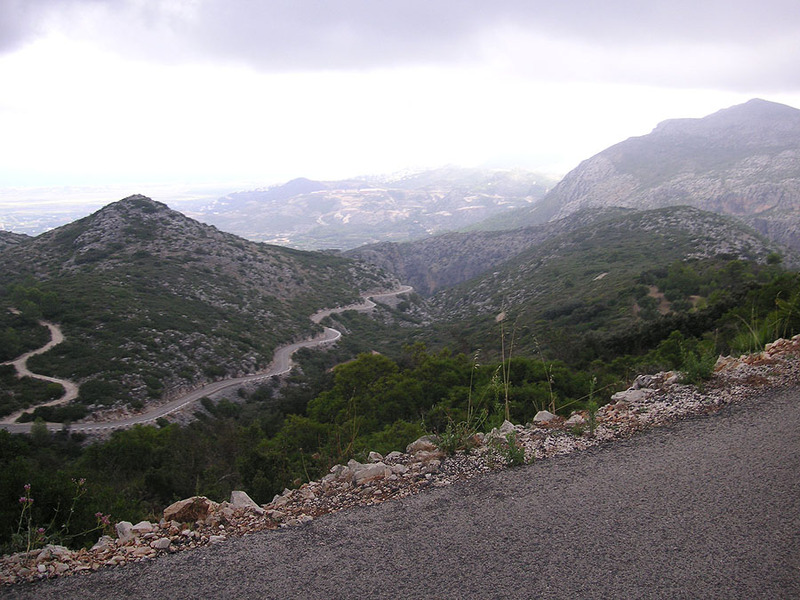 Having climbed the Coll from the other side to Parcent, it took us just a few minutes and some exciting cornering to make the descent. On the way back we successfully dodged thunder storms while the faster riders who cycled off the front got a bit wet. 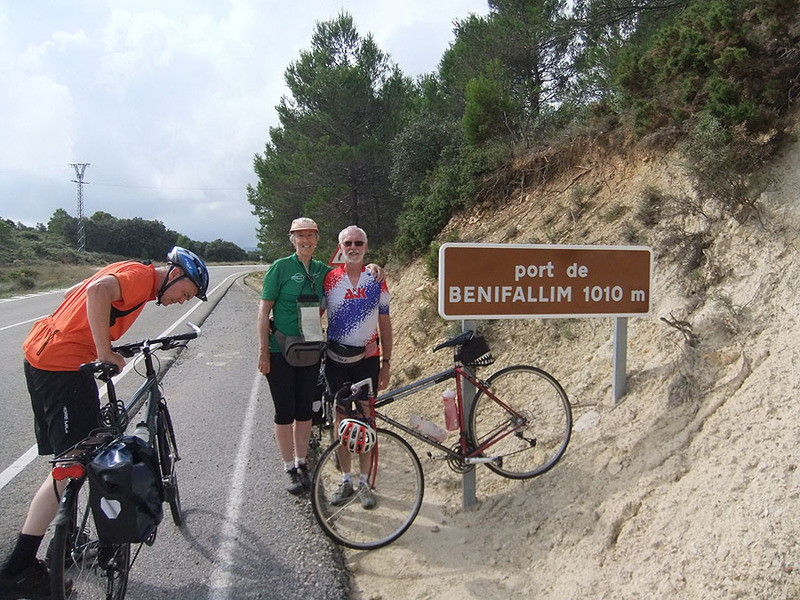 It took us nine and three quarter hours (although somewhat less actual cycling time) to get round the whole route and we were pretty tired by the end. 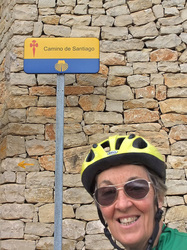 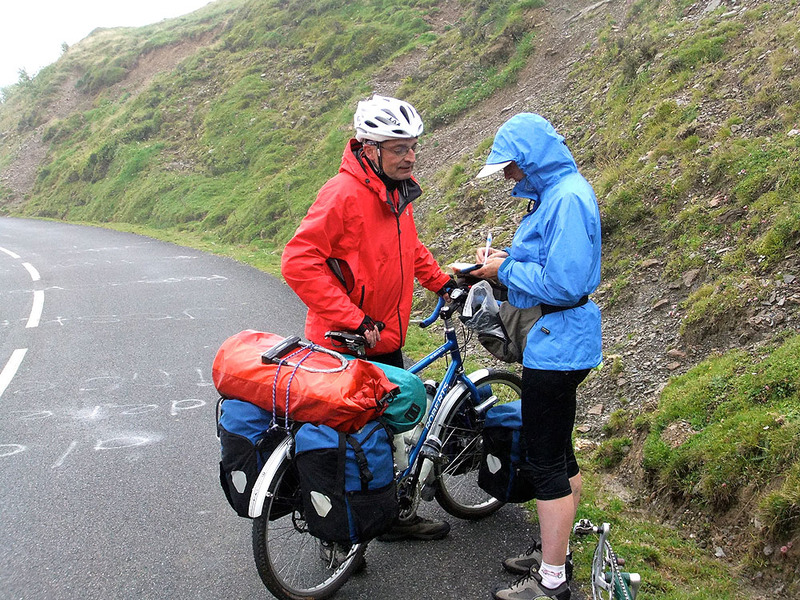 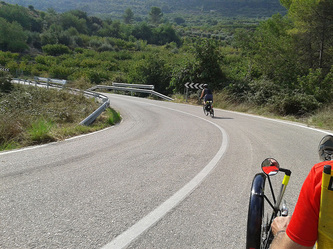 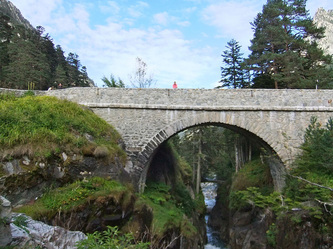 Sheila confirmed that it was on her shortlist for the hardest day’s cycling she has ever done. 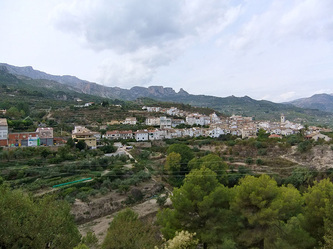 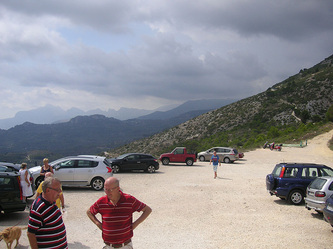 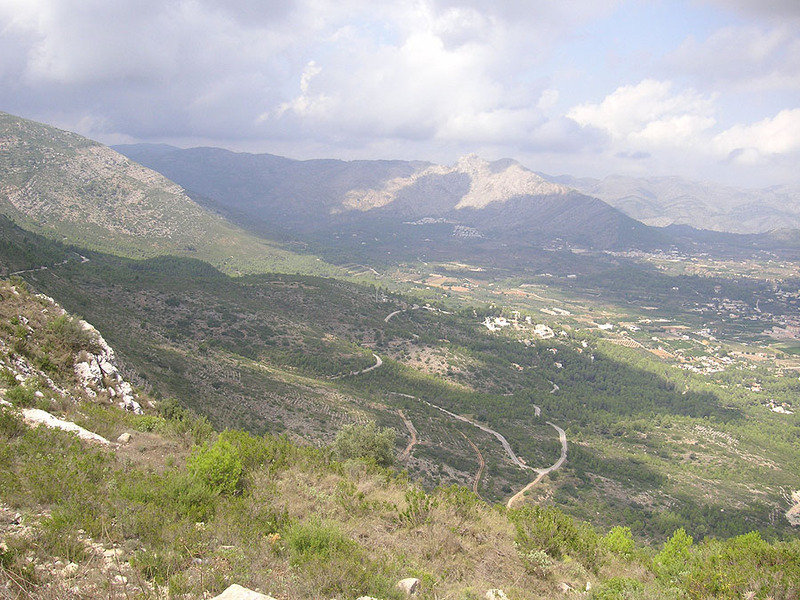 The official trip for the day (with some photos below) was deep into the Sierra Aitana to climb the famous Port de Tudons (Vuelta a España climb) followed by a long descent to Sella and lunch at Relleu; and returning through Torre Manzanas and Benifallim. 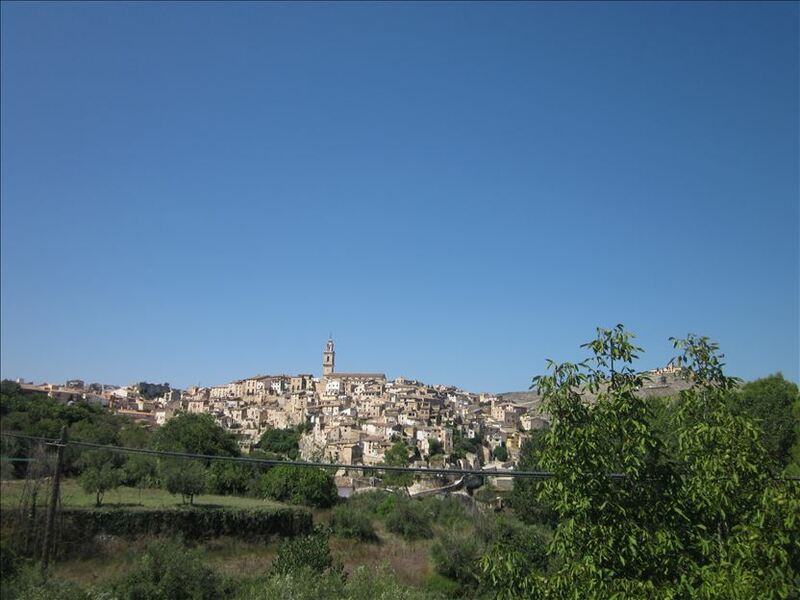 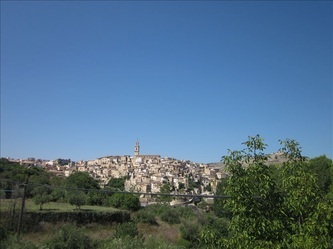 However, we decided to rest our legs and took the day off to go sightseeing by car to a small hill top town called Bocairent, which has a deep gorge round it. 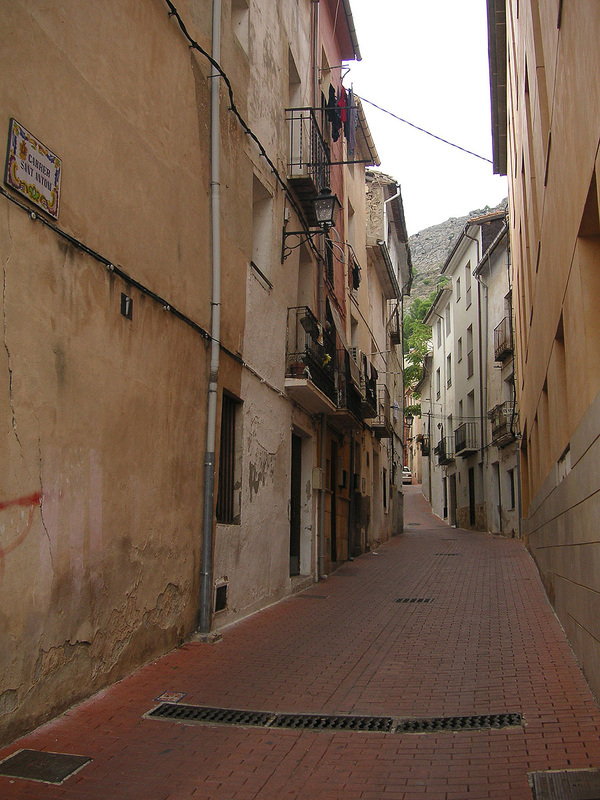 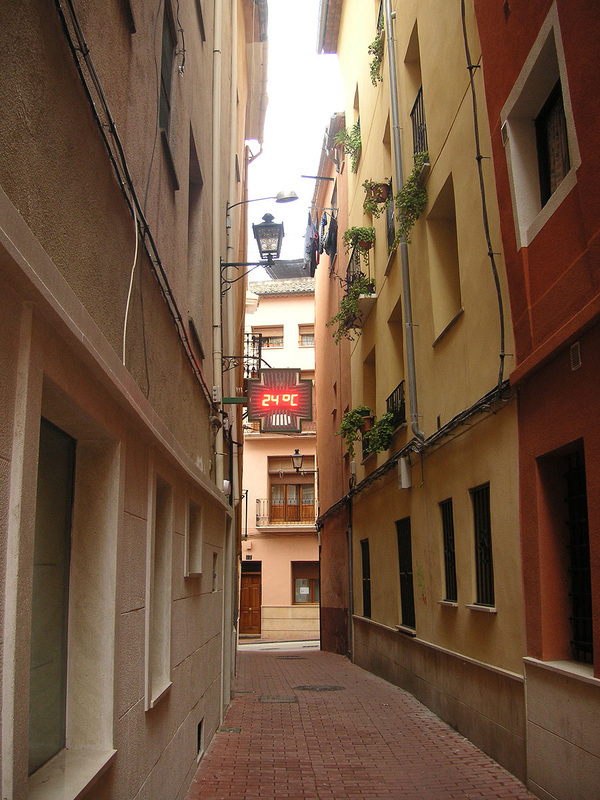 After a leisurely coffee in the old town main square, we enjoyed strolling around the narrow lanes and passages of the town, before relaxing over an excellent lunch. 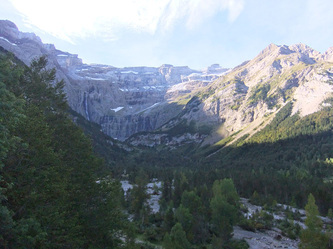 Hearing reports at dinner time back in Cocentaina from the rather exhausted looking four stalwarts from our team who had made it around the official route, we were further convinced that our choice not to join in their tough and at times wet day had been a "good decision". A more restful ride (i.e. 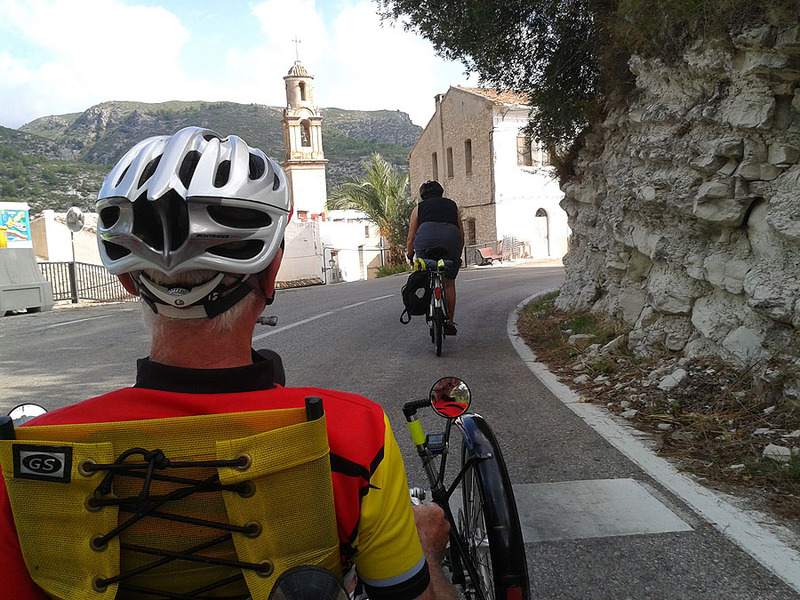 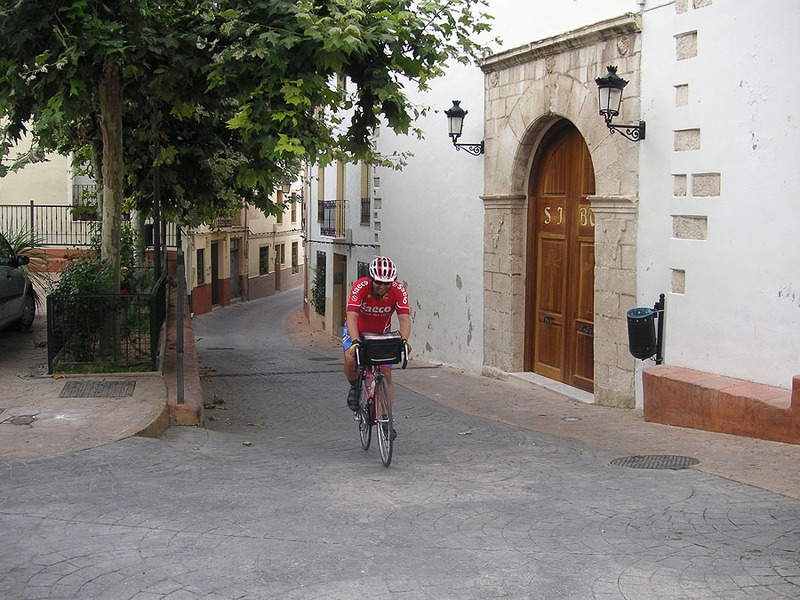 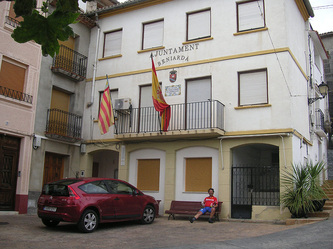 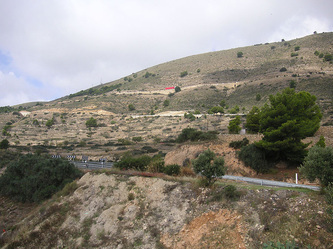 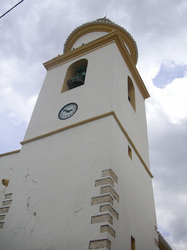 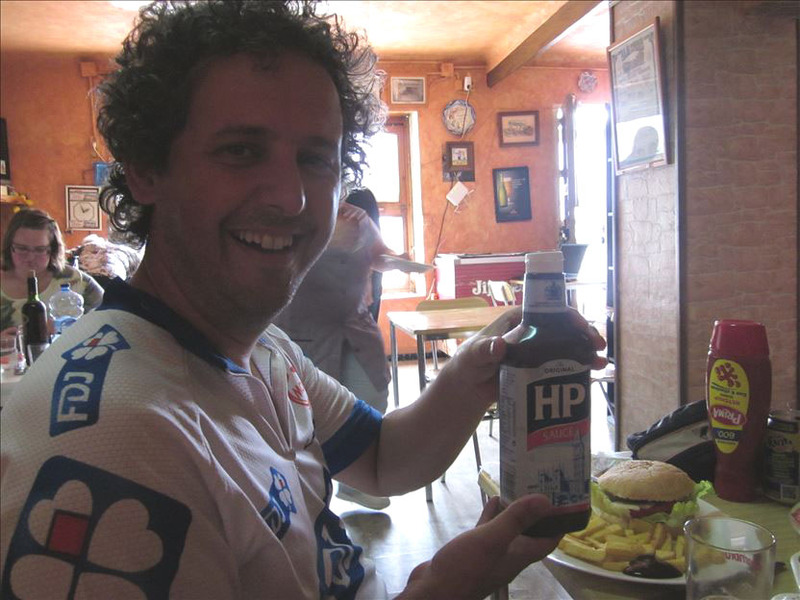 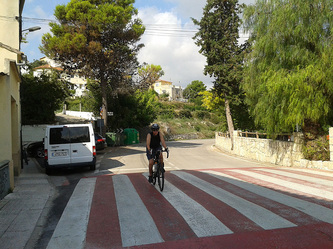 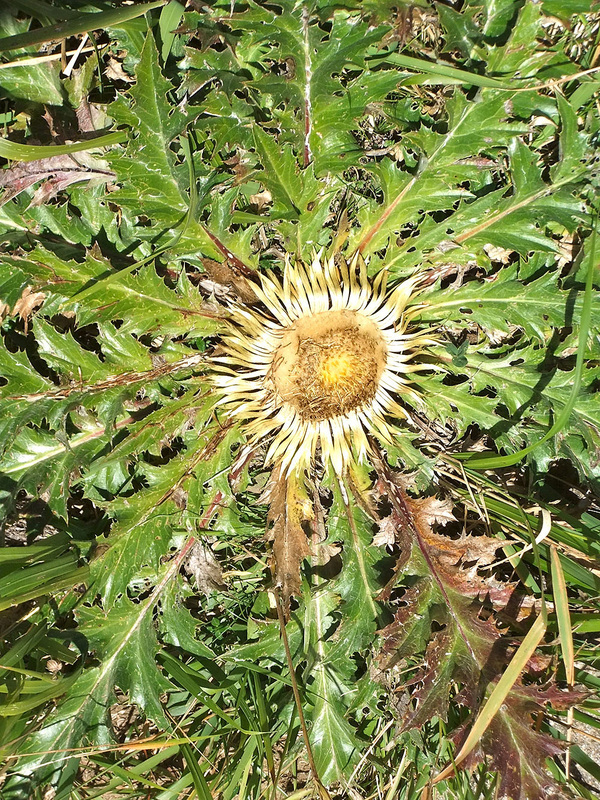 shorter – but no let up in hills) of 57 km on Thursday took us, on roads which were becoming familiar, to some of the more remote villages including Millena, Balones, Tollos, with time to visit the restored tower in Almudaina and stop for a leisurely lunch in Millena. 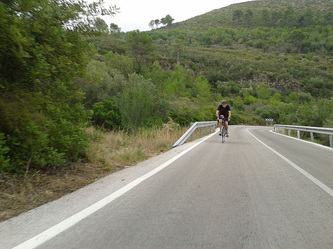 The afternoon featured a few short but very steep 20% hills that had us searching for lower gears. The final ride of the week, cycling to Jijona (Xixona in Valenciano), tackled 80 km and two colls – the Port de Benifallim (1010m) and the Port de la Carrasqueta (1024 m), so we set off with the less speedy surviving members of the party, to make a day of it. 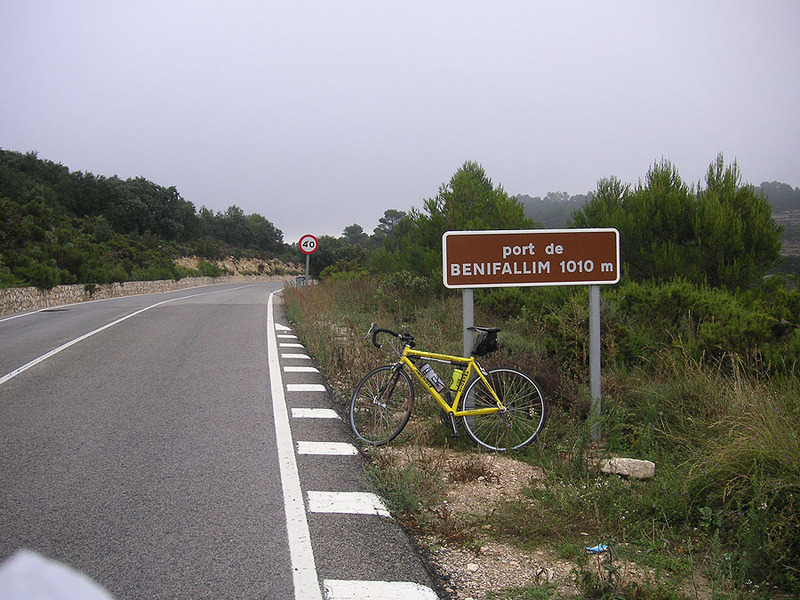 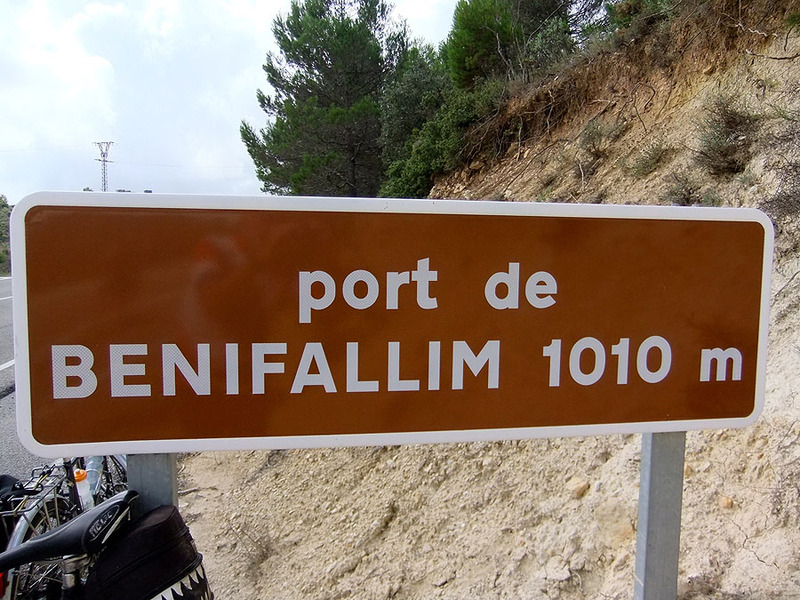 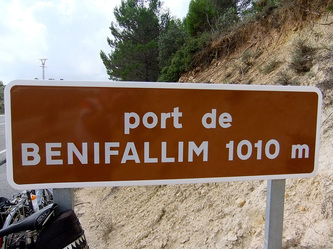 We got into climbing pace and tackled the Port de Benifallim in fine style, then descended with coffee in mind. 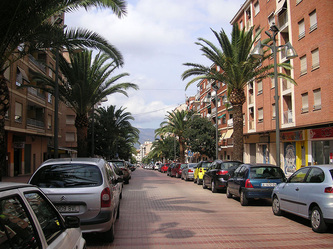 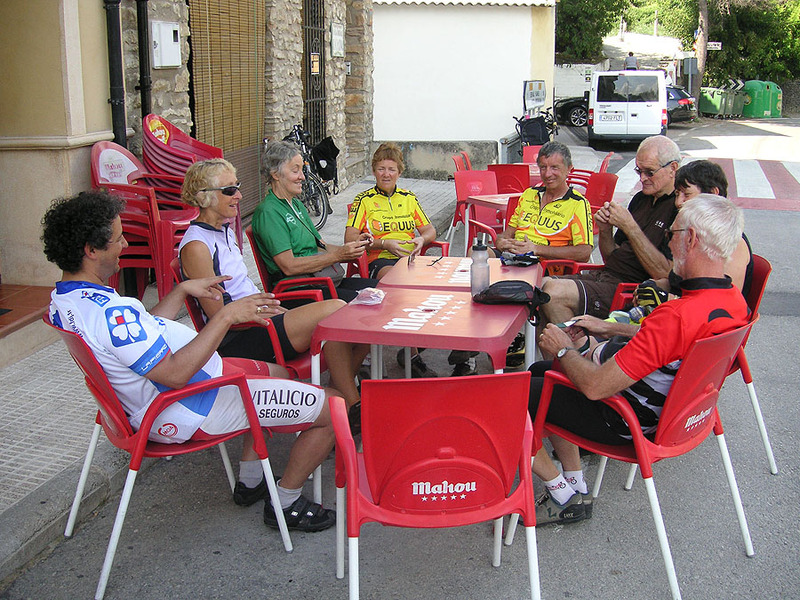 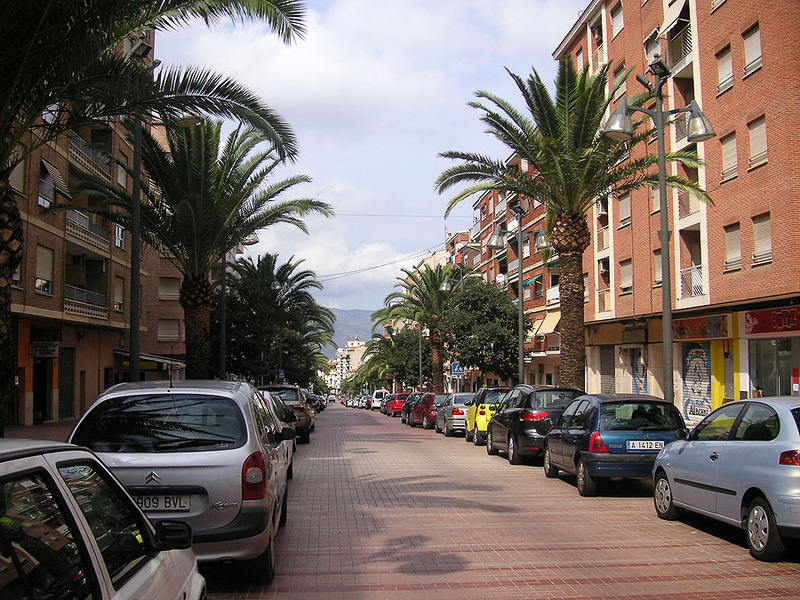 The group had a bit of trouble finding our coffee stop in La Torre de les Maçanes and split up to search for the intended café. 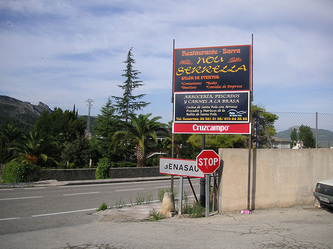 Knowing it was near a school we located it by the noise of the children in the school playground next door. 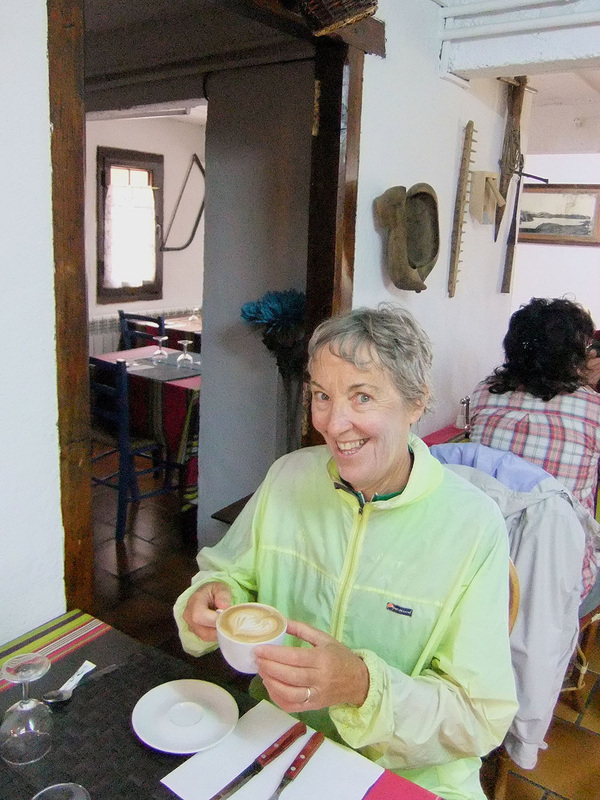 Along with coffee we indulged in home-made ‘Magdelenas’ or buns. After losing much of our height on a continued rural descent, we set off ascending the hairpin bends of the second big Coll of the day. 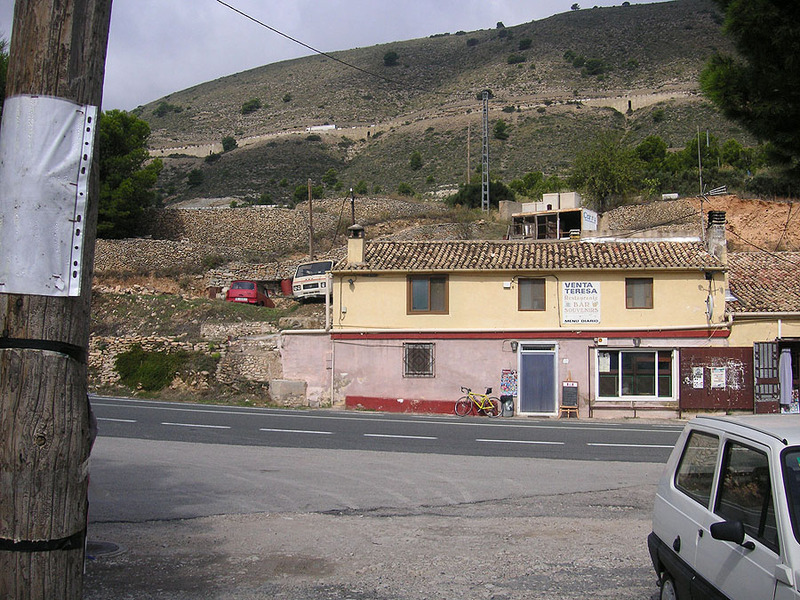 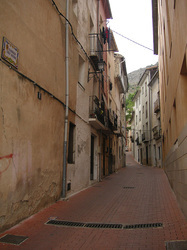 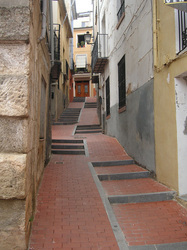 Luckily, half way up this second climb is the Venta Teresa café. 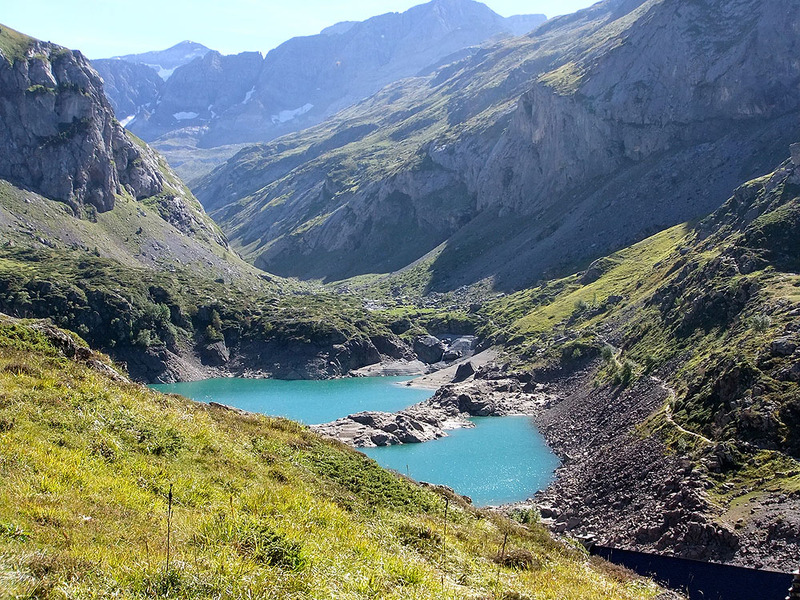 where we paused for lunch. 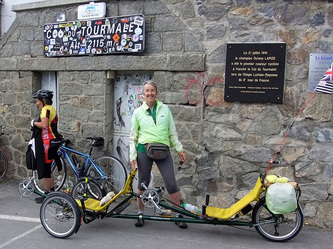 The café is run by a lively and enterprising family who took photos of the trike and threatened to put them on their Facebook page. 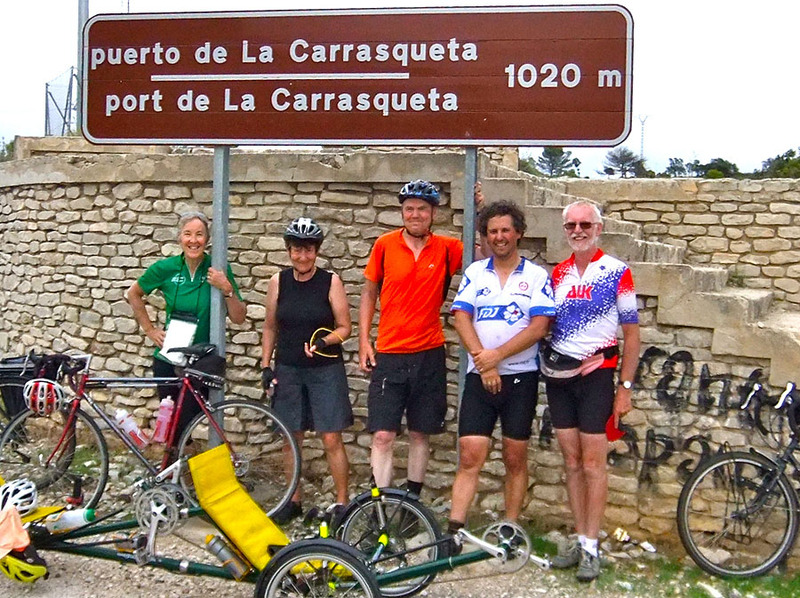 Rather hazy views of the Mediterranean opened up as we gained height and photos of the final day survivors group were taken beside the sign at the Port de la Carrasqueta. 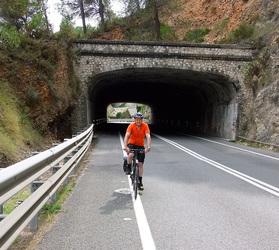 The descent took in a short tunnel (more an extended bridge, but with an official sign telling us to put our lights on) and on to the final return to Cocentaina taking in a small road skirting the hillside above Alcoi. 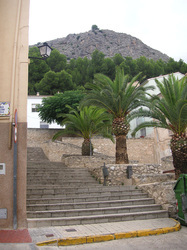 The homeward run and even the last climb up to the hotel, seemed easier than before. 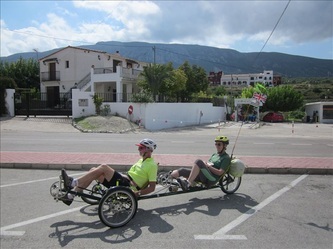 We tried to put on a good show as we went up the main street hill in Cocentaina, waving back to trike fans at a bar on the edge of town who came out to applaud and to lads on a high balcony who waved and shouted for the second evening running. 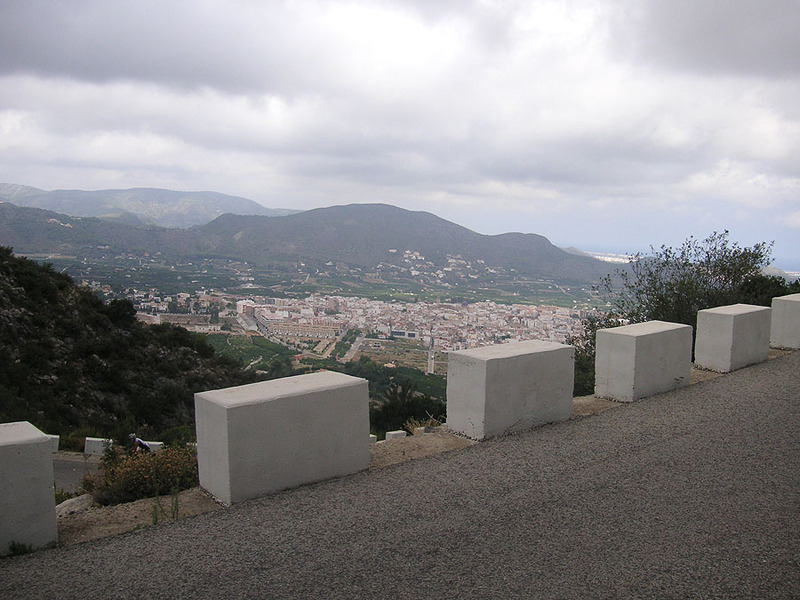 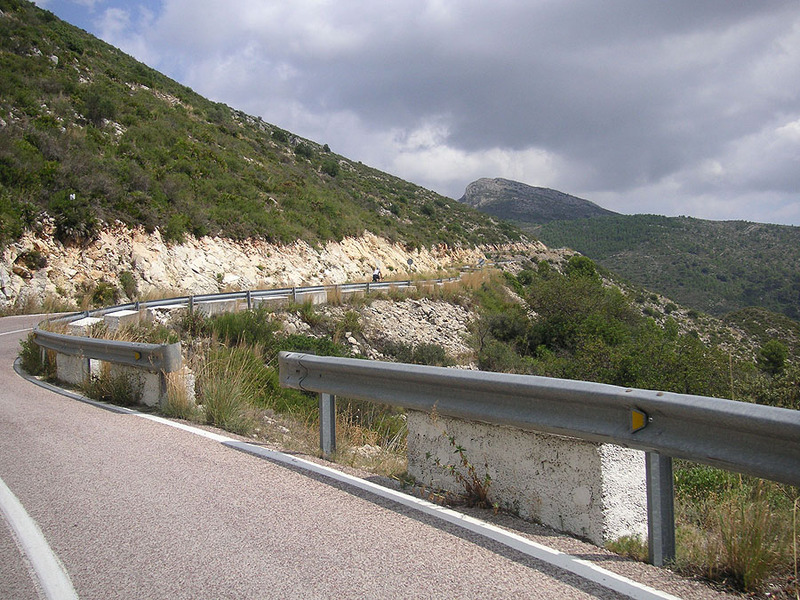 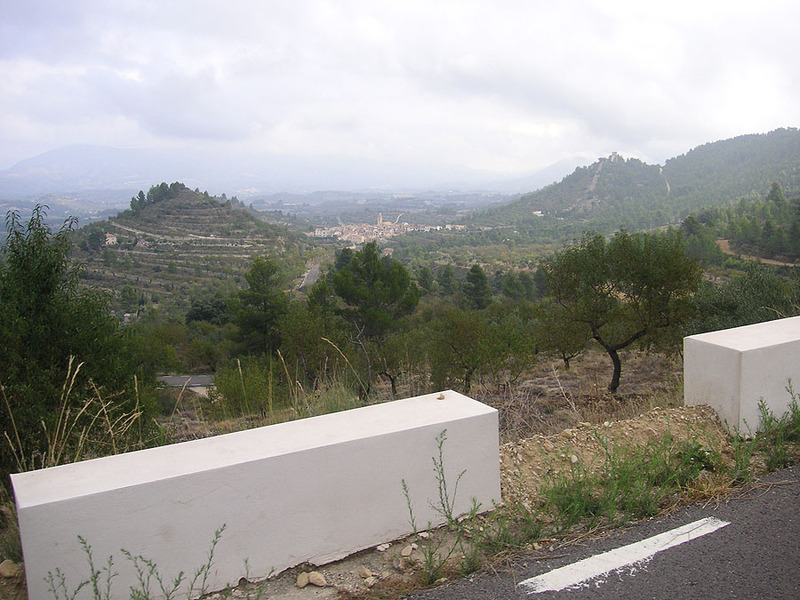 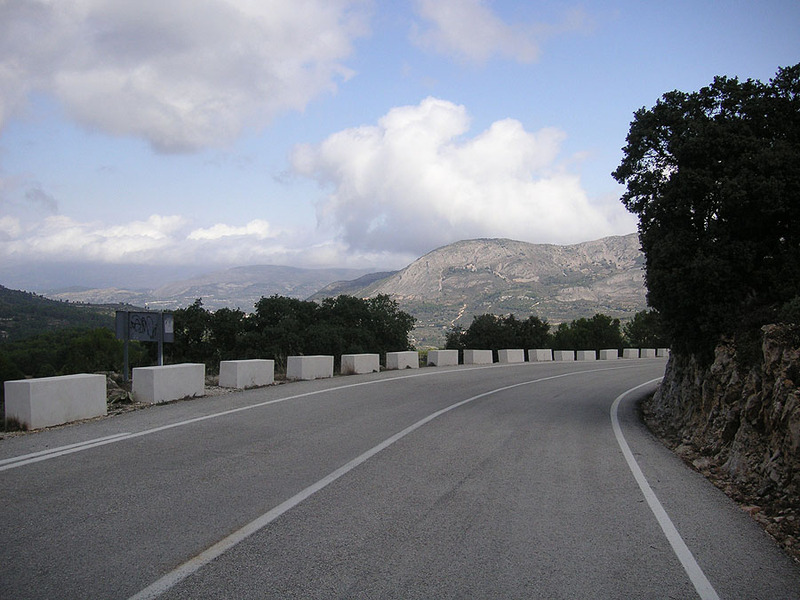 Throughout the week the Spanish roads were very quiet, brilliant in quality, with good safety barriers, and with very courteous car drivers. 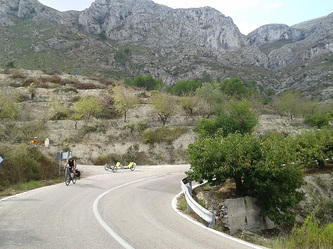 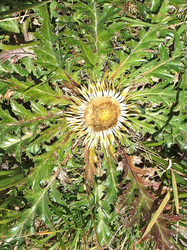 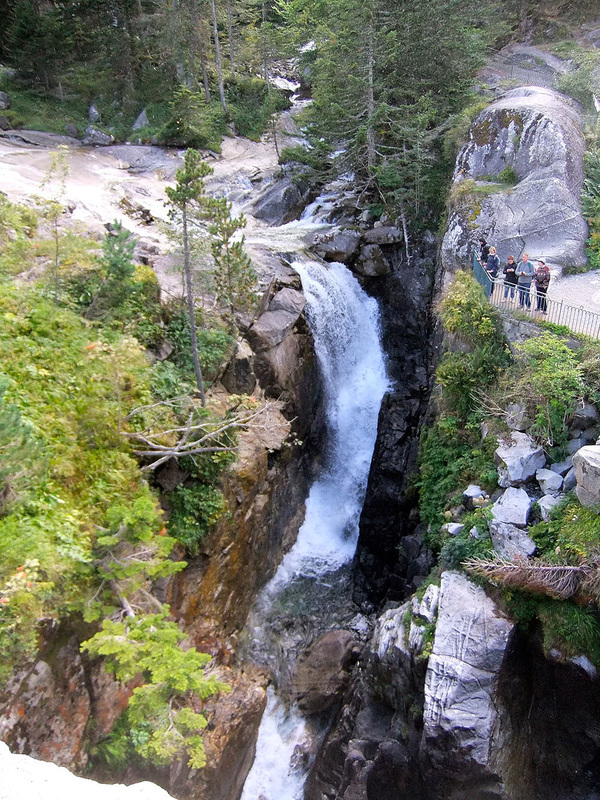 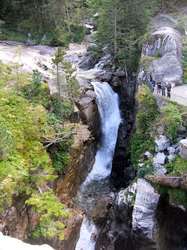 We had enjoyed the week in spite of the tough climbs, occasionally up to 20%. 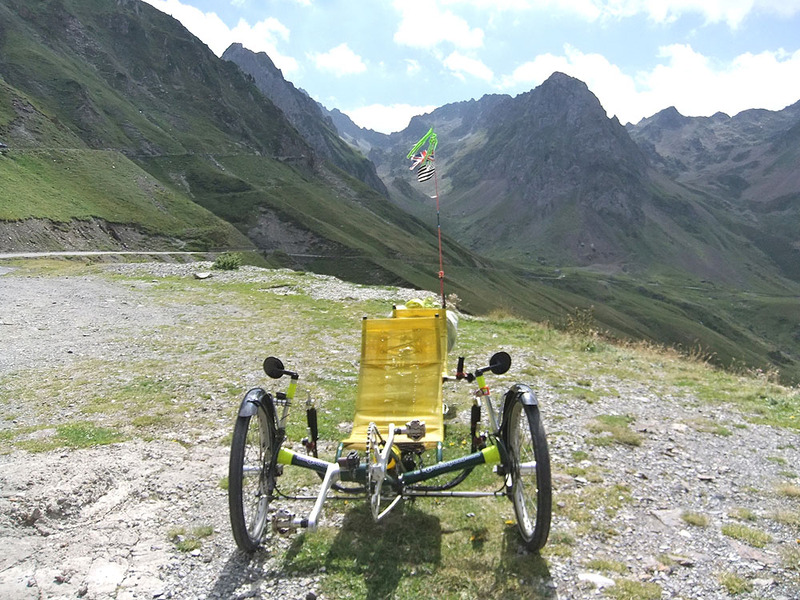 Only one thing left to do before the final group dinner - we dismantled the trike and packed it into the car. 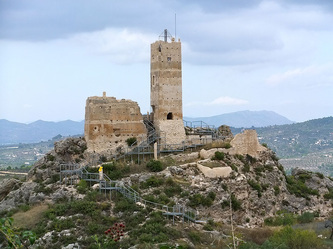 Next day we took leave of our companions and the organisers Peter and Marjorie and drove north towards Peniscola and the holiday home of our French twin family from Vitré, Guy and Marie-Annick. 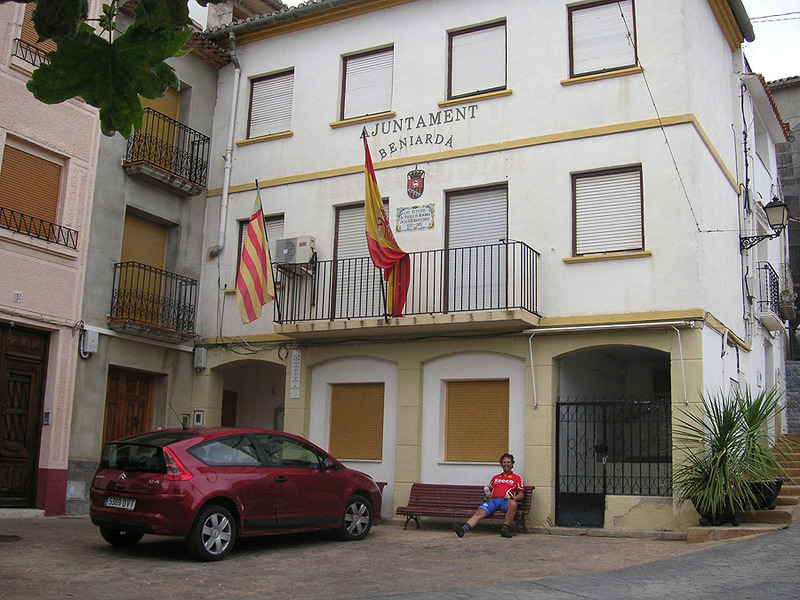 Stopping en route for coffee in a small town we came across preparations for an imminent bull-running event and were sorry that we didn’t have time to stop and discover what was about to take place. On arriving at Peniscola, Guy and Marie-Annick took us on a car tour of the sights around Peniscola and then a walking tour of the old town, which was ‘en fiesta’, and as we approached the old town on a promontory jutting out into the sea, we spotted that bull-running was about to begin. With a vantage point from the castle, we watched a few local lads trying to goad, but carefully keep out of the way of, some rather reluctant bulls. 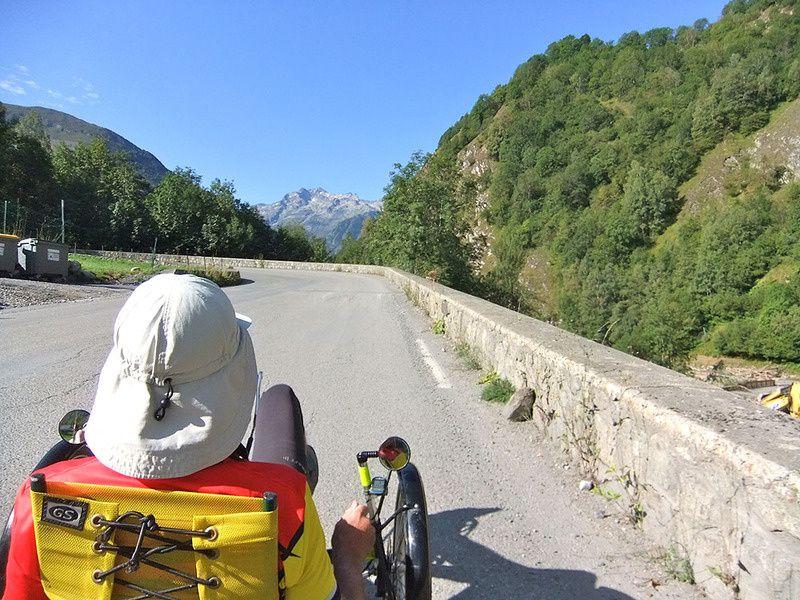 Setting off northwards next day we followed a pretty route suggested by Guy through spectacular gorges before heading on towards the Pyrenees. A long lunch stop in Ainsa gave us time to visit the hilltop old town which was well-maintained, and to see the last moments of a folk dance and song display in the town square. 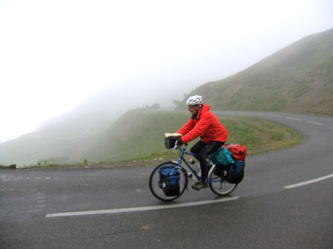 Climbing steadily we entered the tunnel leading to France in bright sun, and emerged to thick cloud, poor road surfaces, and no safety barriers – some welcome to France. 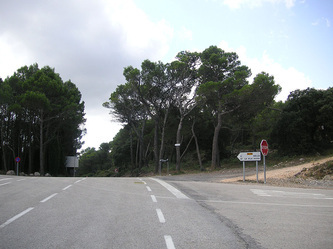 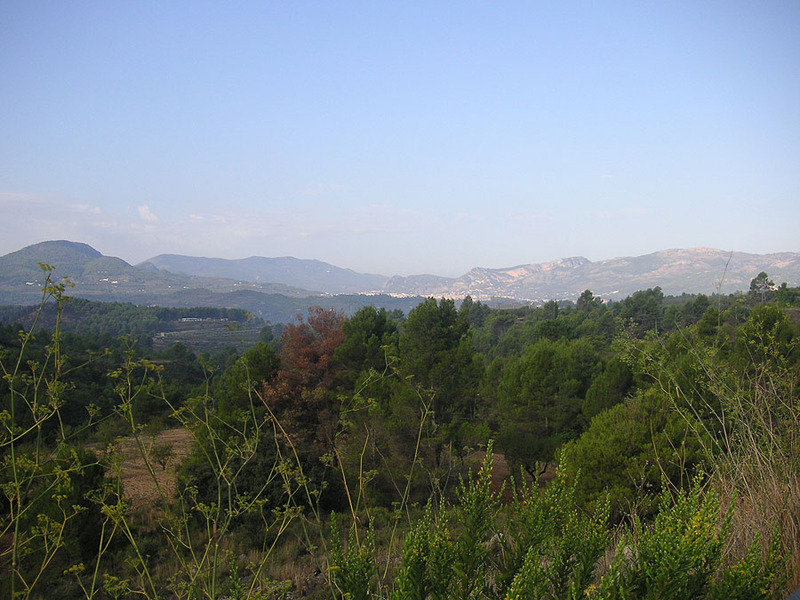 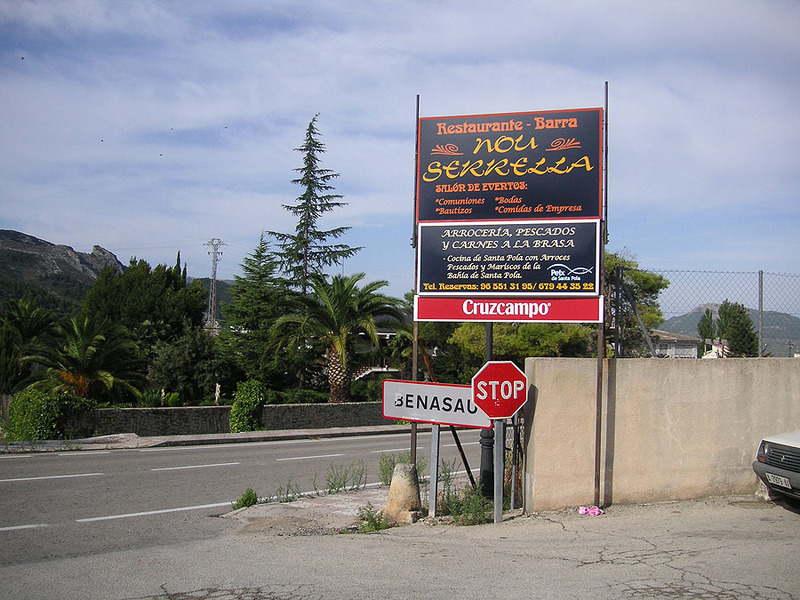 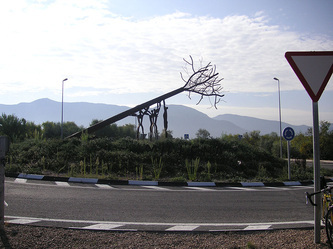 We resorted to the motorway to make up time after our long lunch, and arrived in Argelès Gazost in time to go and find supper – not easy on a Sunday evening when you don’t eat meat or poultry. 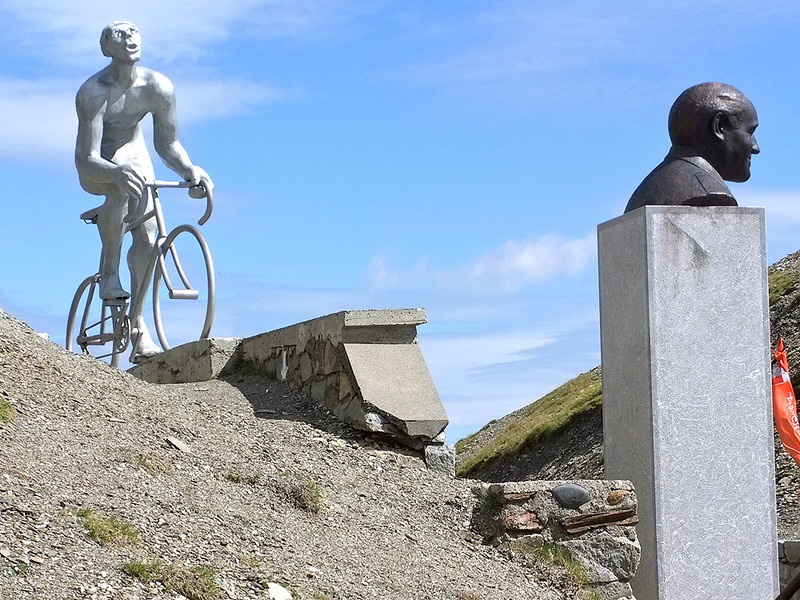 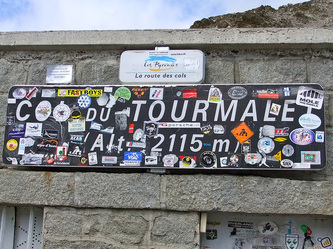 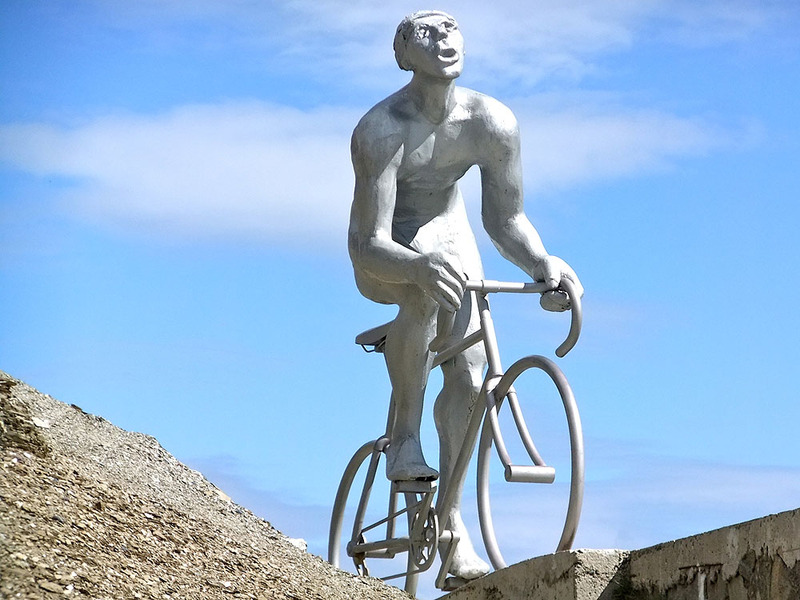 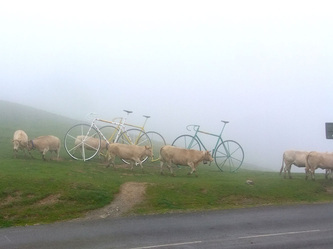 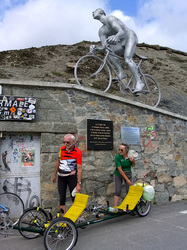 Having checked the weather forecast, which was good for Monday, we decided to go for the Col du Tourmalet without delay. 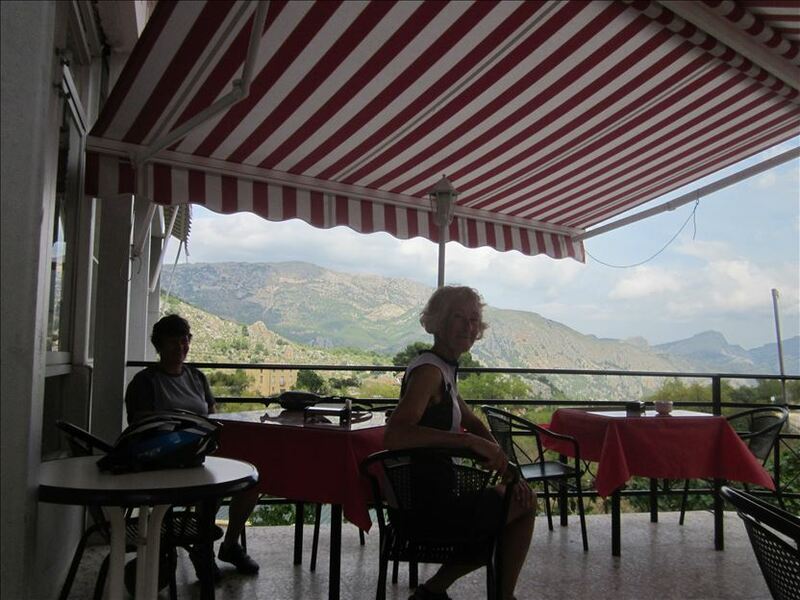 Leaving after a prompt breakfast, we set off for Luz St Sauveur, an 18km run latterly through a gorge. 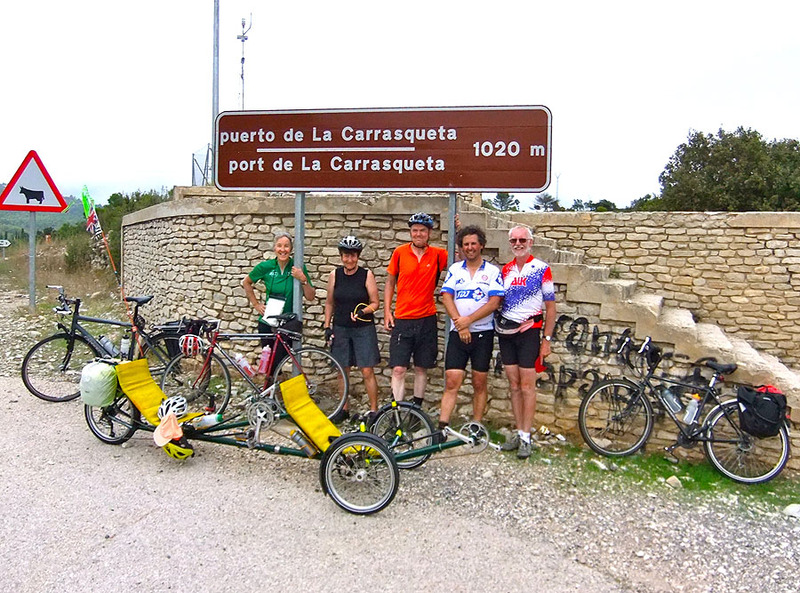 The hotel owner had told us of a great former railway cycle path covering the first 6km, with a good tarmac surface and gentle gradient, so this gave us a good start. 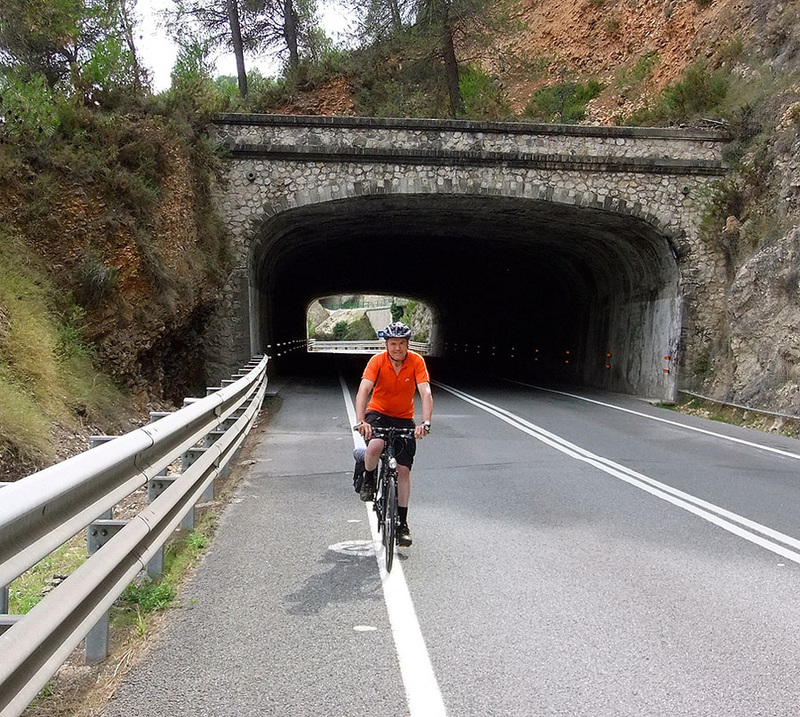 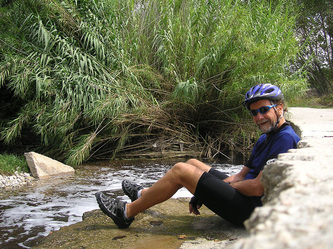 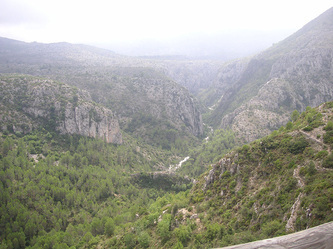 After the end of the railway path in Soulom we took to the Route de Luz road, which climbed along the steep sided gorge of the River Gave. 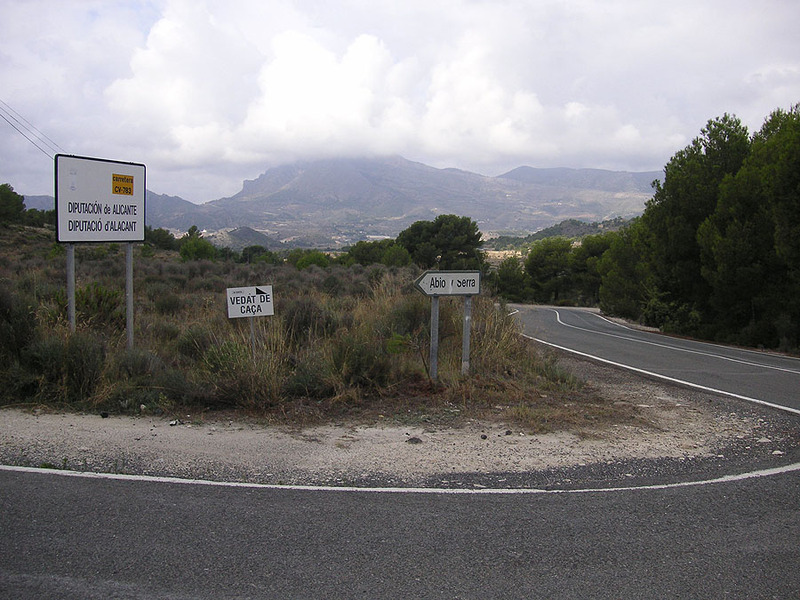 There was quite a bit of traffic on the road including huge aggregate lorries going laden one way and returning empty the other. Nonetheless there were "Partagez la Route" signs informing motorists to allow at least a 1.5m gap between themselves and cyclists when overtaking (about one metre more than most British motorists give to a cyclist!) 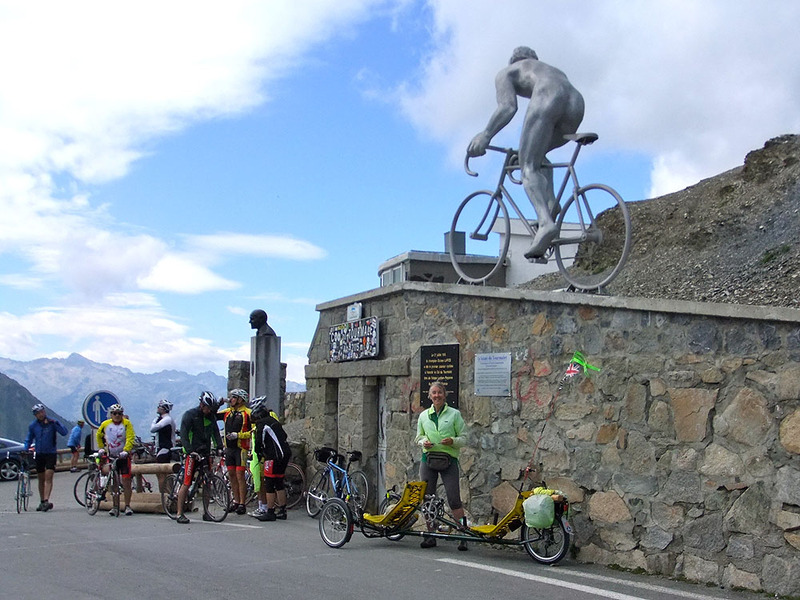 and all the traffic was very courteous to us and to the groups of serious club cyclists overtaking us, all on their way to le Tourmalet. In Luz we were warned of major road works and possible road closures most of the way to the Col, and this proved to be true. What we had not realised was that the valley suffered a serious flash flood in June, which caused flooding as far as Lourdes, and that buildings along the river’s course and even the road had sustained serious damage. The massive engineering and rock and earth moving work being carried out along the valley was partly to repair the road but also to alter the course of and strengthen the banks of the river to prevent future problems. 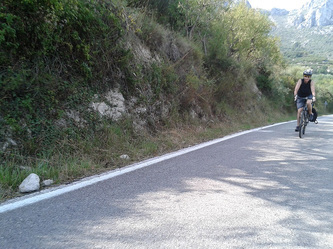 It also explained why the aggregate lorries were pounding up and down. 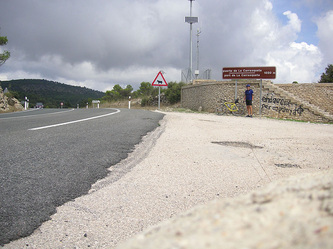 Notices at Luz warned of road closures every couple of hours through the day, but we managed to sneak through the no entry signs to start the 18 km climb proper to the Col. We were not alone as apparently other cyclists, motor cyclists and quite a few sightseeing camper vans also ignored all the signs and carried on. 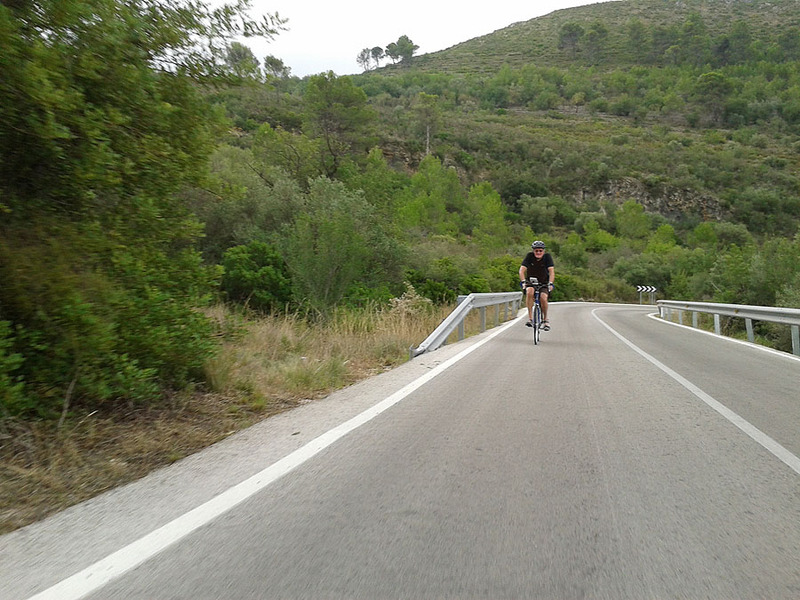 Heavy lorries and concrete mixers were driving past constantly in both directions, and frequent traffic lights, rough road surfaces and terrible potholes slowed us down. We ignored any concept of left and right on the road and picked our way between the damage and debris as best as we could. 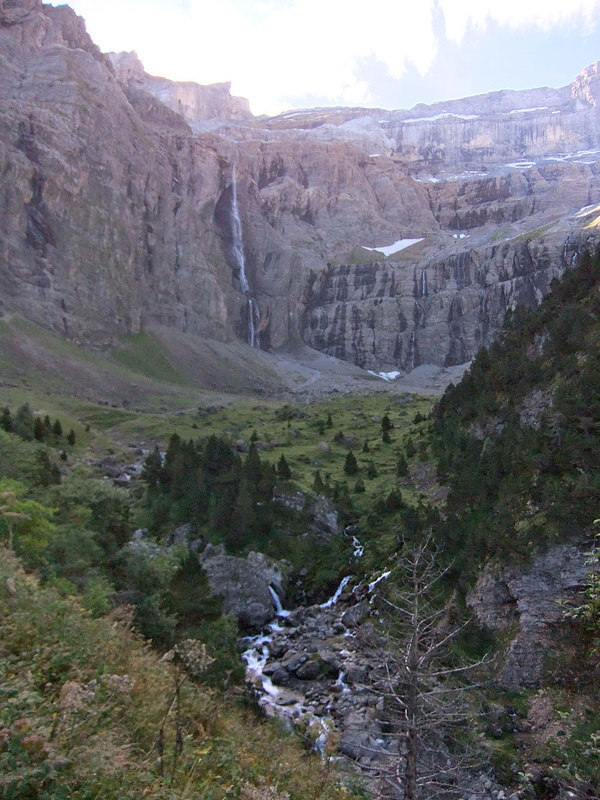 The valley scenery was spectacular, but it was impossible to ignore the remains of buildings that had been destroyed by the torrent of flood water. 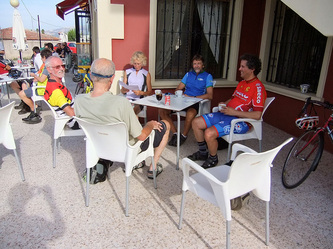 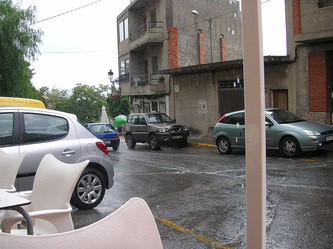 Arriving in Barèges we decided to have a brief respite with a coffee stop. Unfortunately starting off again John felt his right knee was not right after the stop, but hoped the sudden pain might go away as we got higher. 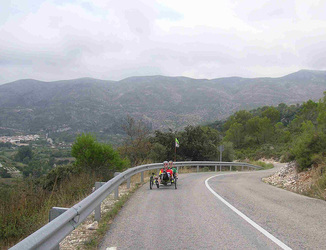 We ploughed on for a bit and finally broke free, leaving the road works behind. 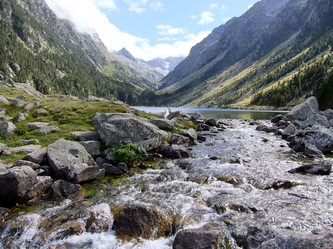 At a sustainable, albeit rather slow, pace we climbed above the tree line and out into the glorious scenery of the upper valley with large mountain tops opening up in the view. 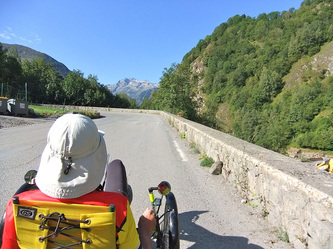 A short pause at one hairpin allowed us to take a couple of photos of "small trike" in "big mountain" scenery and grab a quick chewy-bar snack while temporarily resting our knees. Then the final push around the last hairpin bends to the top climbing at an ever steepening gradient before emerging into the wind at the top. The Col was all hustle and bustle with lots of road cyclists, many of them British and many of whom had made the climb from the far side, having their photos taken in front of the col sign and the cyclist statue nearby. 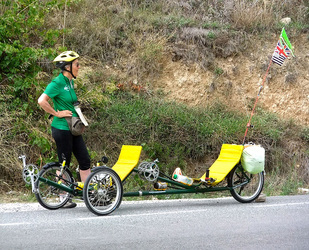 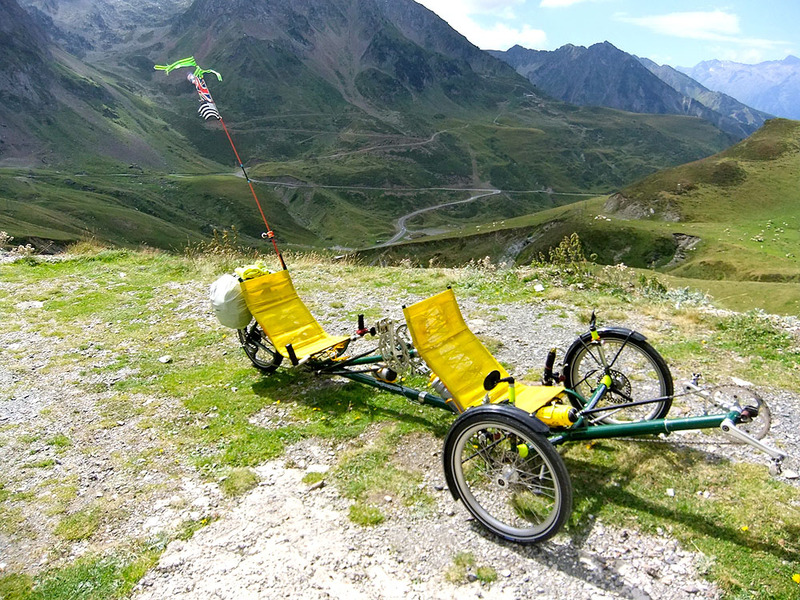 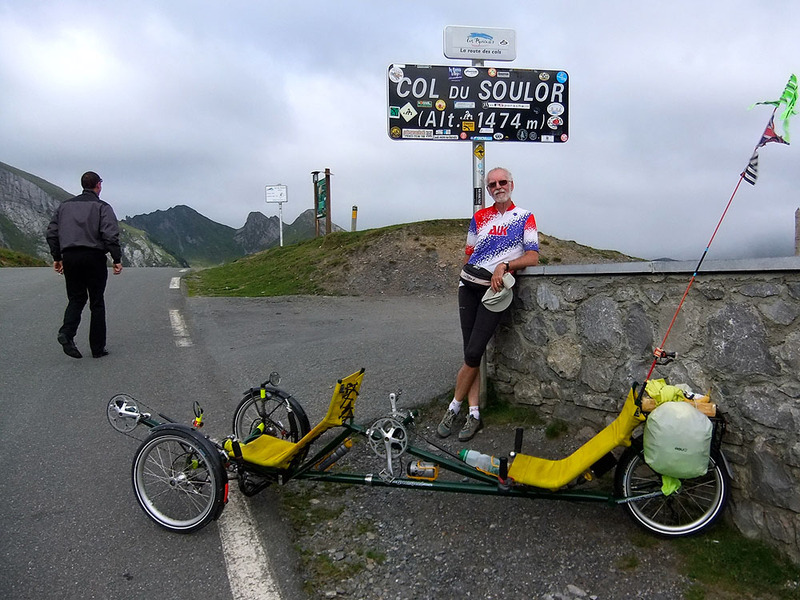 Several of them were comparing their times and we were able to announce that we had just managed a personal best (no need to mention that this was our first time up the Col) and for all we knew had set an all time record for a green recumbent tandem trike piloted by pensioners. 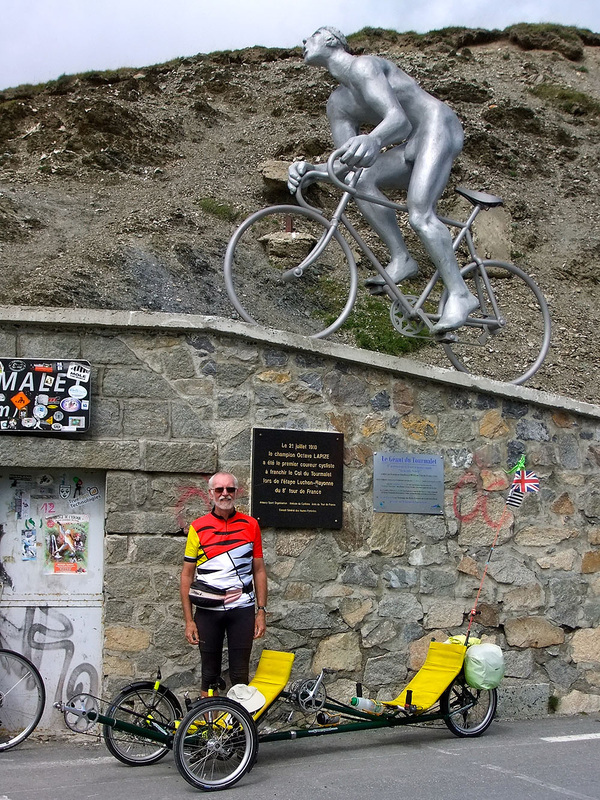 We queued up for our photographic turn in front of the Col sign and then headed for the gift shop (no socks for Sheila but she consoled herself by buying a Tourmalet cap instead). And then out of the wind and into the café. We didn’t fancy anything major to eat, but managed a coffee and a crêpe before putting on most of the extra clothes that we had in the panniers, including gloves and buff, and launching ourselves downwards to descend again. 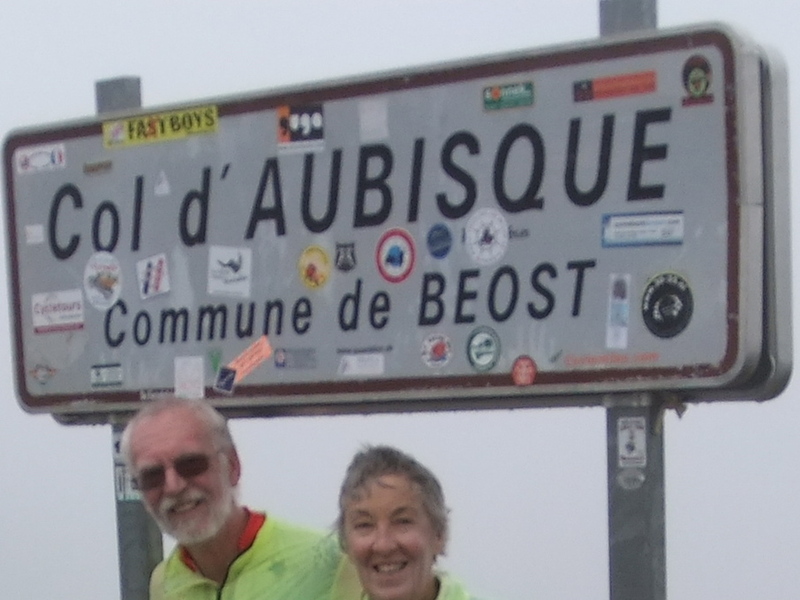 Because of the air temperature descending was very cold - Sheila’s teeth were chattering and John’s fingers were numb before the air gradually warmed as we lost altitude. Left to itself without some heavy braking on both front disc brakes the weight of the trike would mean dropping like the proverbial brick off a cliff. 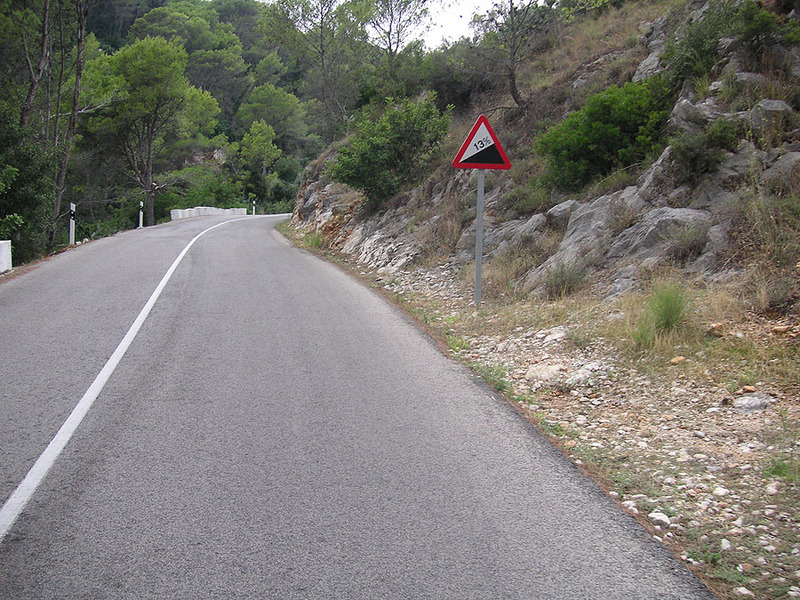 With braking it is a bit like free-fall parachuting with corners. The final run down through all of the roadworks was much like coming up, but gravity was on our side this time and the slightly squealing brakes were better than a horn for clearing a way ahead. 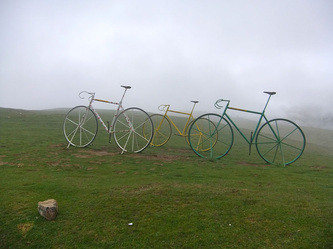 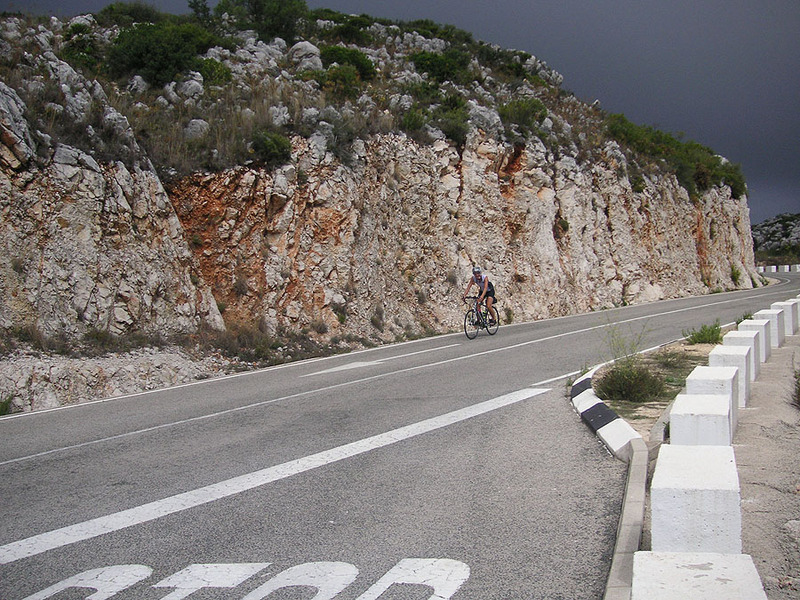 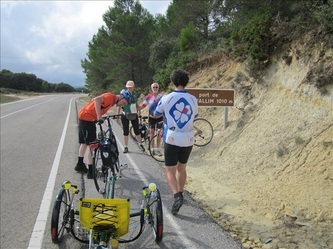 As we came through the last roadworks barrier outside Luz at about 3.30 p.m. we found three disconsolate British cyclists who had been told they could not go up till 6pm and were phoning their companions who had just got through ahead of them and had managed to start the climb. 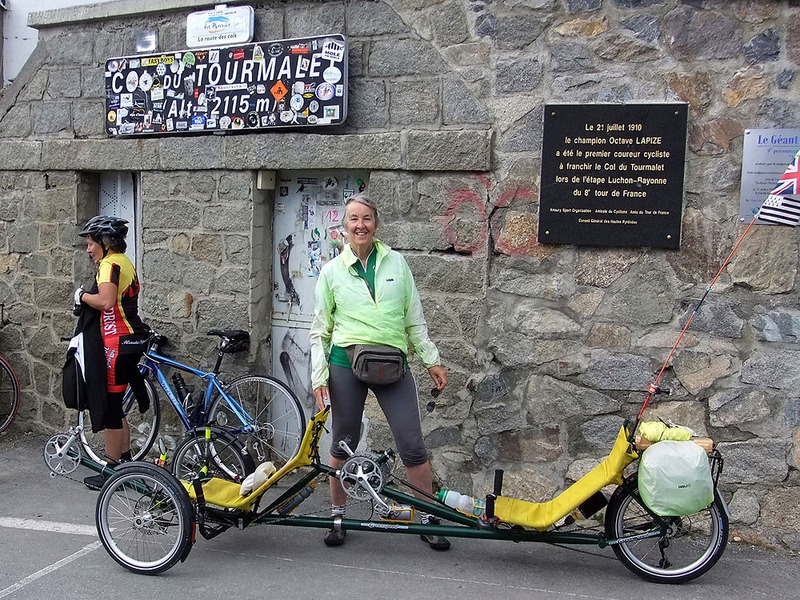 We met them shortly afterwards in a Luz café and they told us they were touring and would have to go on later and descend in the dark to get to their hotel on the far side of the Col. 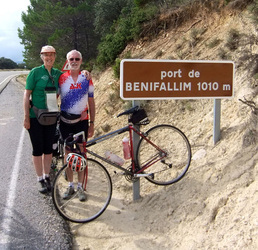 The final return trip along the railway cycleway was a gentle freewheel almost all the way to our hotel entrance. 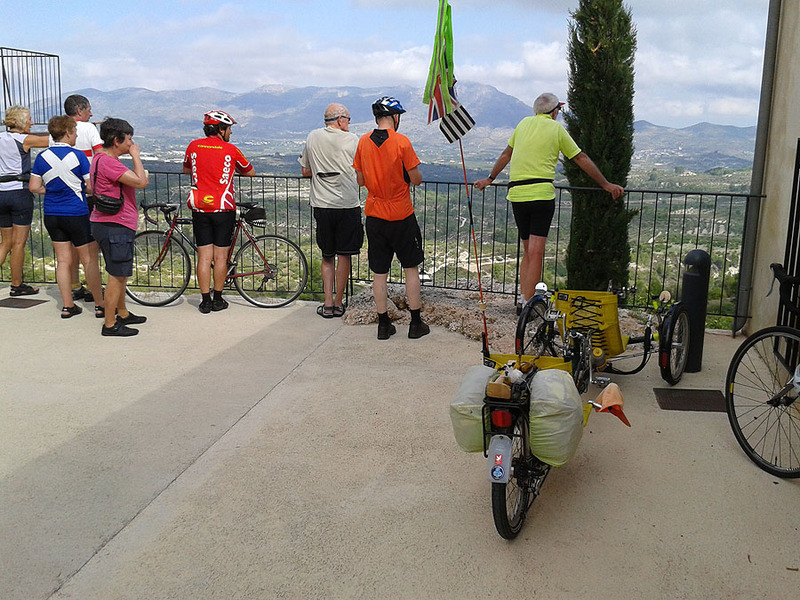 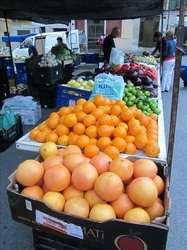 Must also mention the number of people who took photos of the trike, through car windscreens, from the roadside, across the valley…..
Next day we decided on a rest day and spent the morning strolling around the very extensive Tuesday morning market in Argelès Gazost. We then drove to the spa town of Cauterets for a good lunch and then on to the spectacular and popular Pont d’Espagne, with great waterfalls, before walking up a short way to take the chair lift up the mountain for a 20 minute stroll to the Lac de Gaube, where we had a coffee with wonderful views of the Vignemale (3298m) the highest French summit in the Pyrenees. 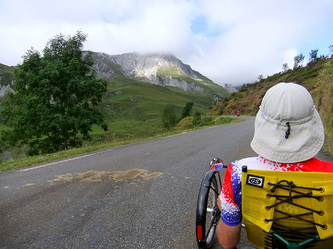 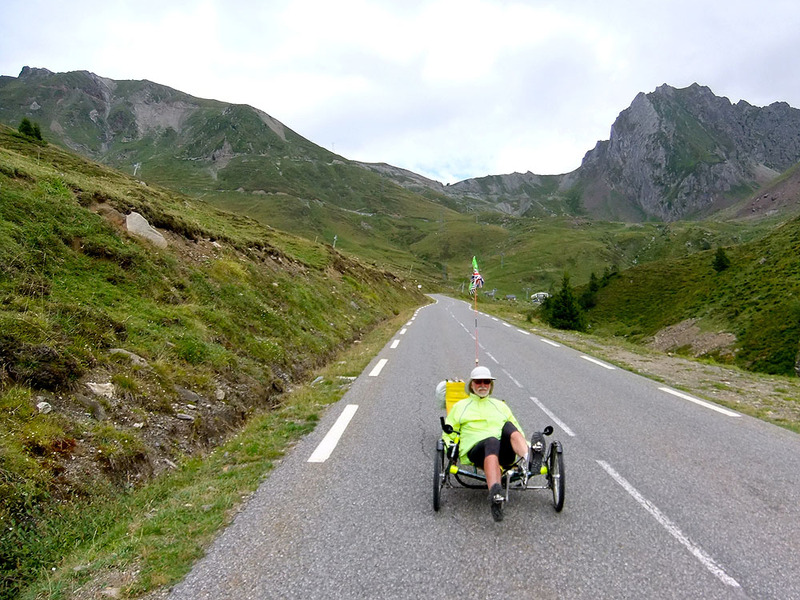 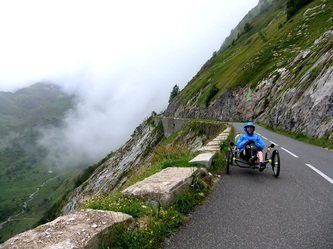 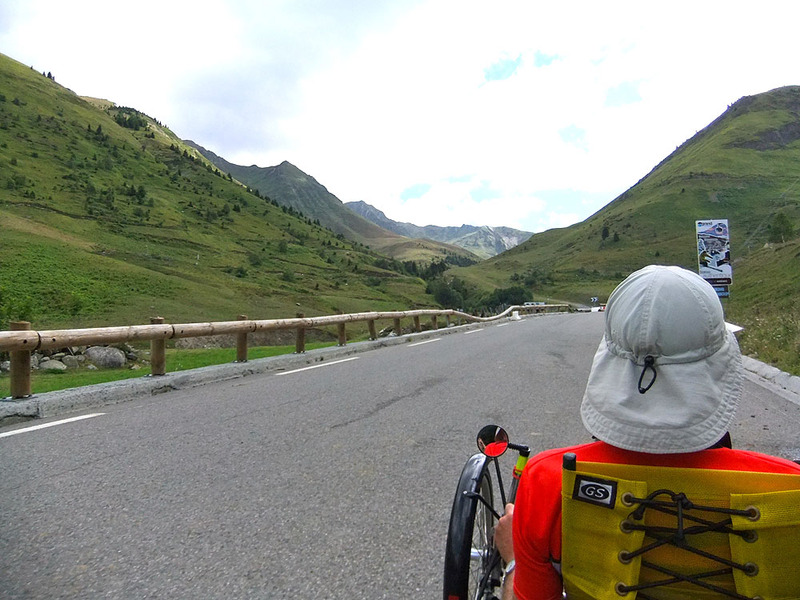 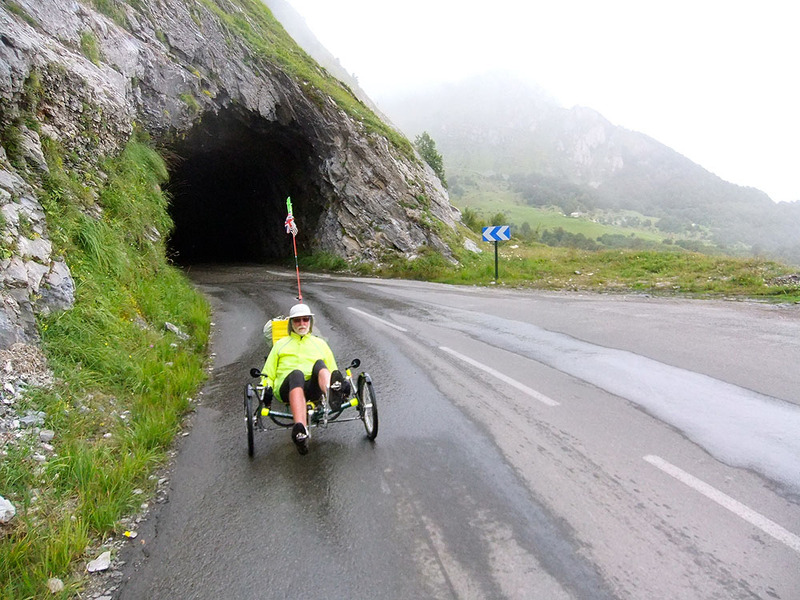 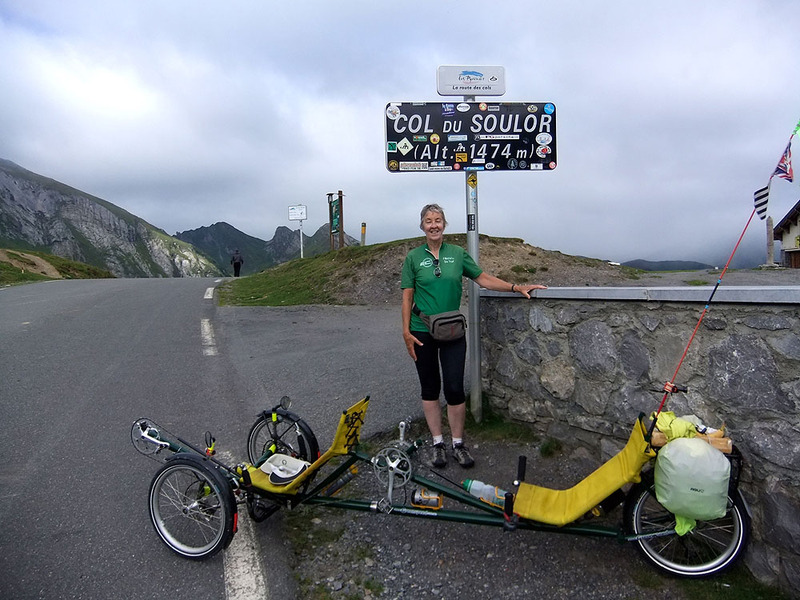 Feeling restored and with a good forecast for the Wednesday morning at least, we decided to make the ascent of the Col d’Aubisque a little easier by driving with the trike to Arrens, cutting out the lumpy and rather busy road between Argelès Gazost and Arrens. 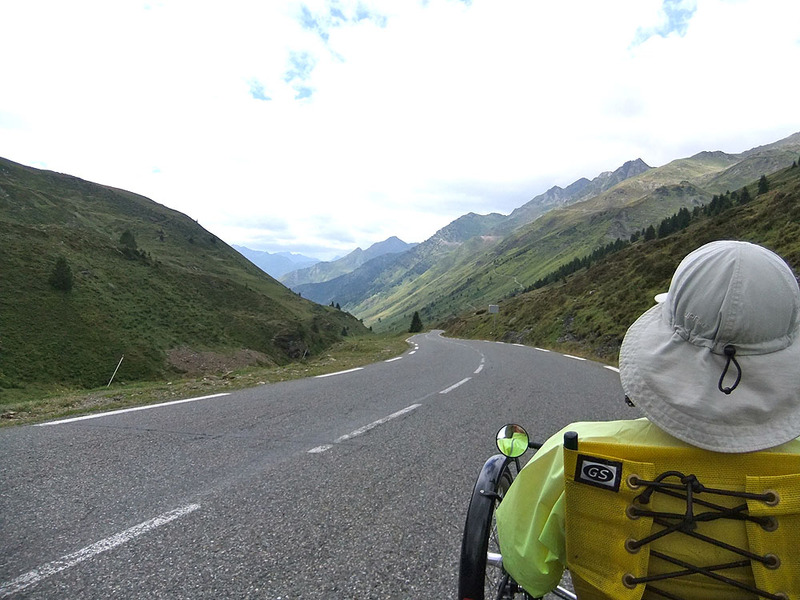 The only draw back to this was that it meant an almost immediate start to the ascent and with no warm up we turned the corner at the end of the village of Arrens straight into our first hairpin bend. We gained height quickly by a continuing series of hairpins and some steep gradients stepping up the mountainside . Very soon Arrens was way below us. 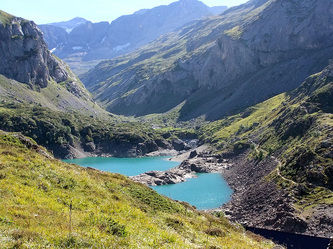 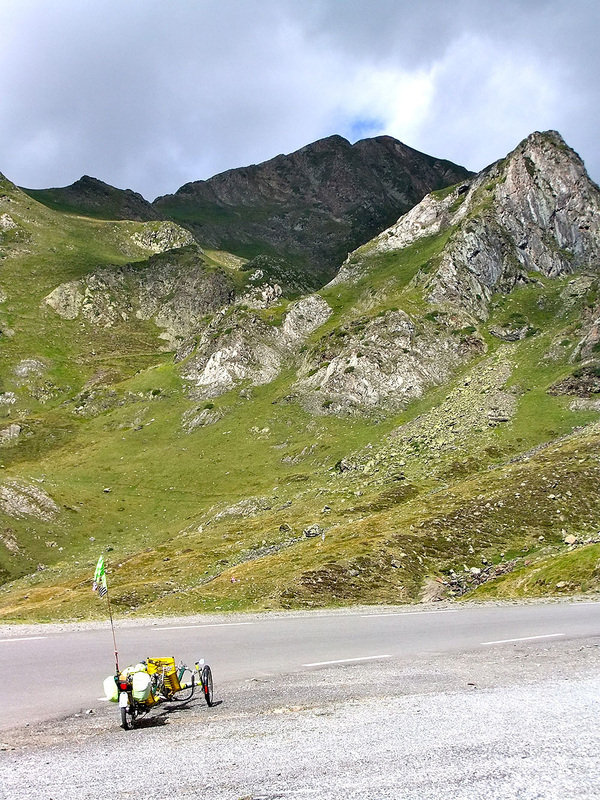 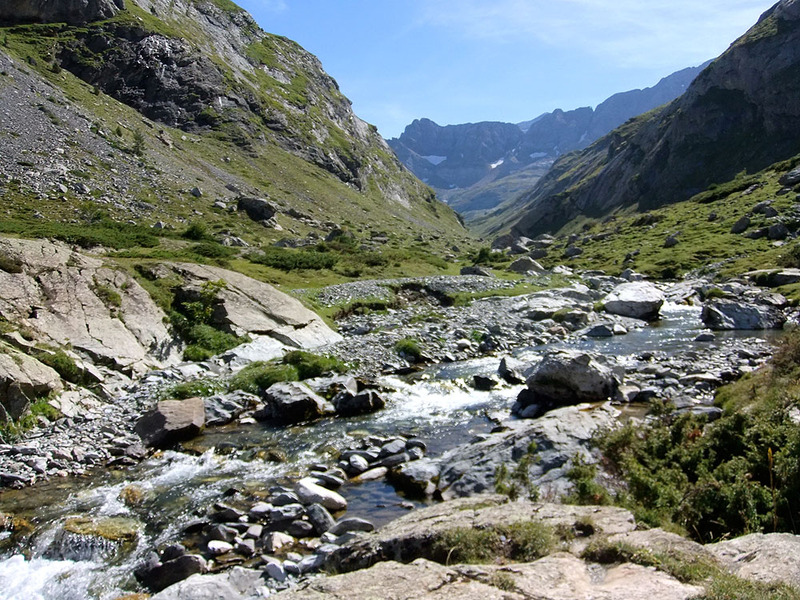 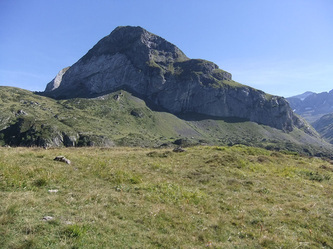 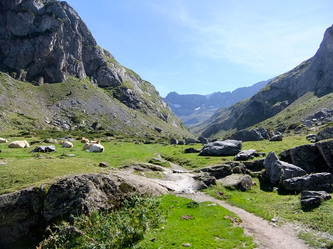 The terrain was very different from the Tourmalet ascent – rounded green hills instead of grey crags. 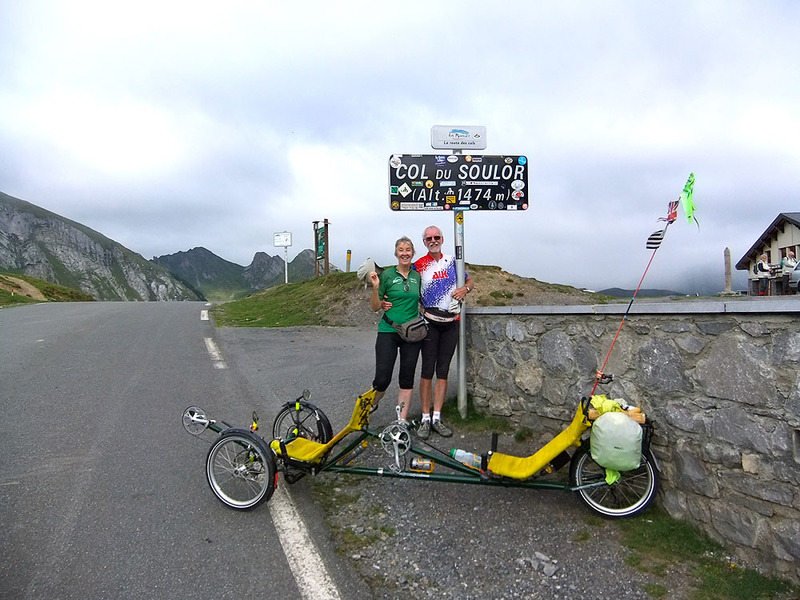 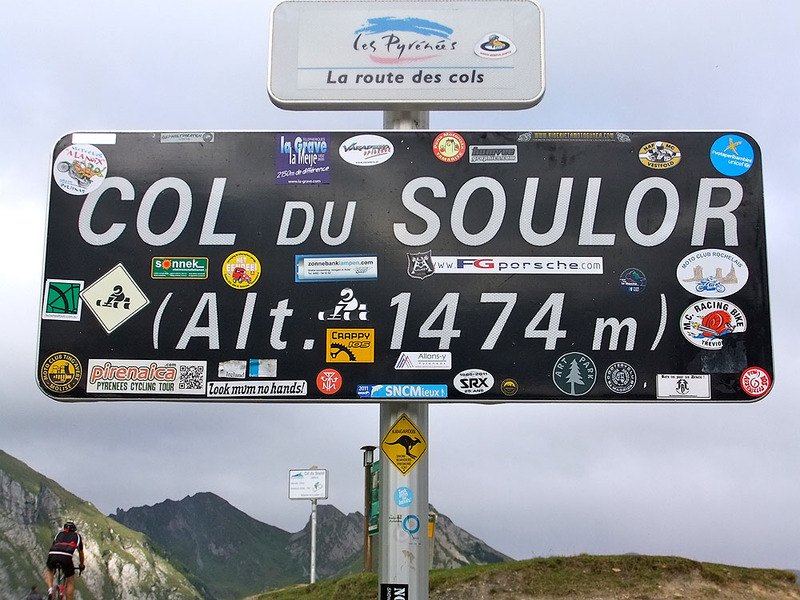 We reached the Col de Soulor after encountering a brave British cyclist who was cycle-camping with heavy panniers fore and aft and tacking slowly across the road from side to side. 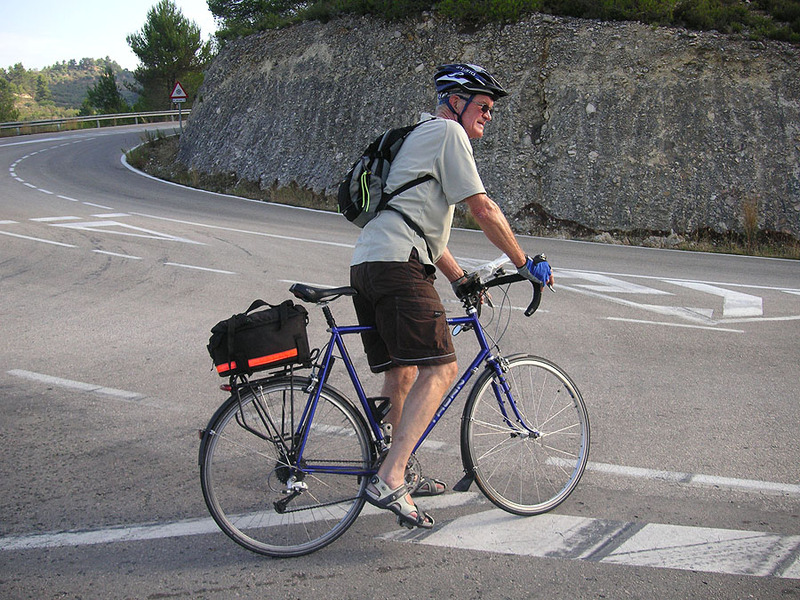 We had to admit that we had finally found a cyclist on a mountain road going slower than us and with a heavier load. When he reached us at the Col we took the usual photos by the Col sign but decided not to stop for coffee with him and to press on to the Col d’Aubisque for refreshment. A short but rather discouraging downhill (applauded by a coachload of French pensions taking a short stroll from their coach parked at the top of the Col) led to a long and fairly level balcony road with great views round the valley-side, which John recognised as a classic Tour de France photograph (also regularly featured in Tour de France TV coverage) of the peloton sweeping along clinging to the mountainside with a sheer drop beside them. 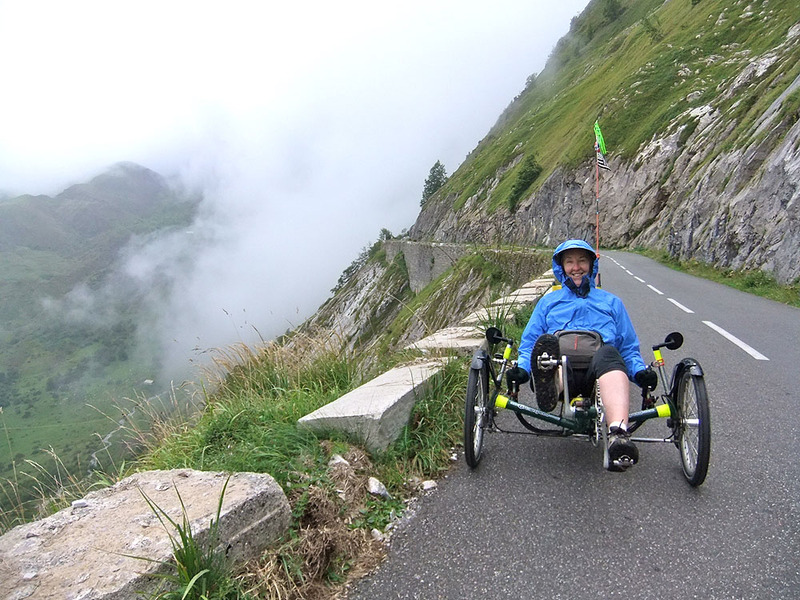 The clouds started to descend and indeed it was almost fine rain by the time the climb began after a rather dark (Trike lights on), damp but happily short tunnel. 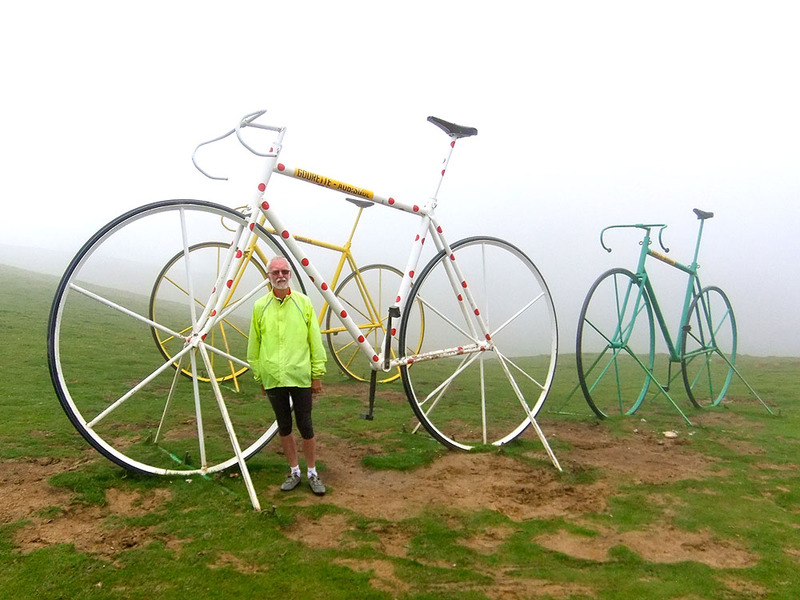 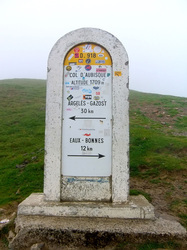 But the climb was less severe than we expected and soon we reached the top of the Col d’Aubisque. Still no socks in the gift shop, which we visited after the usual photos, and (with some restraining from John) Sheila resisted the wolf-whistling marmot key rings, but settled instead for a welcome omelette as early lunch. 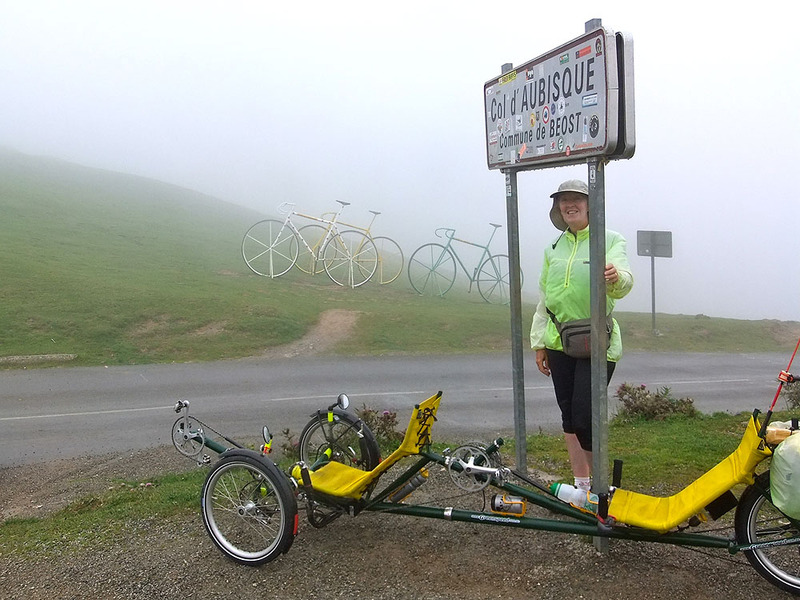 Setting off descending in the cloud and around the balcony we then climbed again back up to the Col de Soulor, where the weather was better. 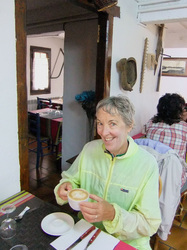 Time for more fuel so we stopped this time for coffee and in Sheila’s case a gigantic myrtille waffle. 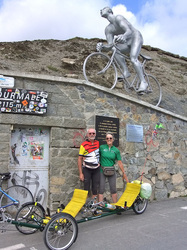 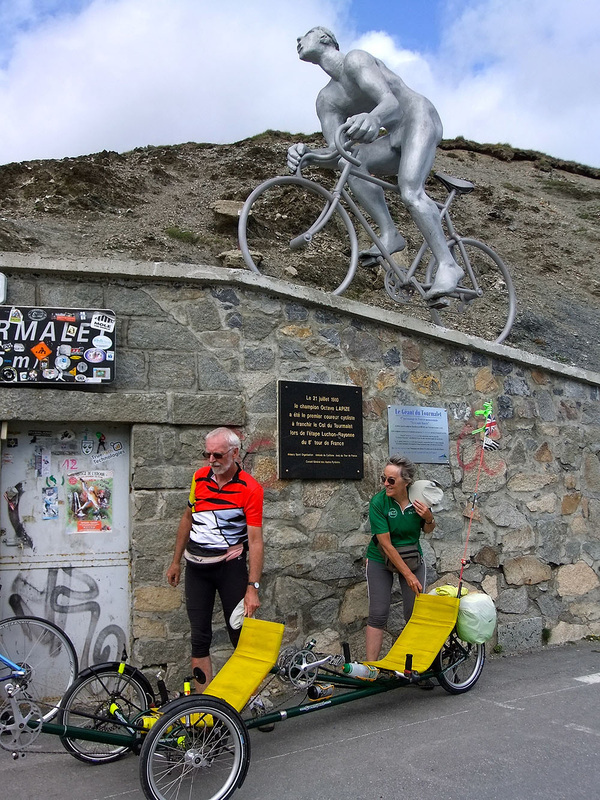 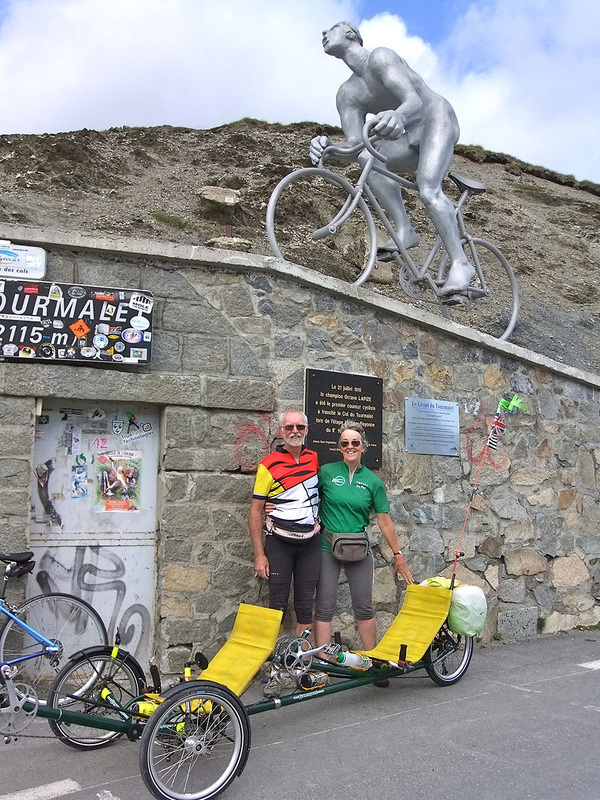 Some Dutch cyclists in the café commented on having seen us at the top of the Tourmalet and seemed quite bemused by the trike. The final fast descent took as back into warm sunshine and was incident-free apart from flocks of sheep blocking the road. But being New Forest residents we are well use to cycling between free roaming animals - and unlike at home some of these even had bells on, clanking as a warning. Our last day in Argelès Gazost was excellent weather so we drove to Gavarnie near to the Cirque de Gavarnie, a UNESCO World Heritage Site and walked for about an hour to the little hotel immediately facing the cirque, which has a quite stupendous view. 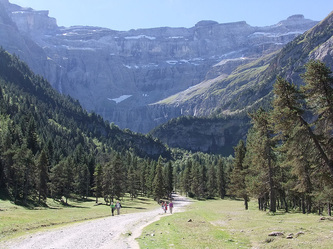 Many people, mainly French and quite elderly, were better shod than us in our sandals and continued the walk to the foot of the waterfall, said to be the tallest in Europe. 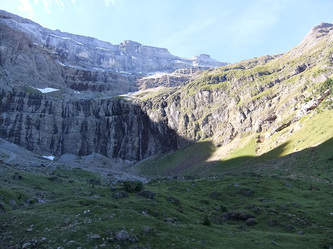 After a pleasant lunch in Gavarnie we drove, in first or second gear, up a steep and many hairpinned and very narrow (with nothing much in the way of passing places) road towards another of the three cirques in the area, the Cirque d’Estaube, which can be viewed from the Lac de Gloriettes, created by a large dam. 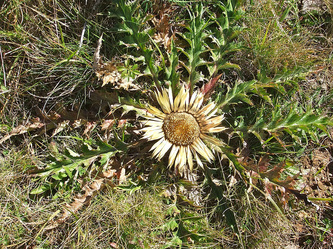 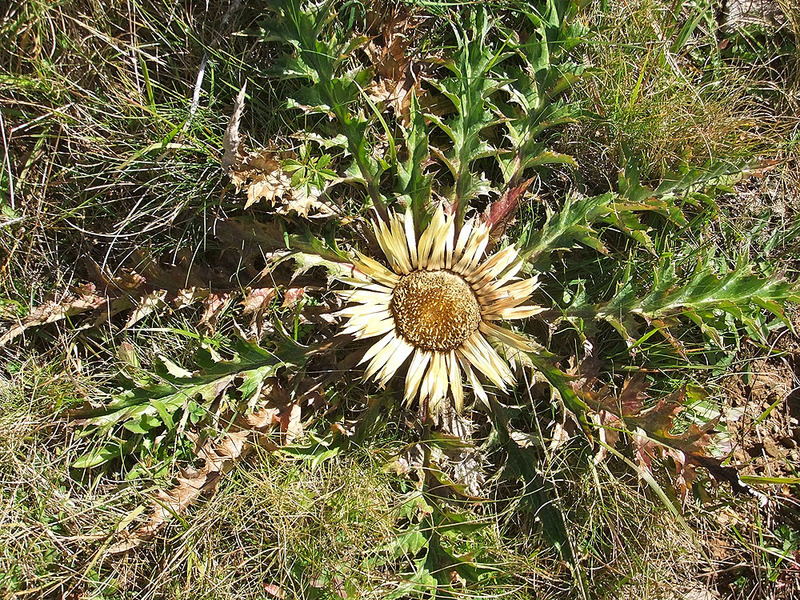 Here we took a short walk to admire the scenery and wild flowers, but decided to turn back when we had gone as far as we dared without having slightly more suitable footwear for mountain walking. 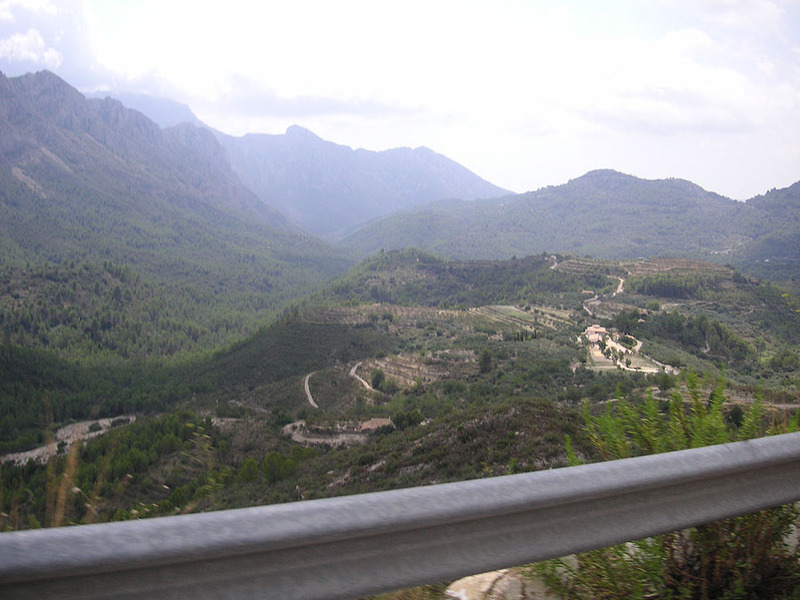 We came back down the mountain lane, again in first or second gear. Next morning we left early for La Rochelle where we arrived in time to explore the delightful old town with its many arcaded streets and to book supper in a little restaurant which provided a good value meal. The final stage on Saturday to Ouistreham left us time for tea at the Pegasus Bridge café and a chance to reminisce about the times we had passed it on the trike. 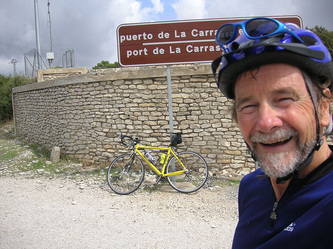 Then a good supper at the port before boarding the ferry for the overnight crossing to Portsmouth. 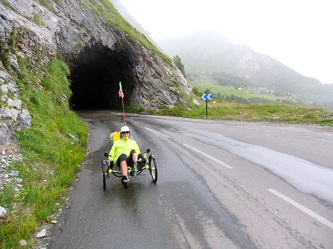 Getting home by 8am next morning gave Sheila a head start on the washing as it was an excellent drying day. 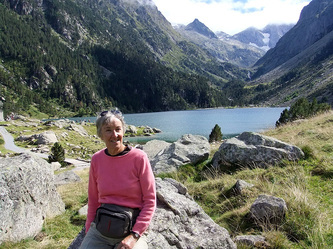 But she commented that she still had ‘faraway eyes’ because of the fabulous mountain scenery we had enjoyed in the Pyrenees. 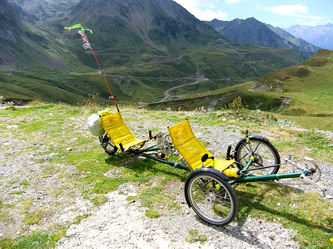 to be a welcome home again present and tour souvenir - better than a whistling marmot!